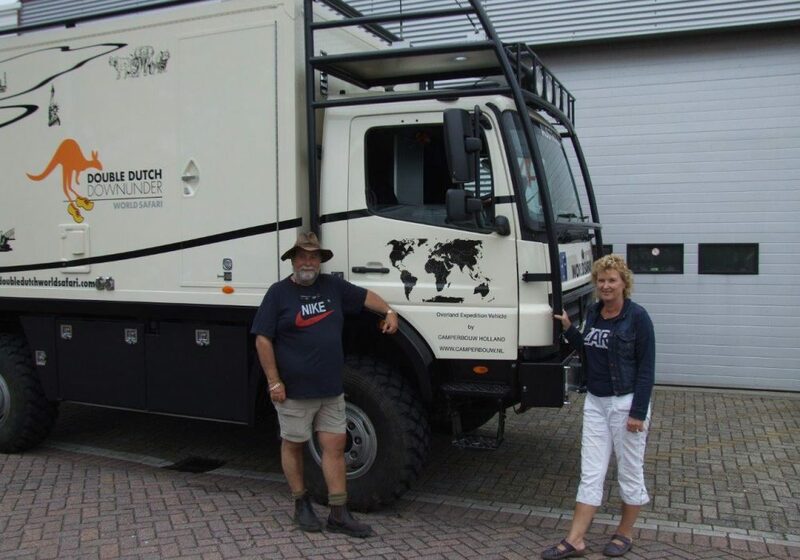 After traveling 4 years and 160000Km in our Mitsubishi Fuso FG 84 we decided to upgrade to a larger truck. 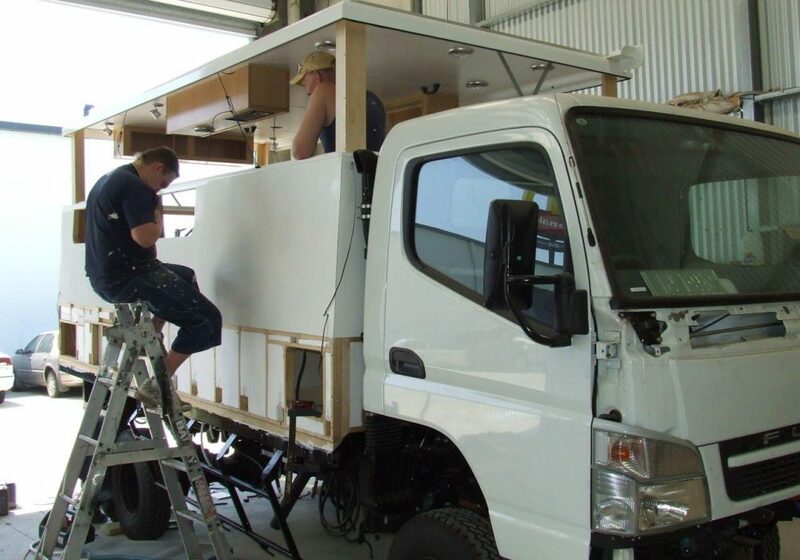 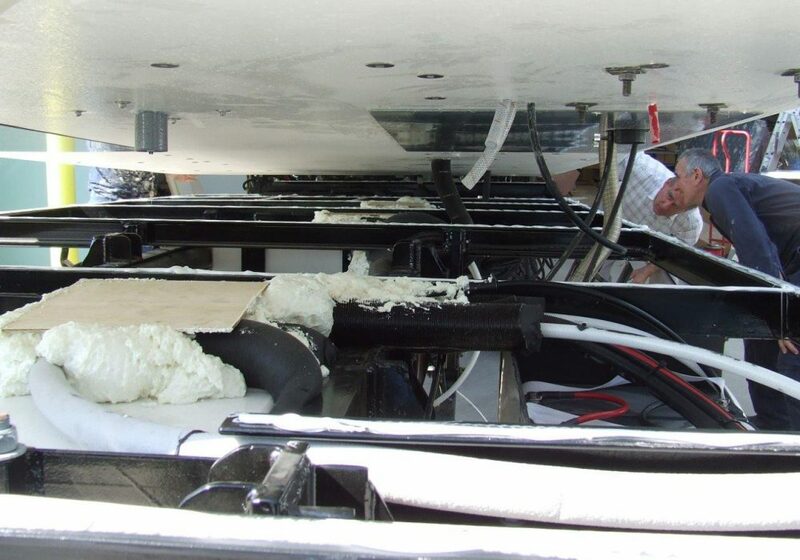 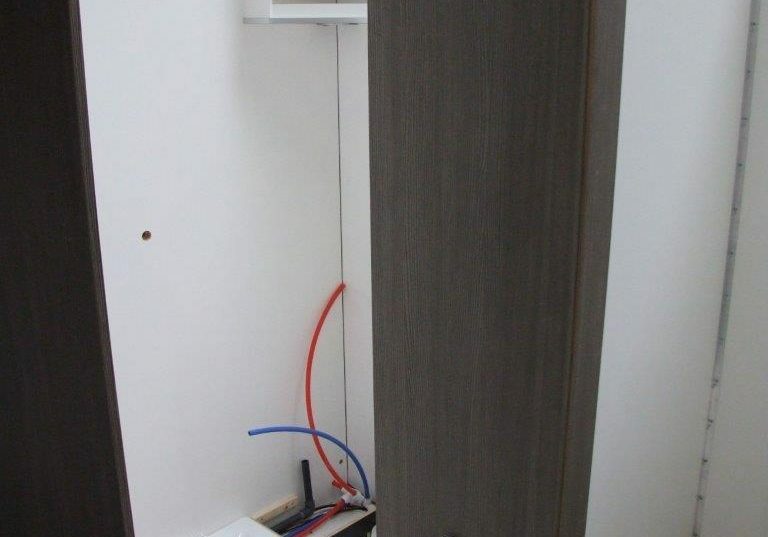 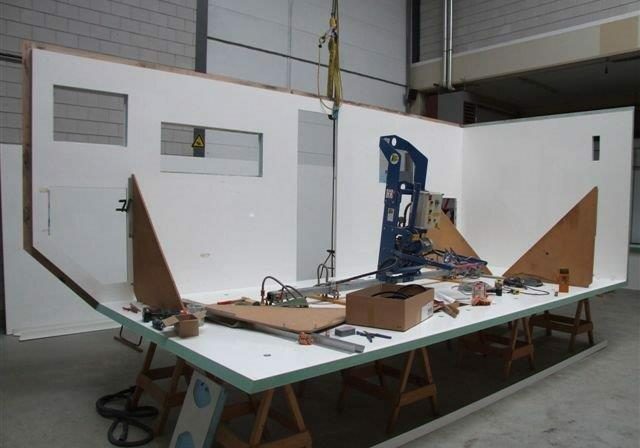 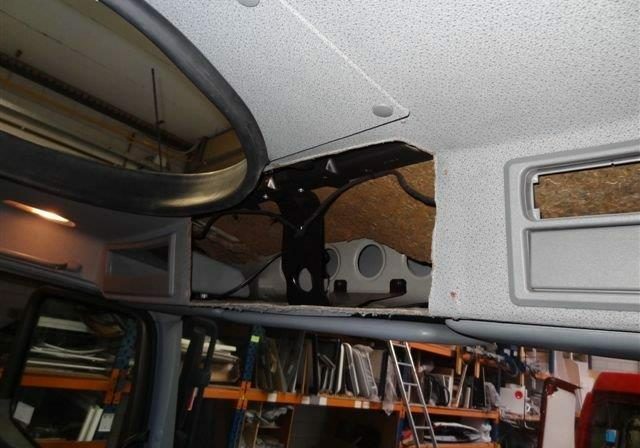 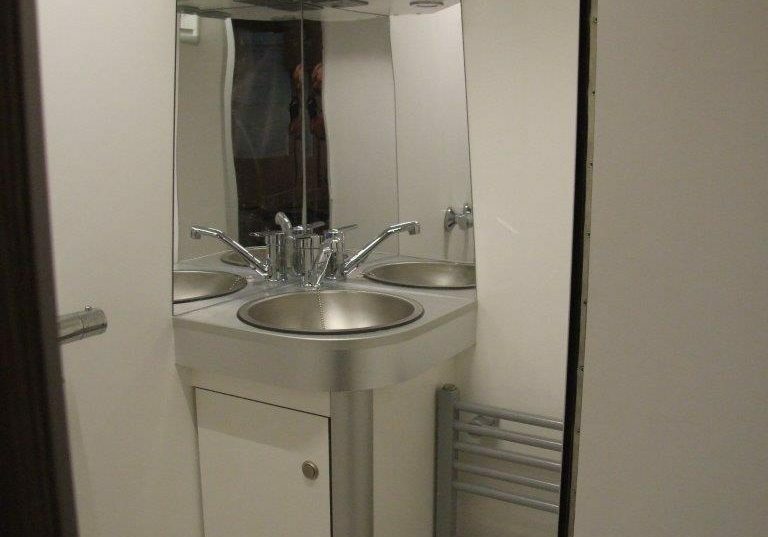 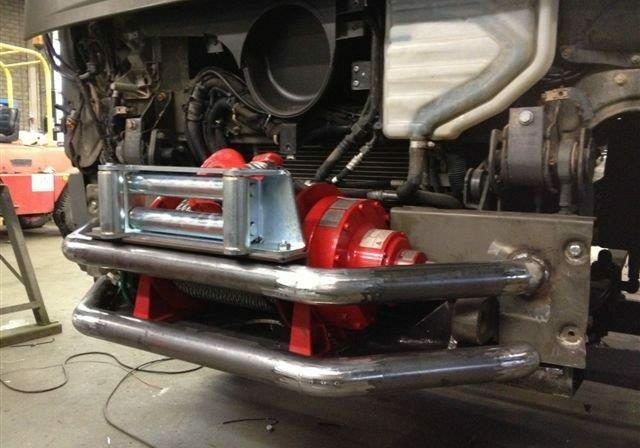 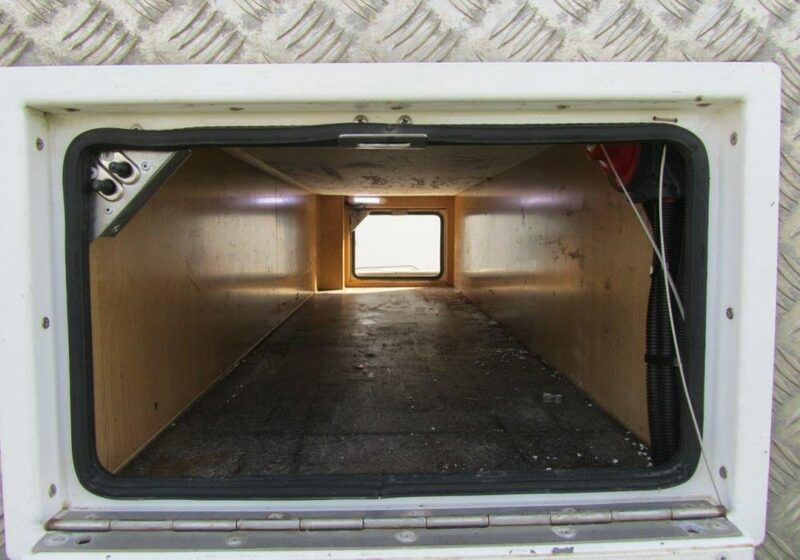 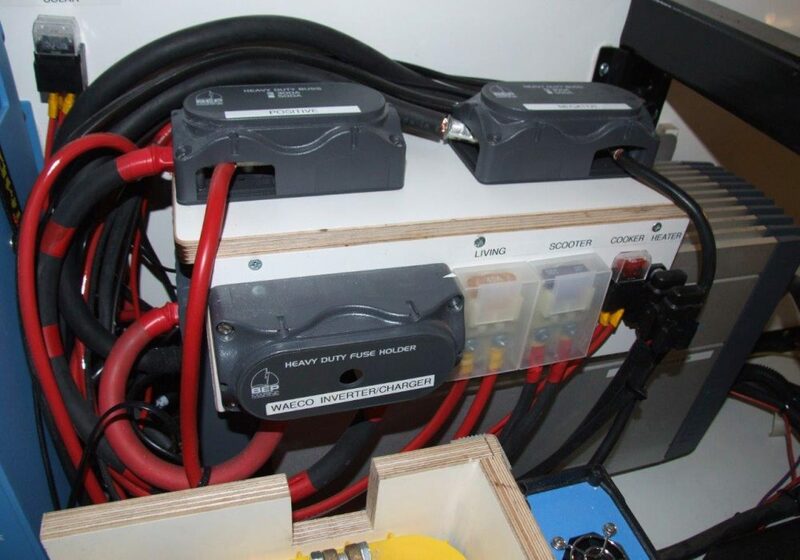 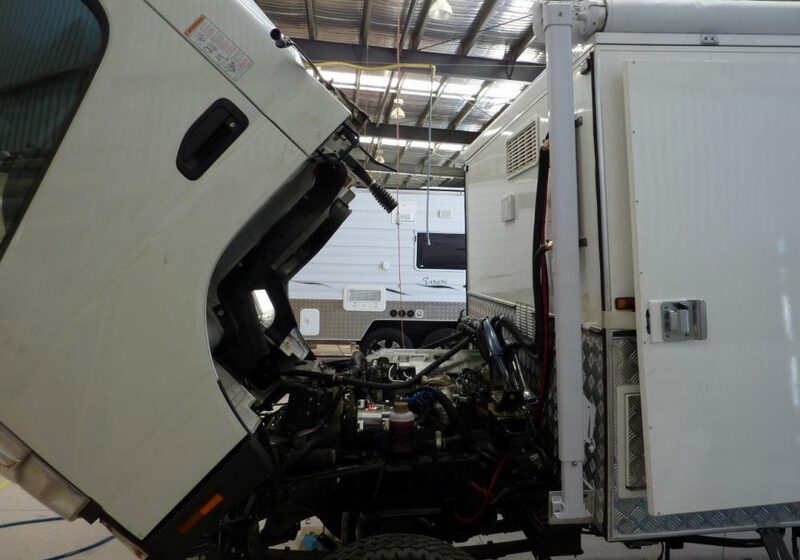 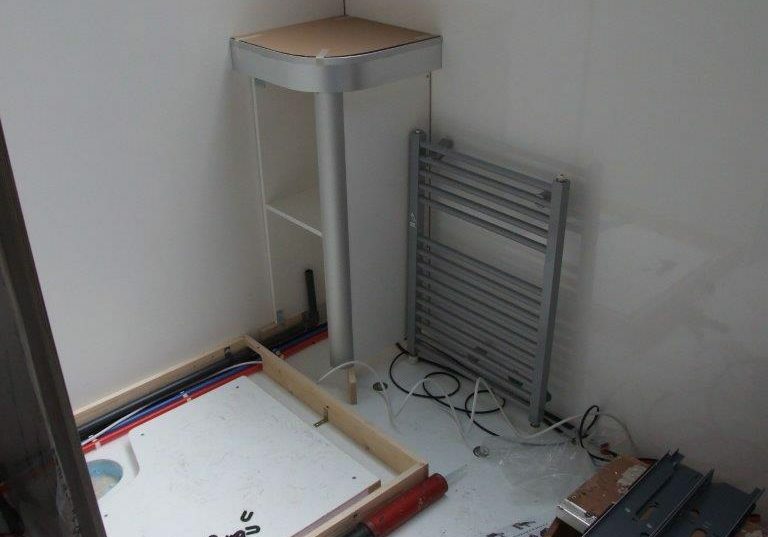 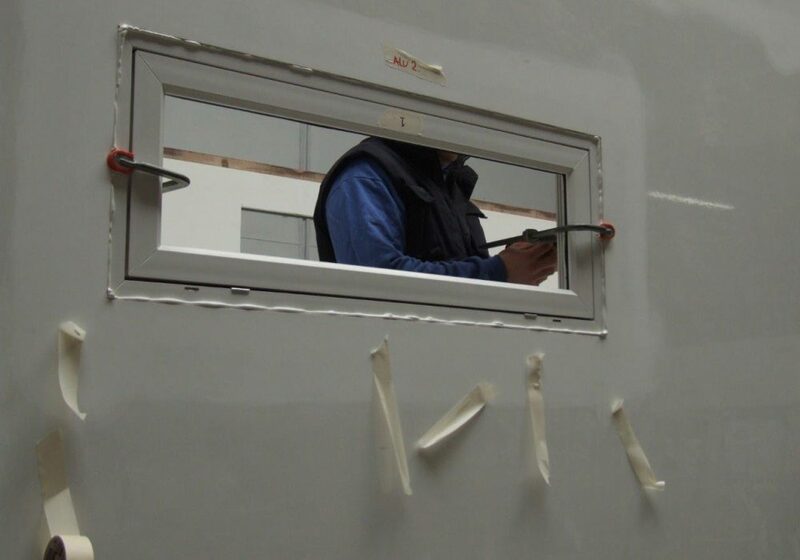 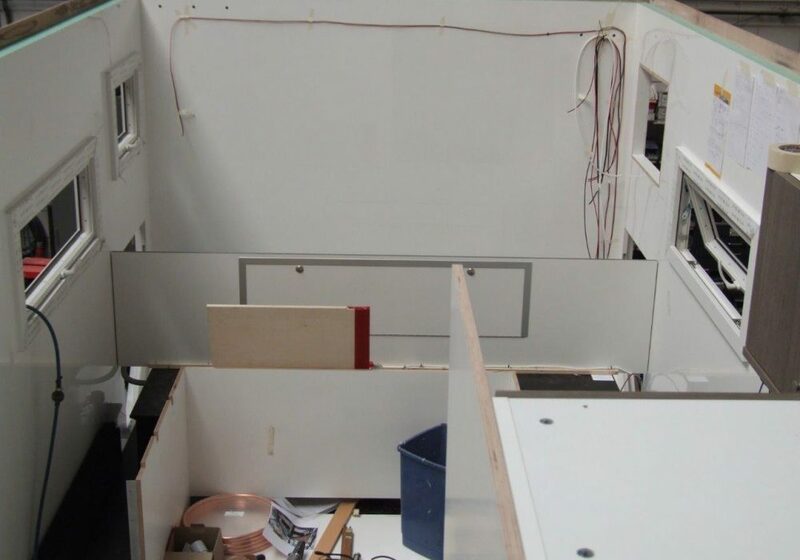 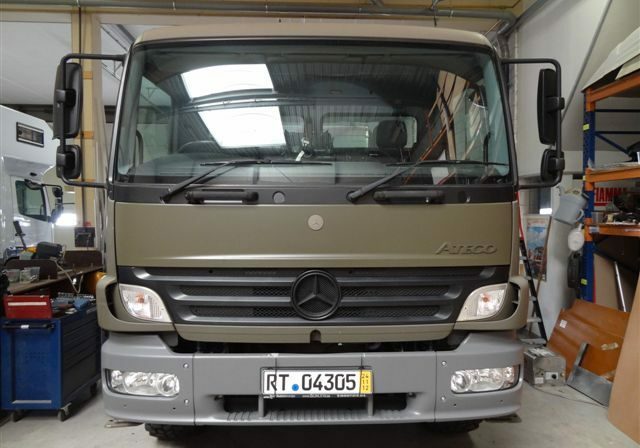 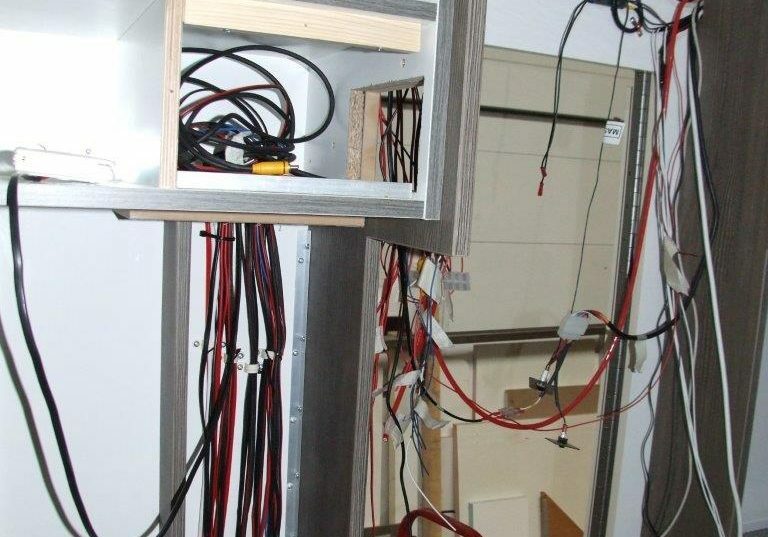 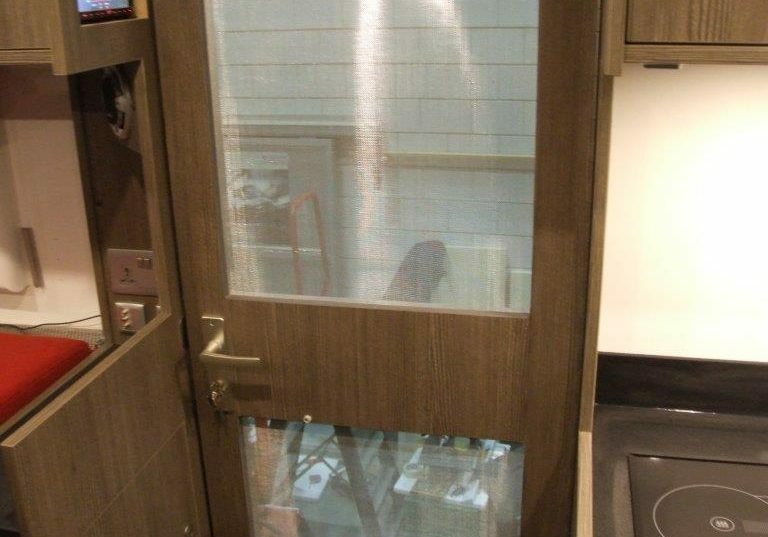 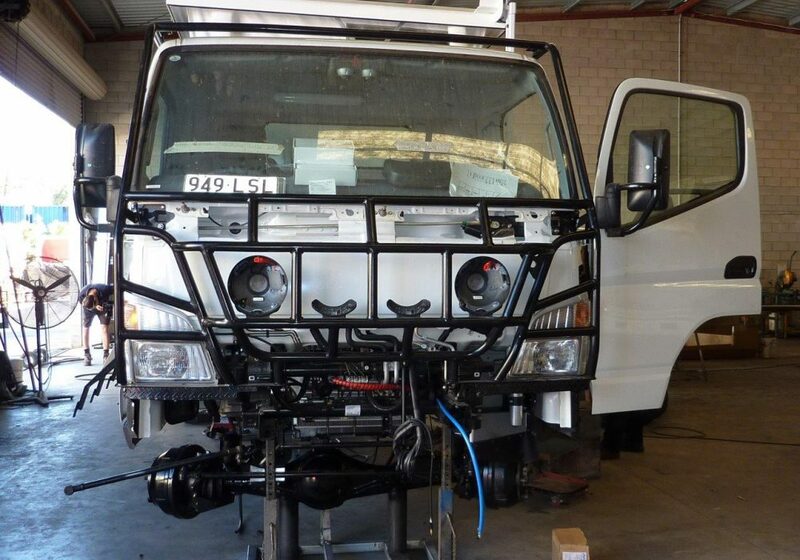 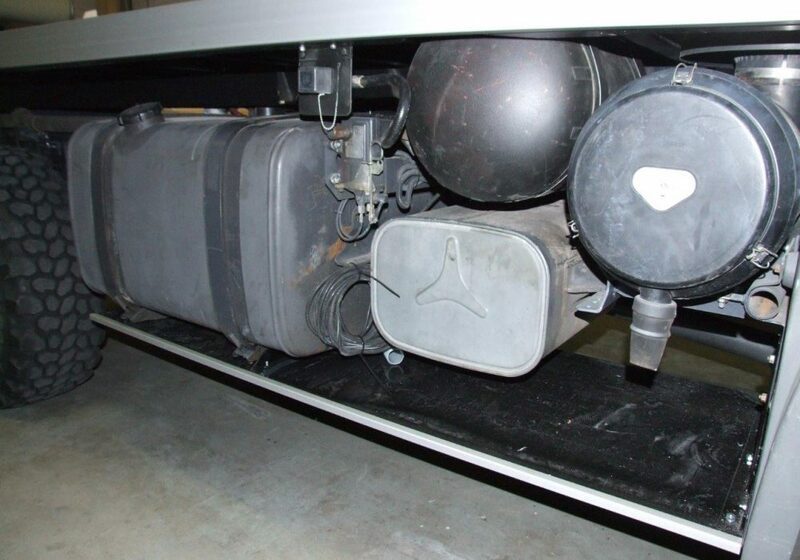 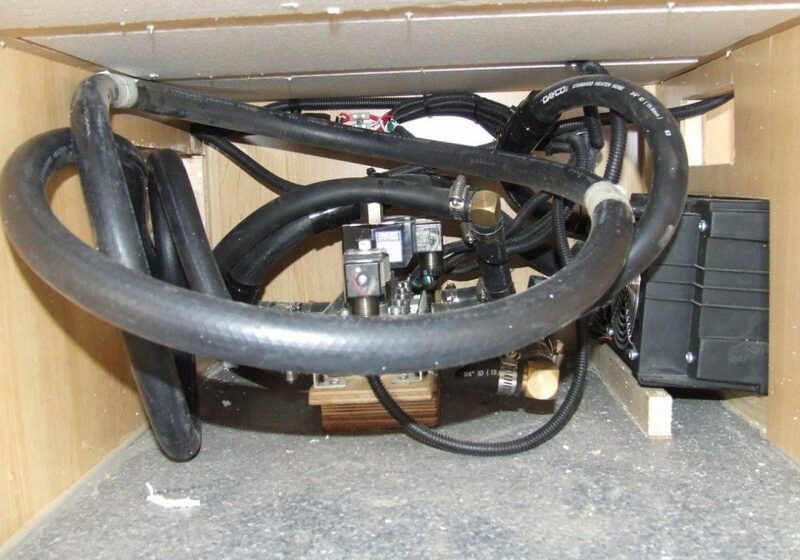 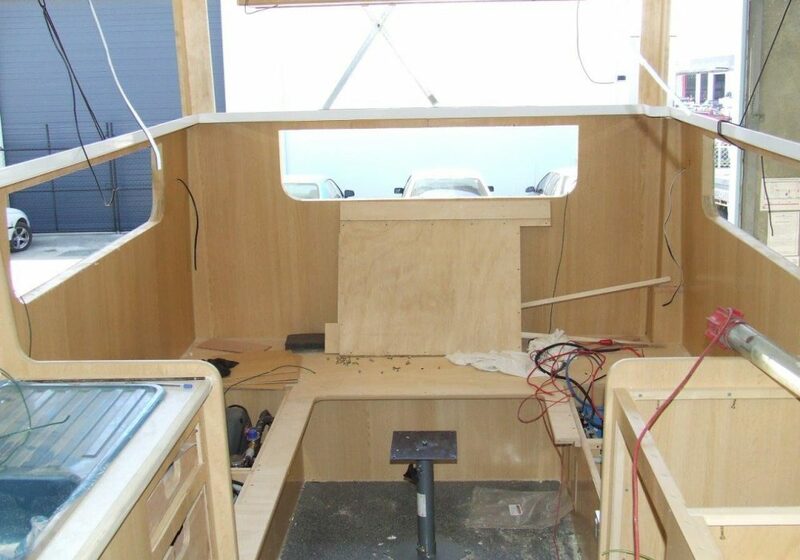 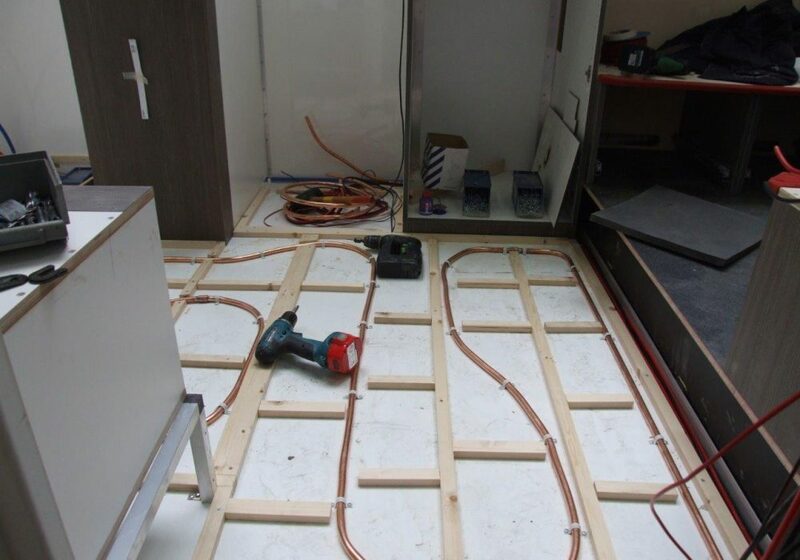 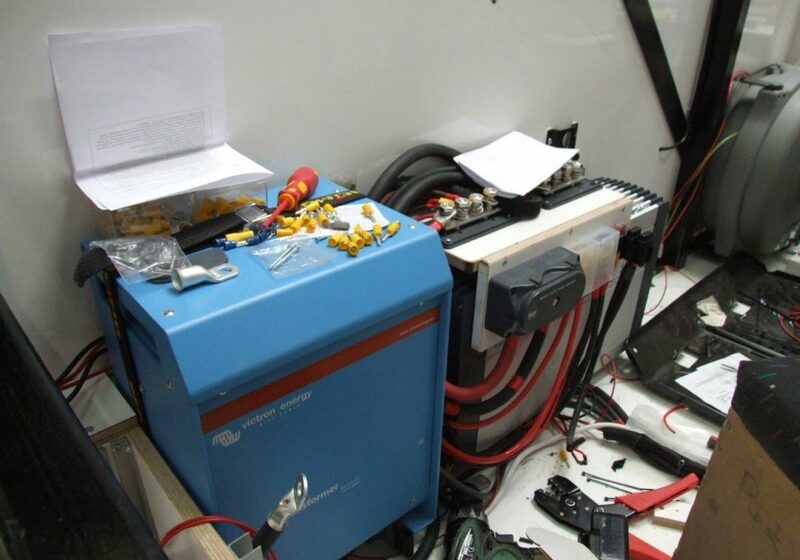 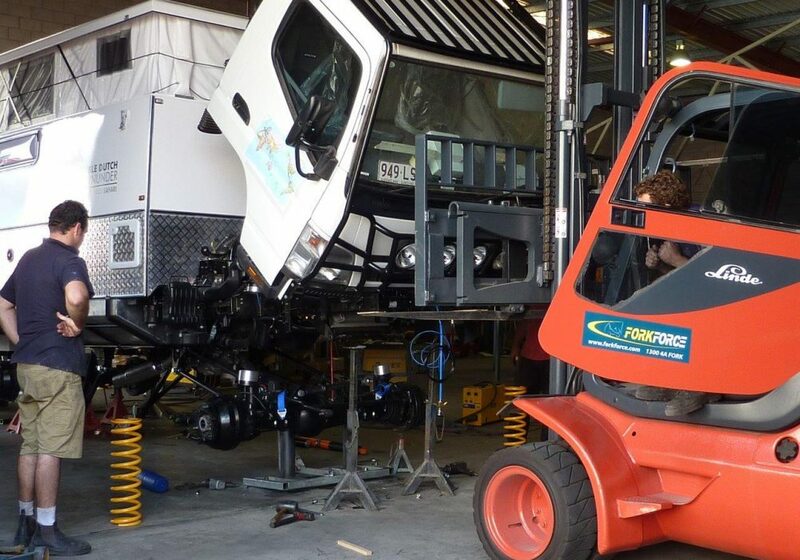 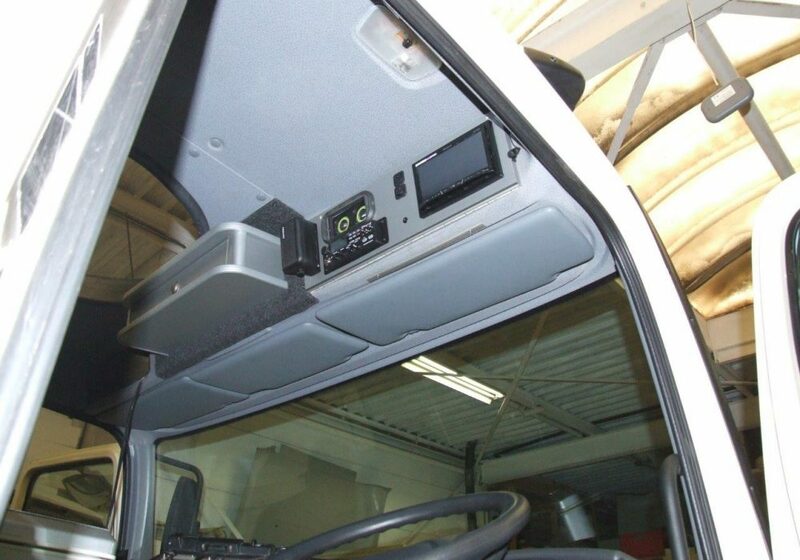 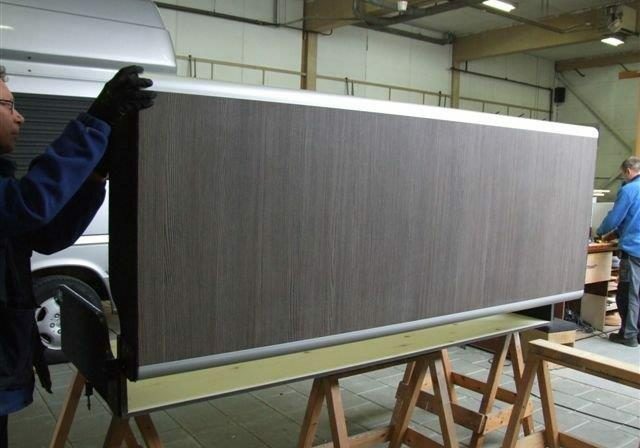 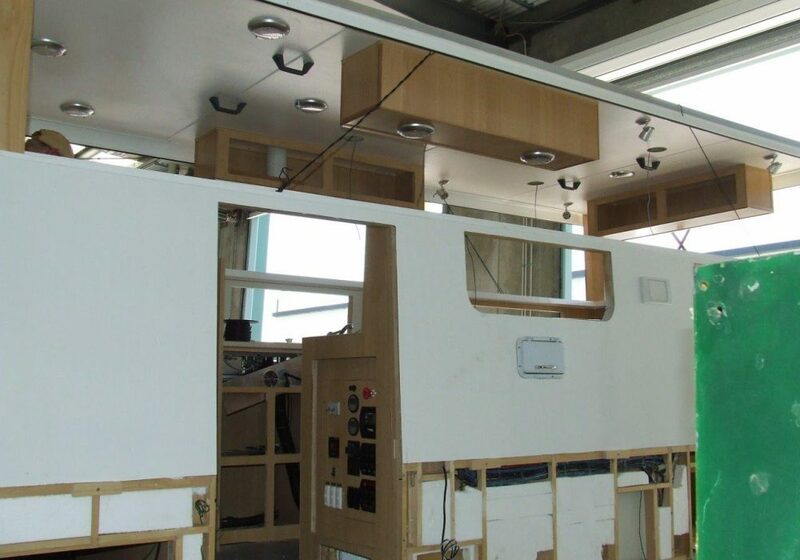 It became 6 months of looking and assessing before we decided on a Mercedes Atego. 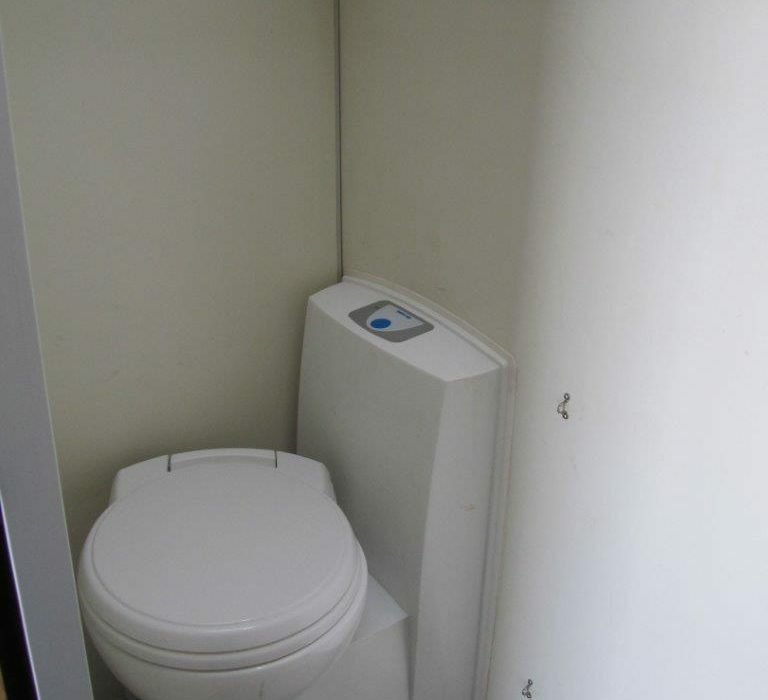 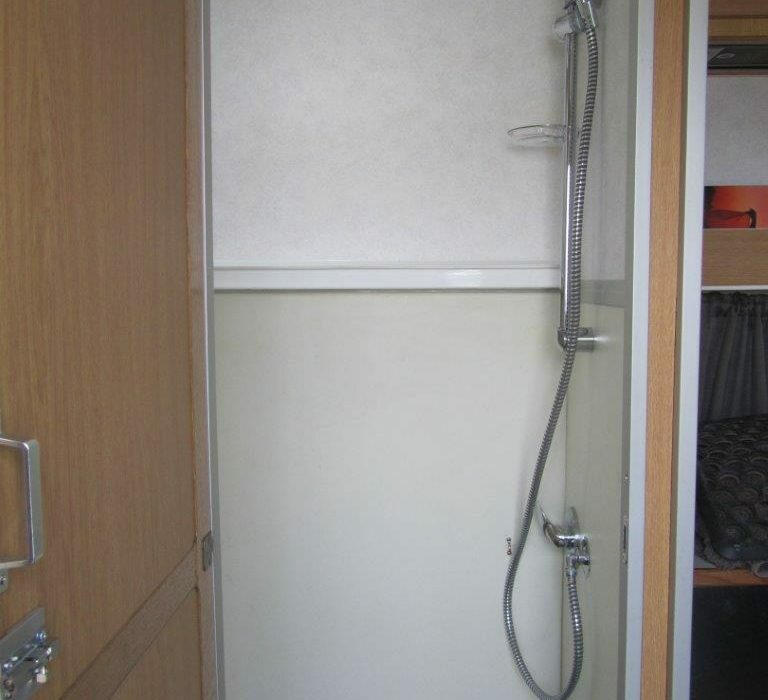 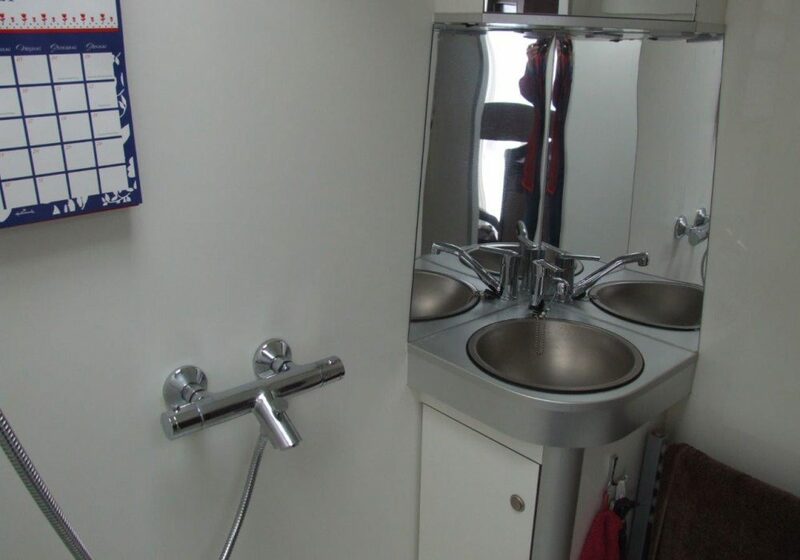 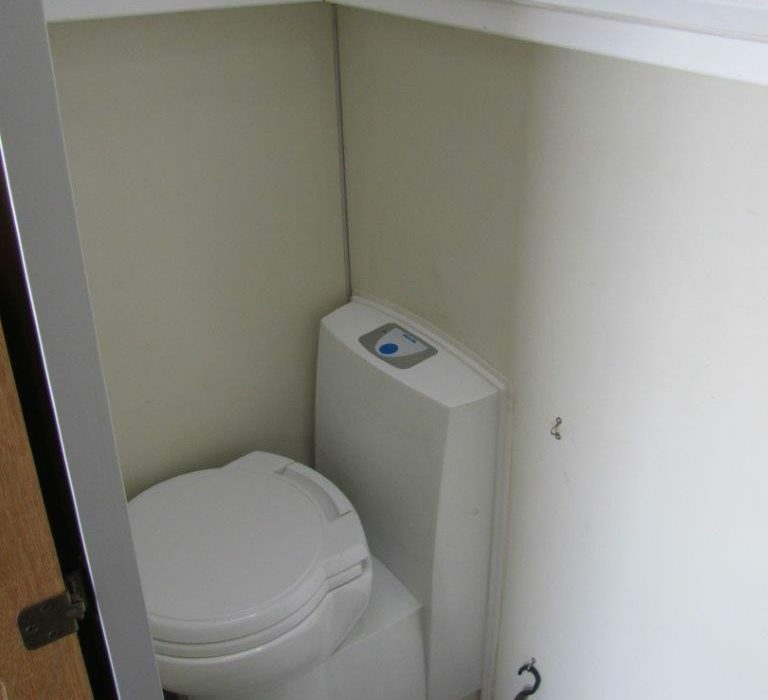 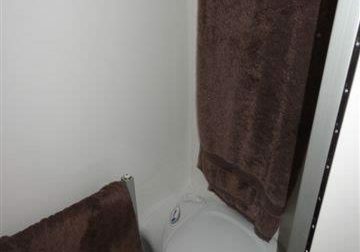 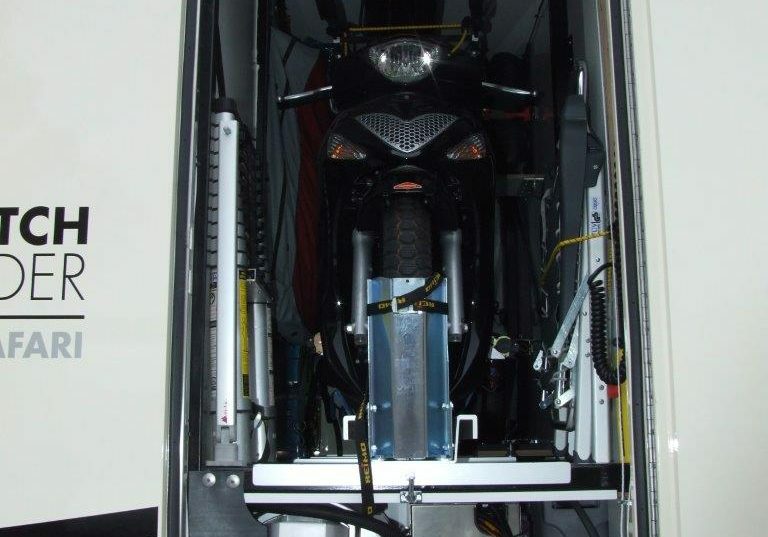 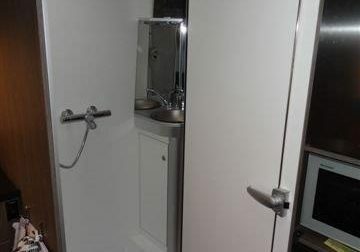 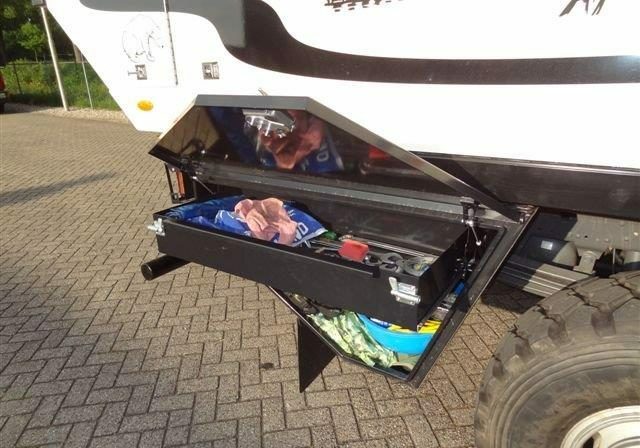 Main reason more space, ability to carry a 150cc scooter inside the truck, more water, larger kitchen and larger shower and toilet. 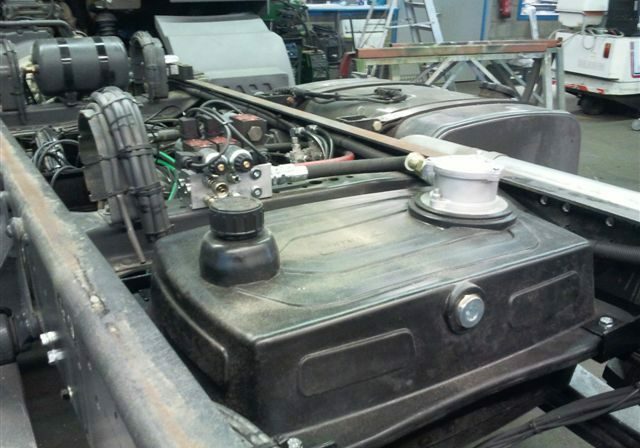 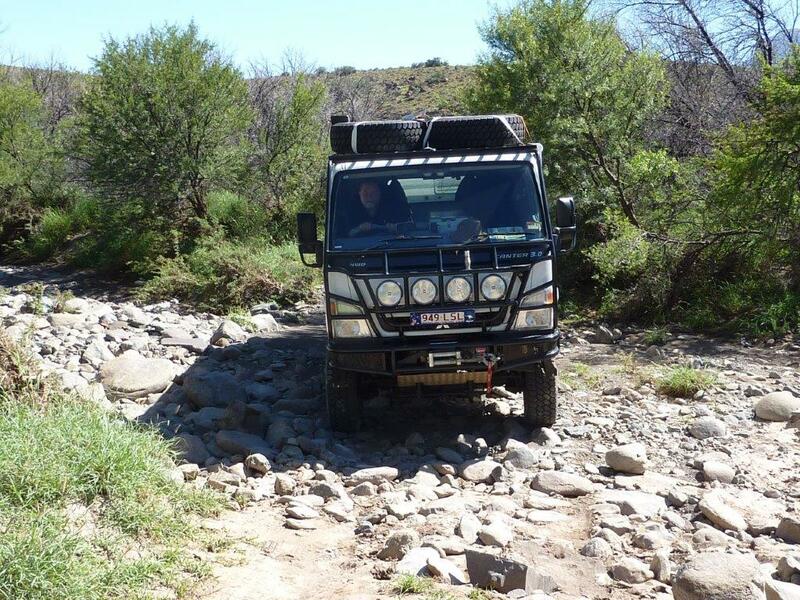 Except from adding winch, lights and new tyres, we made no modifications to our truck. 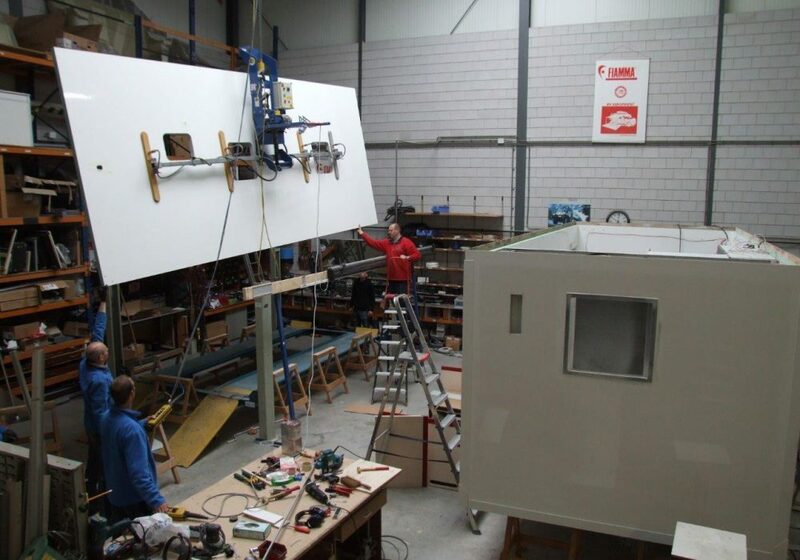 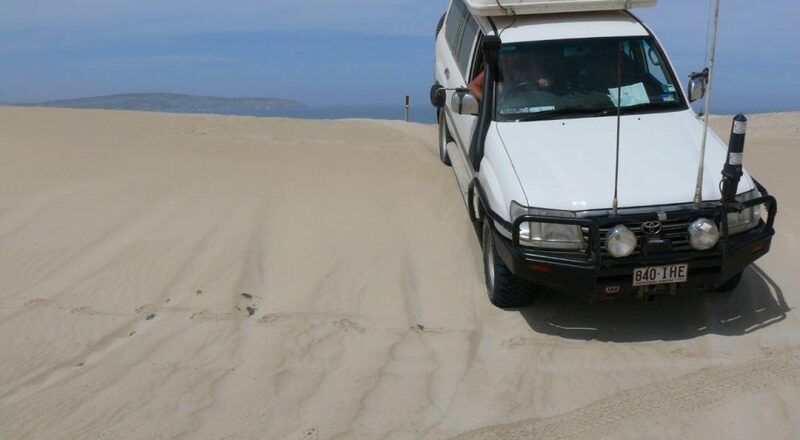 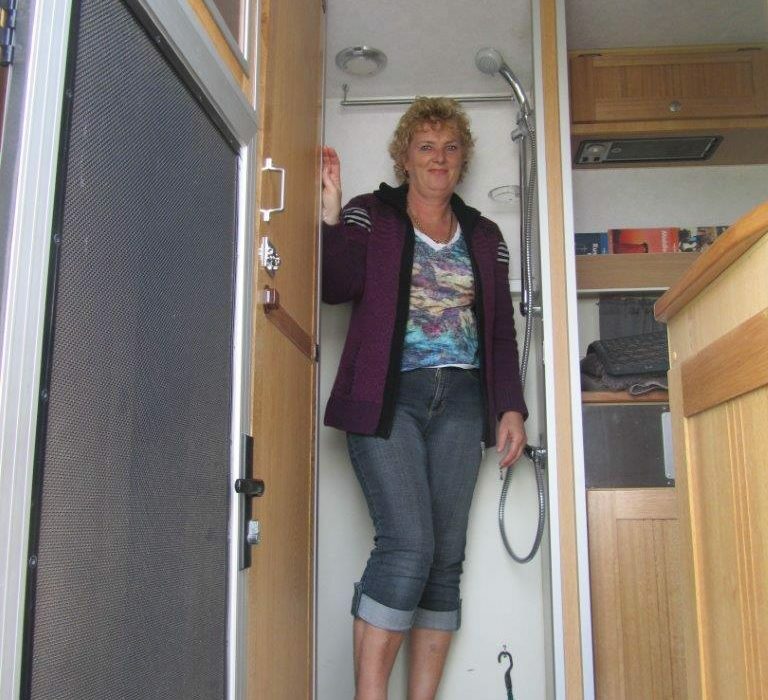 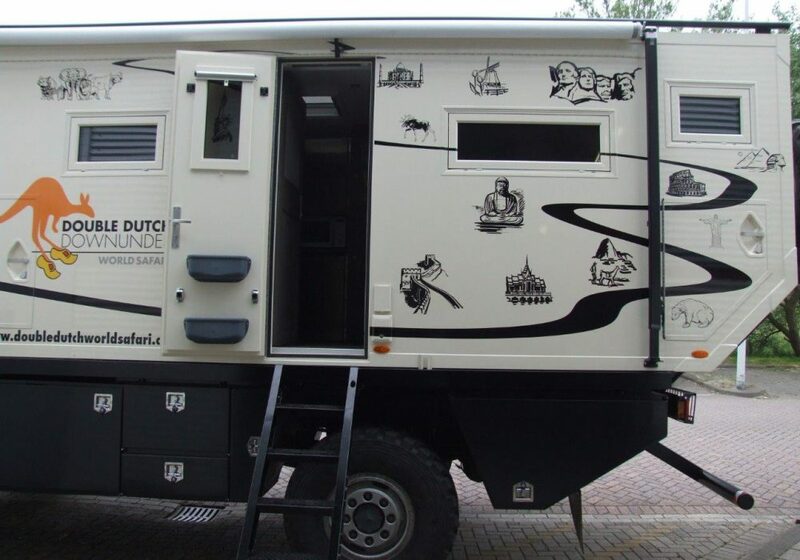 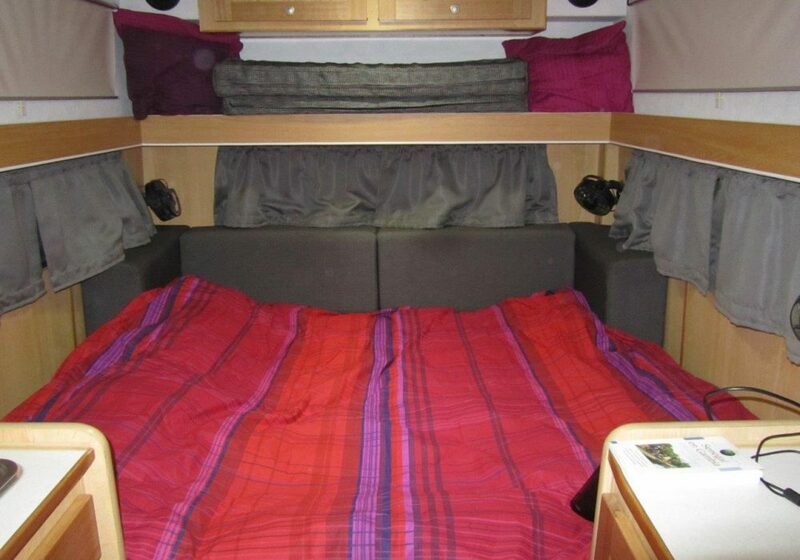 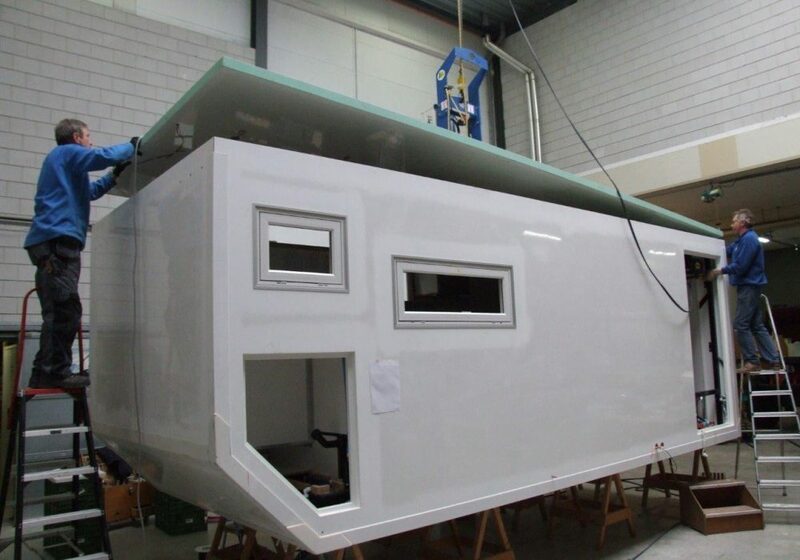 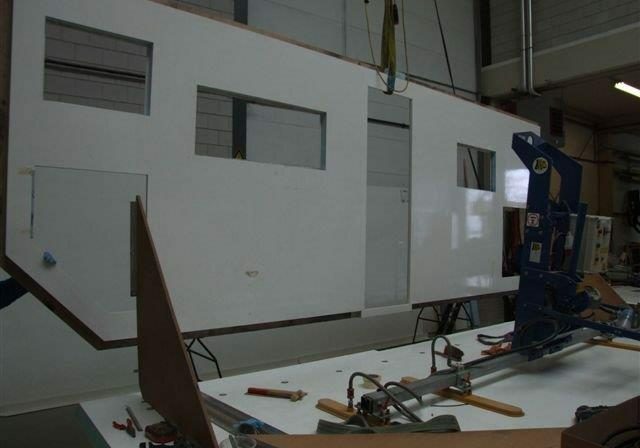 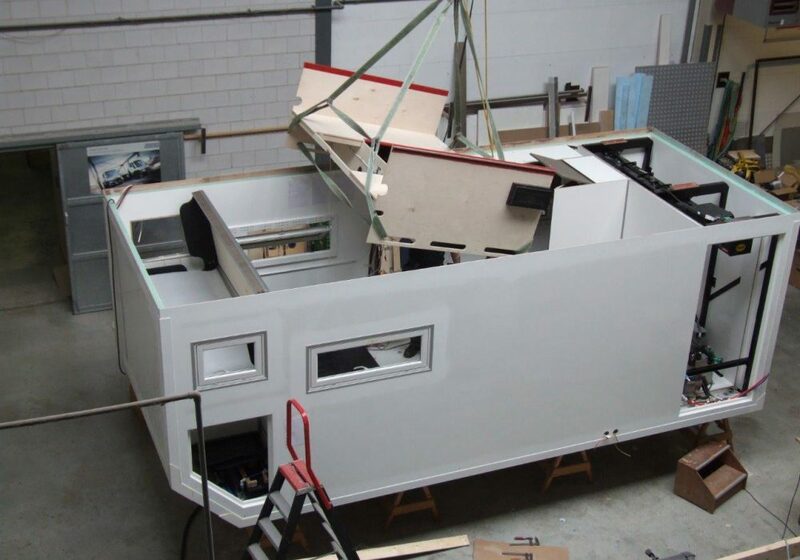 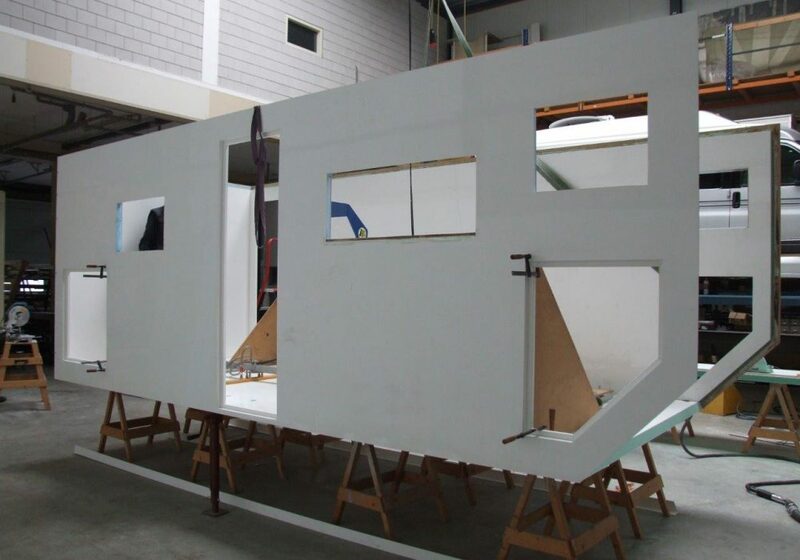 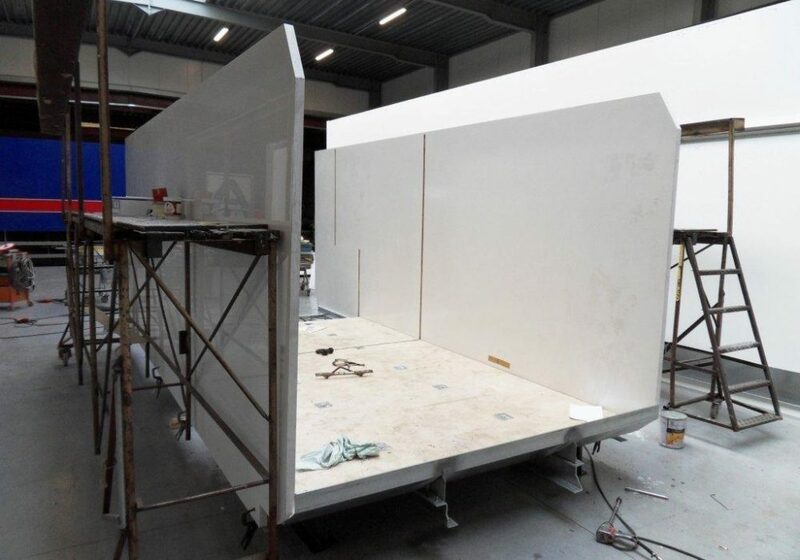 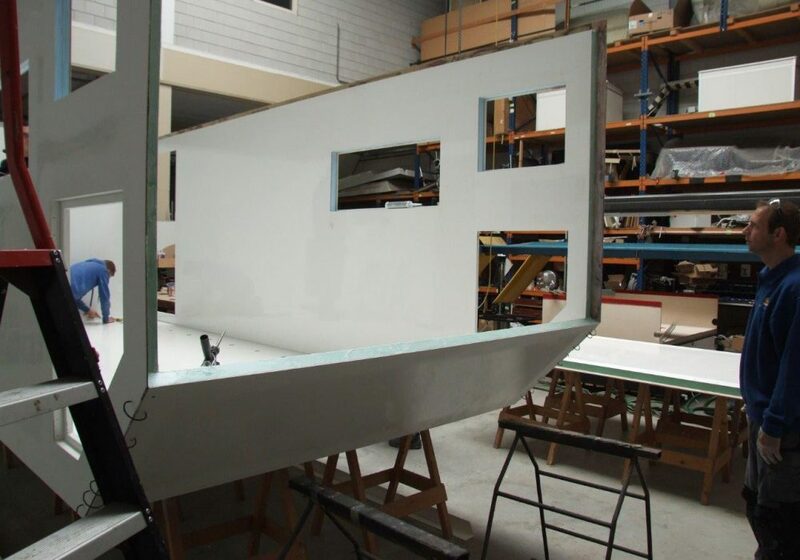 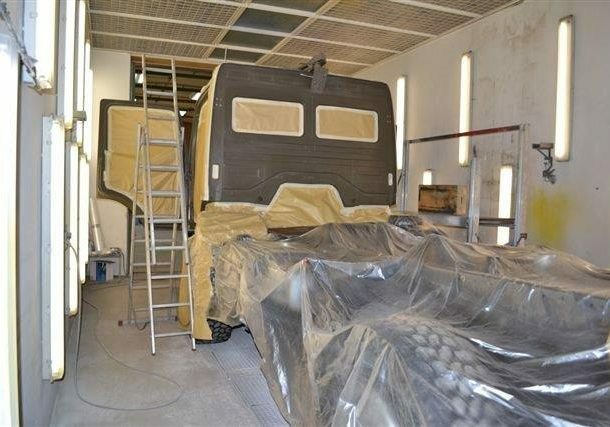 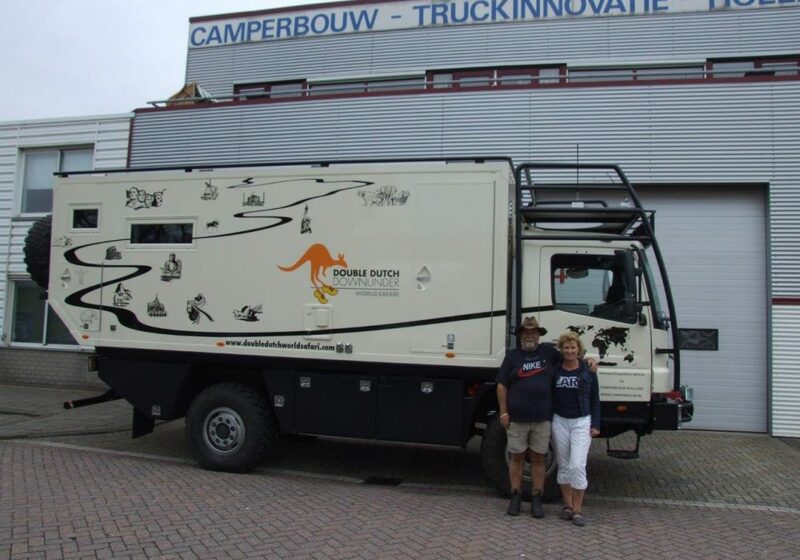 Our living part was build by Camperbouw Holland and since then we have travelled trouble free the last 120000KM. 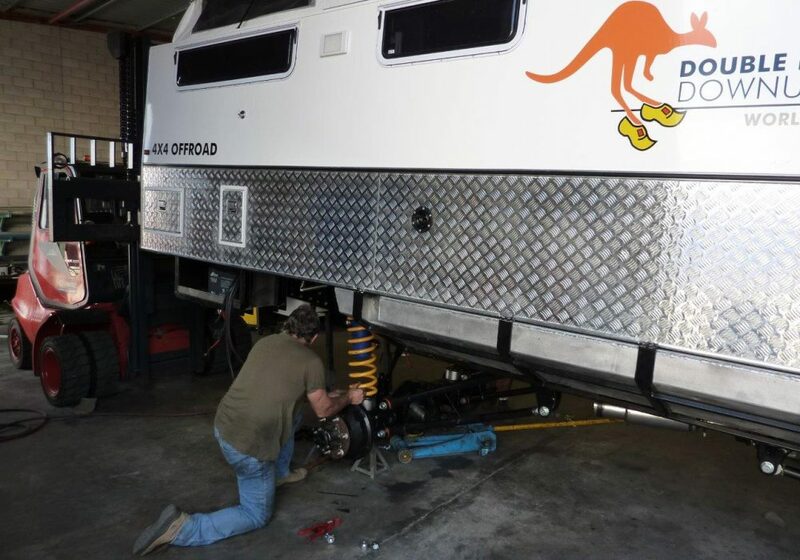 (except from the regular service and a new set of Michellin XZL tyres last year.) 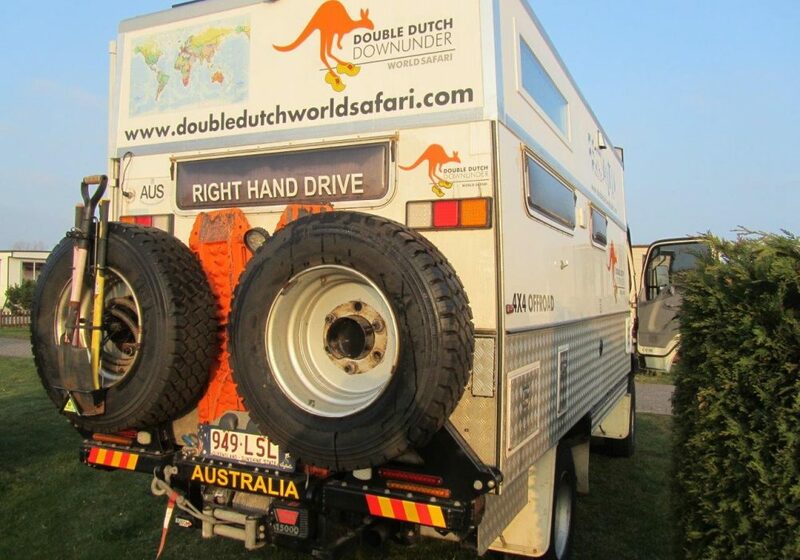 Yes they are noisy, and they do not drive as nice as other tyres BUT while everyone is always concerned about mud and soft sand I am more concerned about the thousands of potholes. 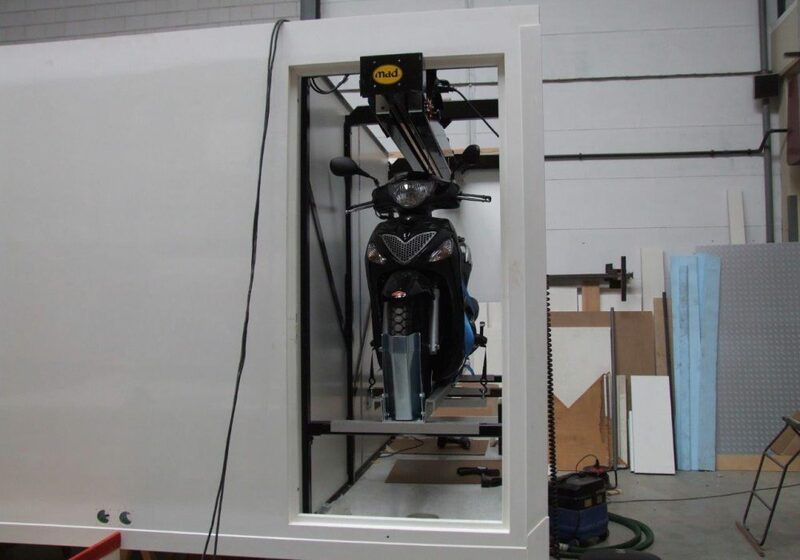 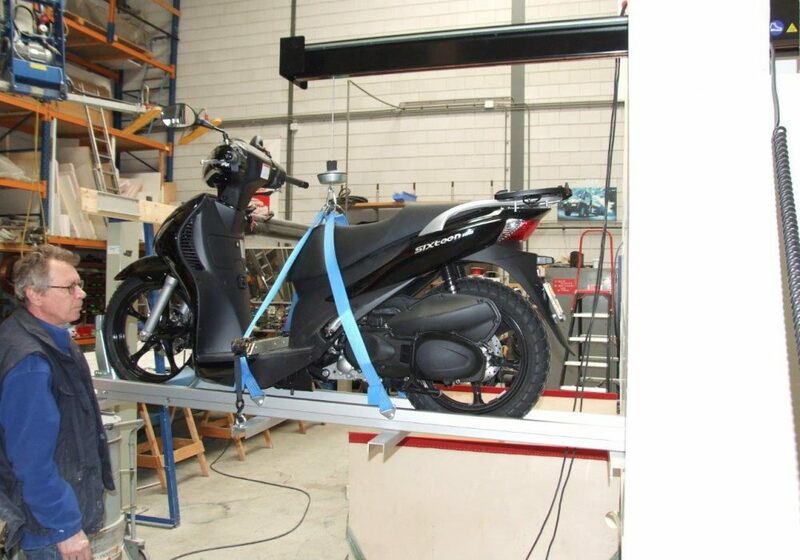 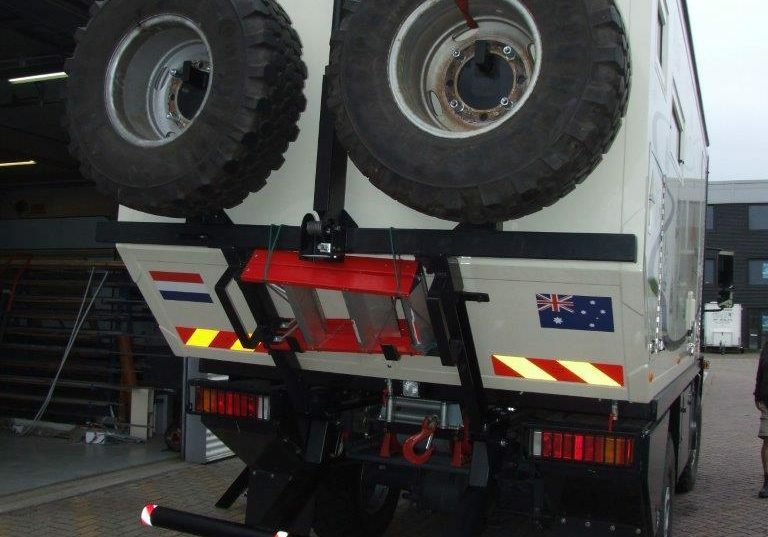 Load rating is also very important and the XZL we have can carry up to 5000KG per tyre. 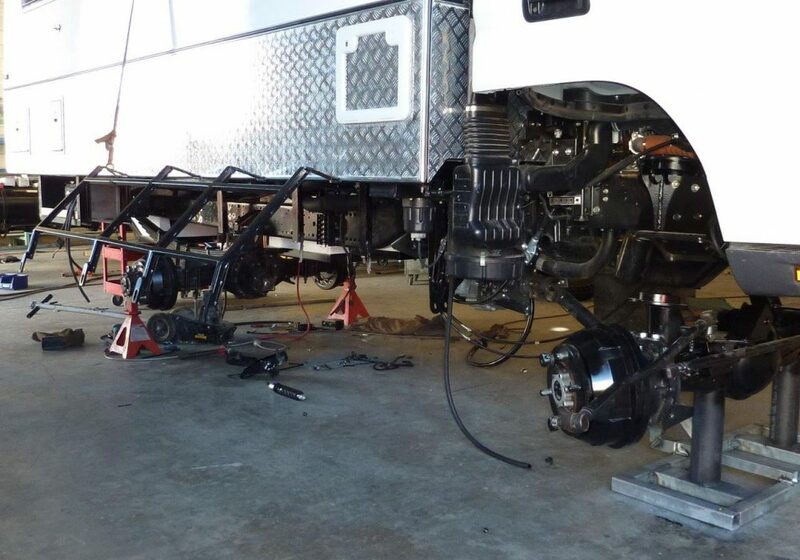 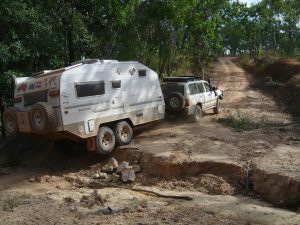 Take note: Having learned a few lessons we would never purchase a new truck again as service back up and warranty do not exist once you start travelling overseas. 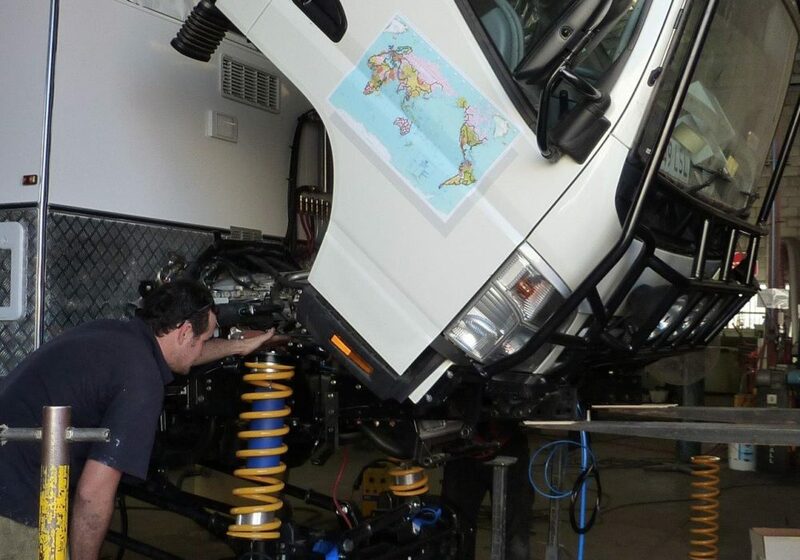 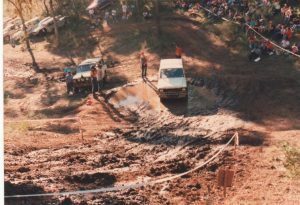 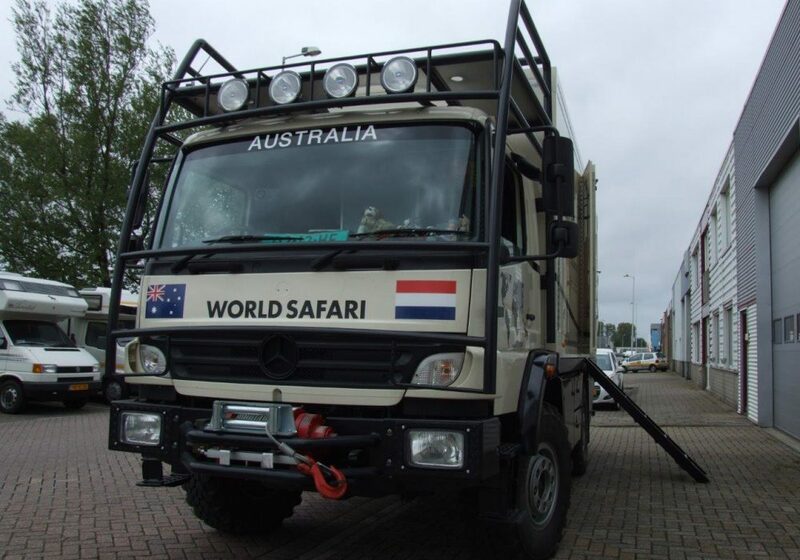 It also had become clear that the service cost in Europe and Australia was very high compared with Africa or South East Asia, not to mention the scare tactics by many to get you to purchase numerous aftermarket items or modifications completely unnecessary unless you are going to participate in a Dakar type truck race. 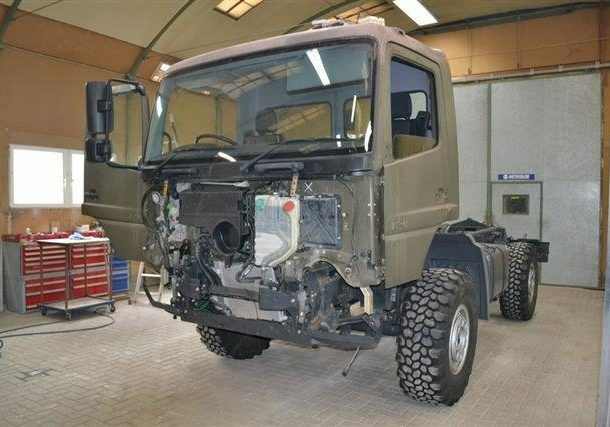 The Mercedes Benz claim that parts and service are available in over 5000 workshops in more than 150 countries this is not true. 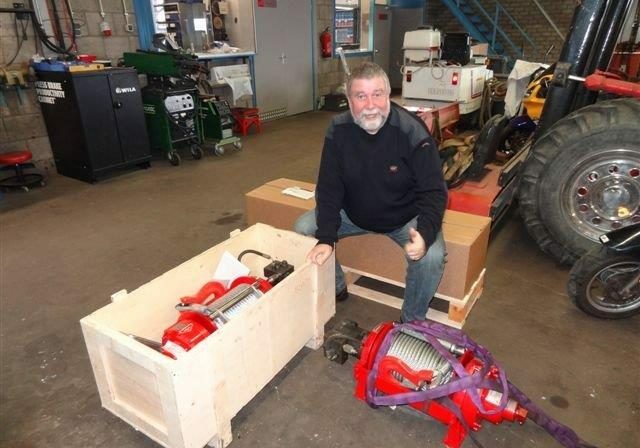 Despite no availability of parts in most countries, in India they would not even assist with the import of the parts. 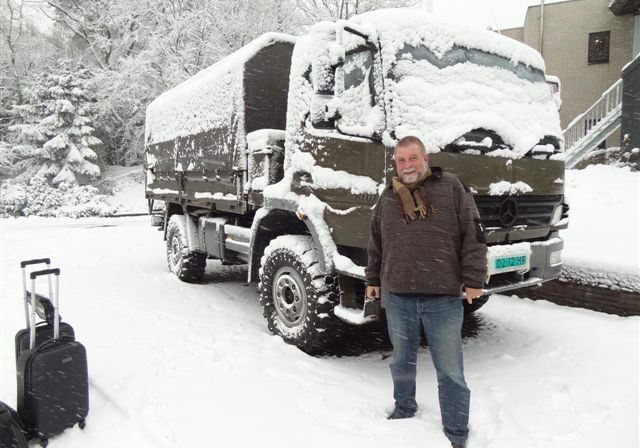 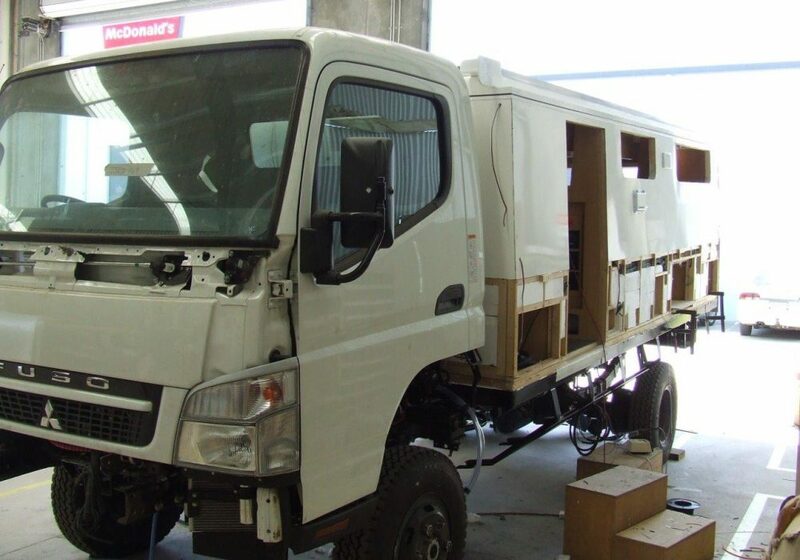 Why did we sell our Fuso? 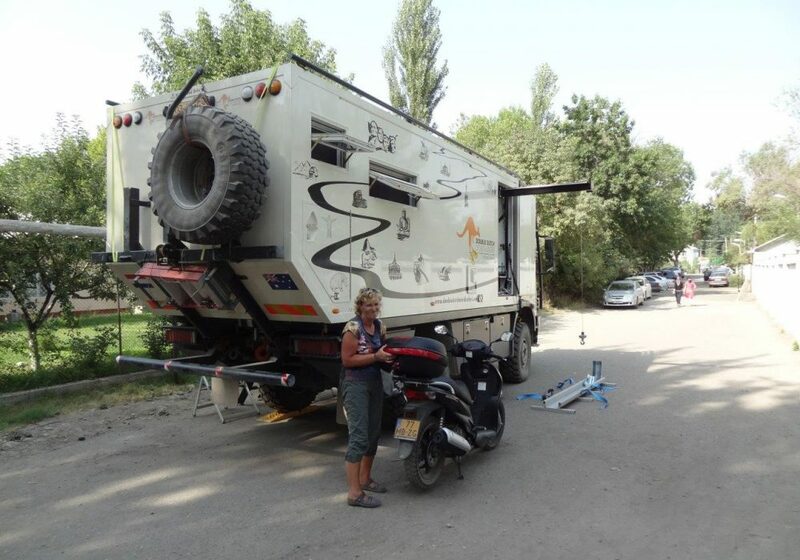 Just for one reason: We liked more comfort and the ability to carry a motorbike inside. 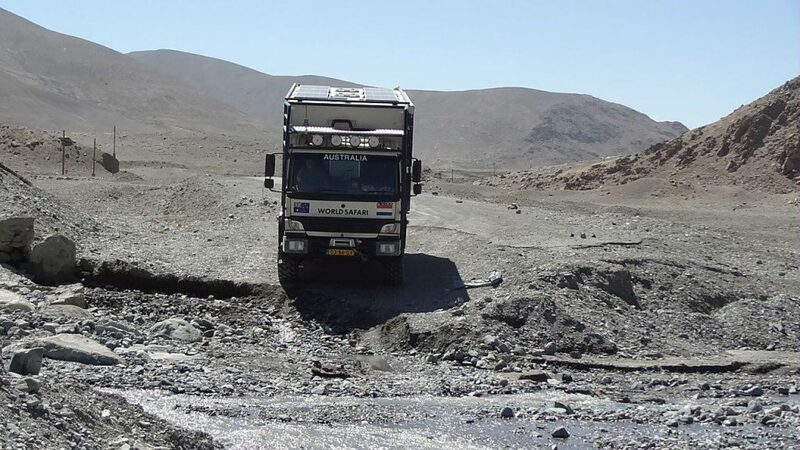 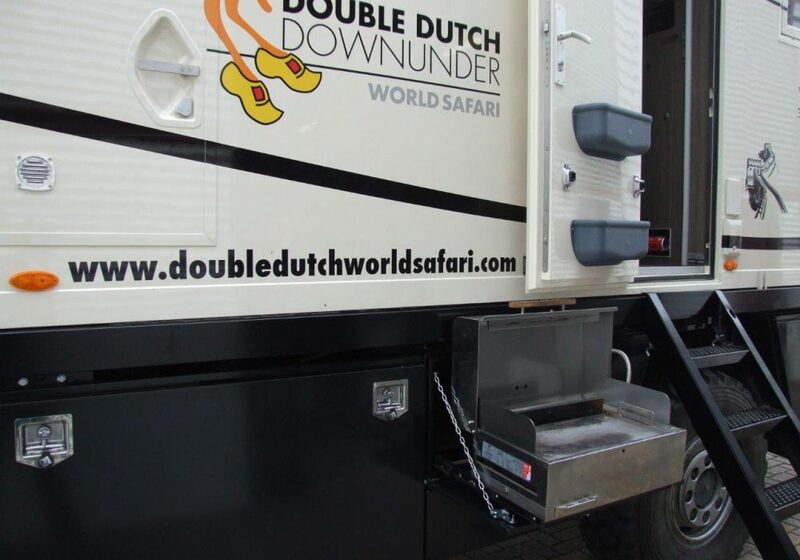 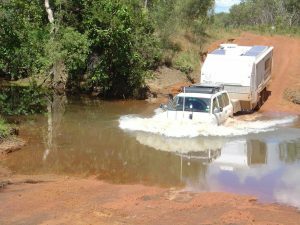 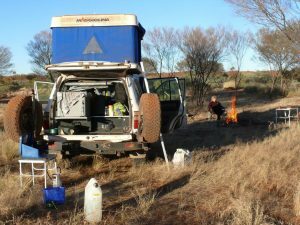 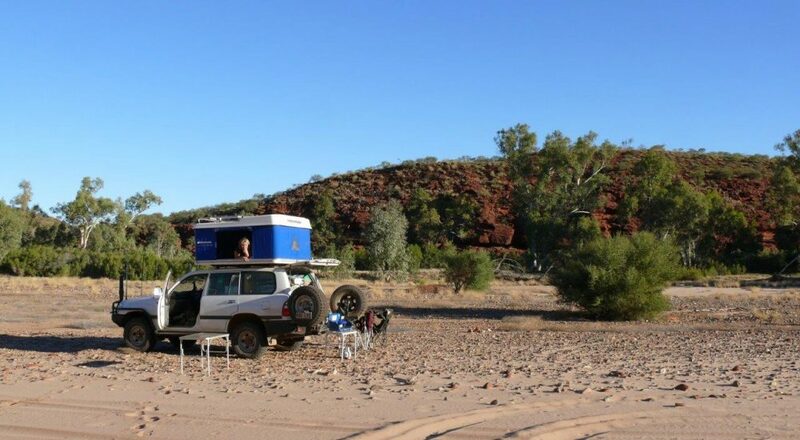 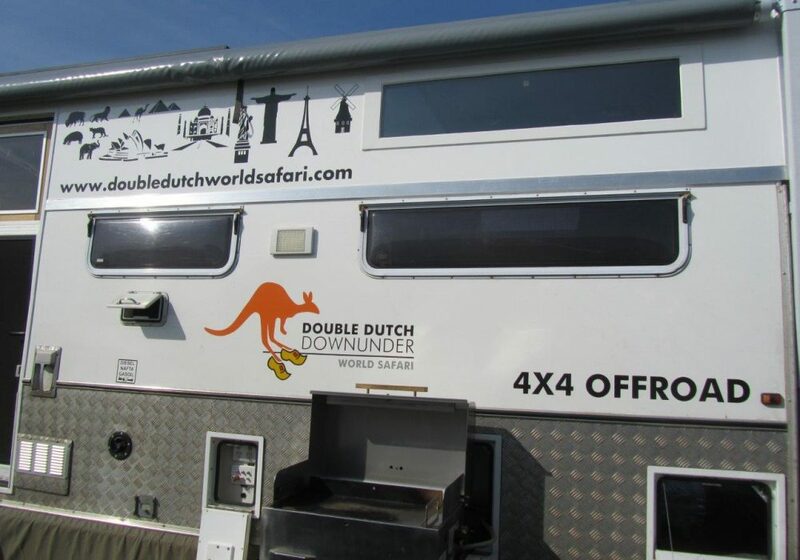 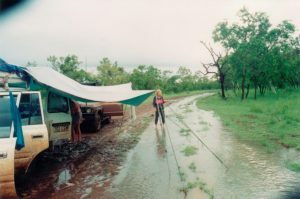 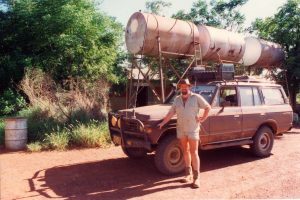 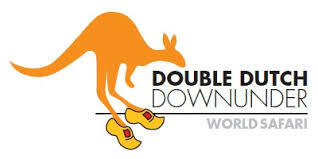 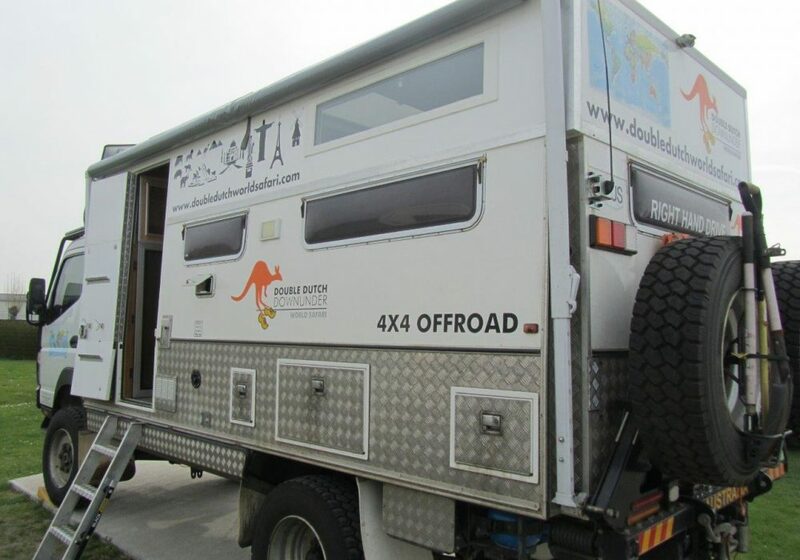 After we realized that Overlanding was something very different to Off Road driving like we did in Australia, we also realized very early in our travels that the real off road work we were used to Australia is not something you do with a 7500KG truck. 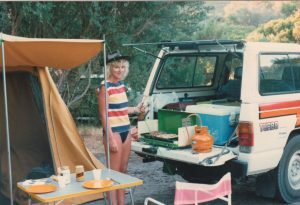 In fact our whole lifestyle had changed and we were much more interested in meeting different cultures and enjoying the scenery. 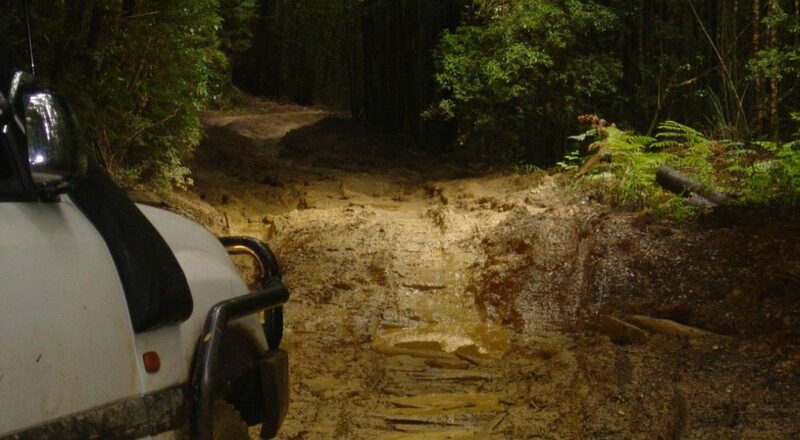 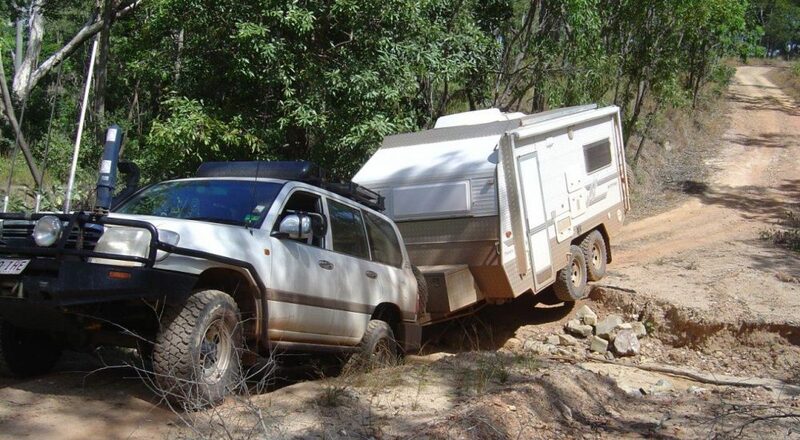 Weight and size are the main obstacles when going really off road. 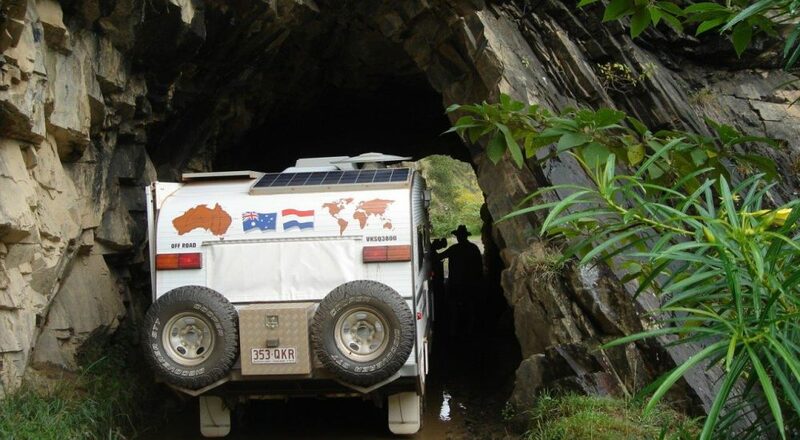 Our original plan to travel the world in 5 years was extended to 10 years and today it will be at least 15 years. 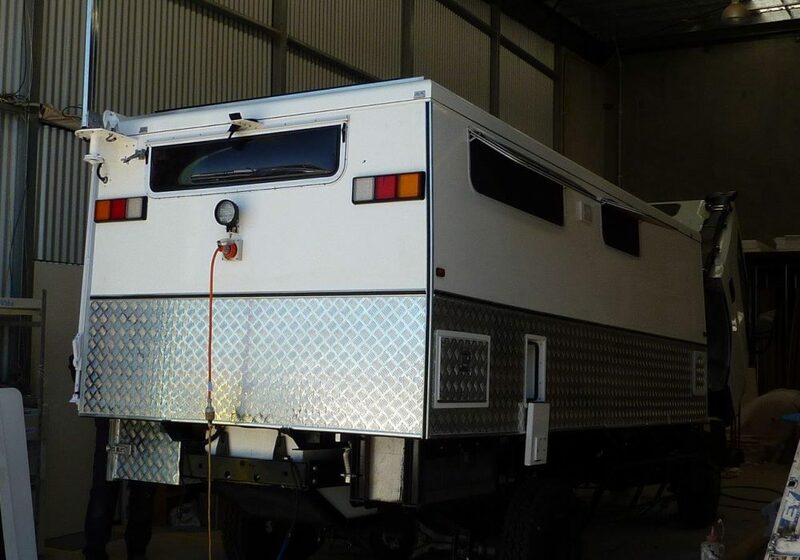 Hence we decided to go bigger again. 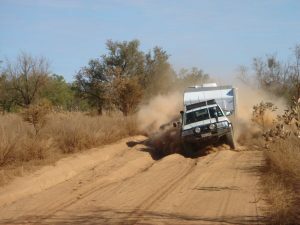 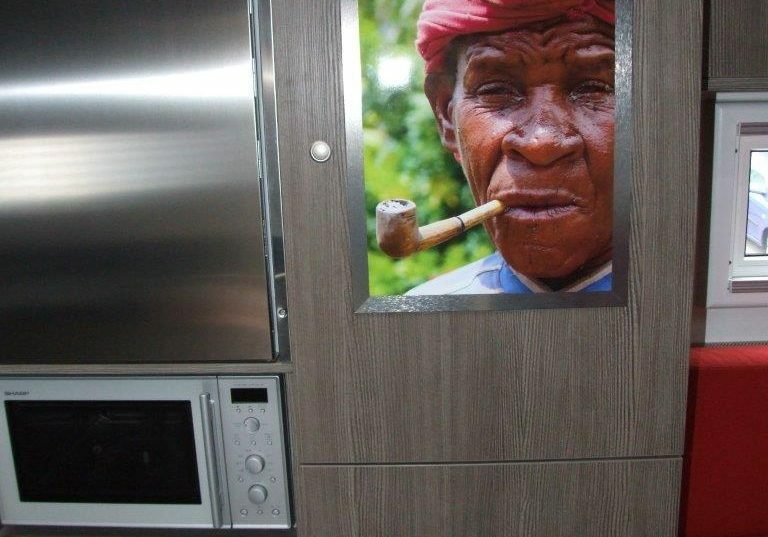 Would I recommend this to those who only plan a 6 or 12 month Africa trip? 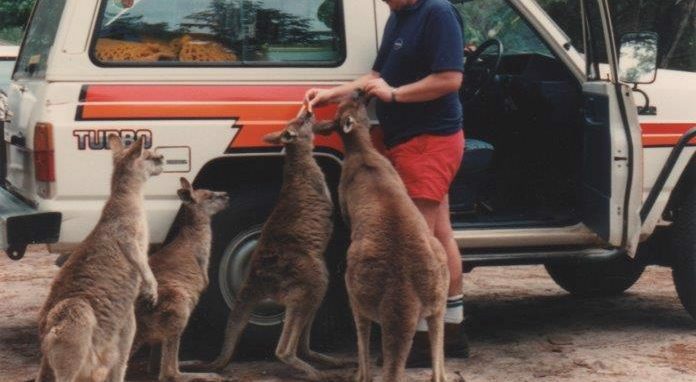 No I would not unless you have spare cash. 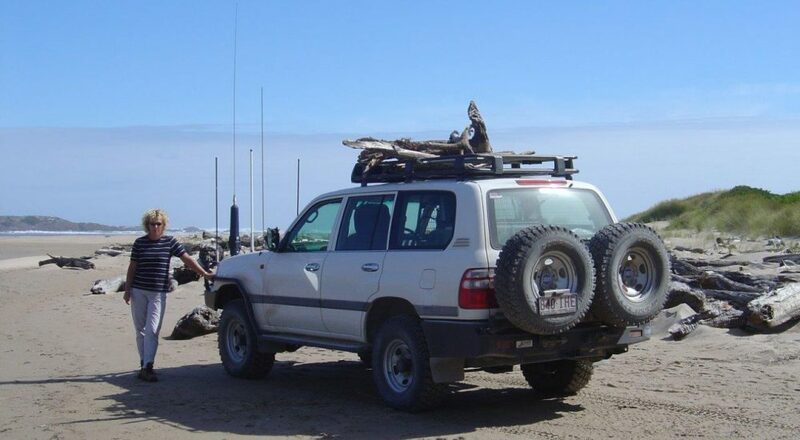 My view would be a Toyota Land cruiser not just from a cost point of view but also a resale point of view. 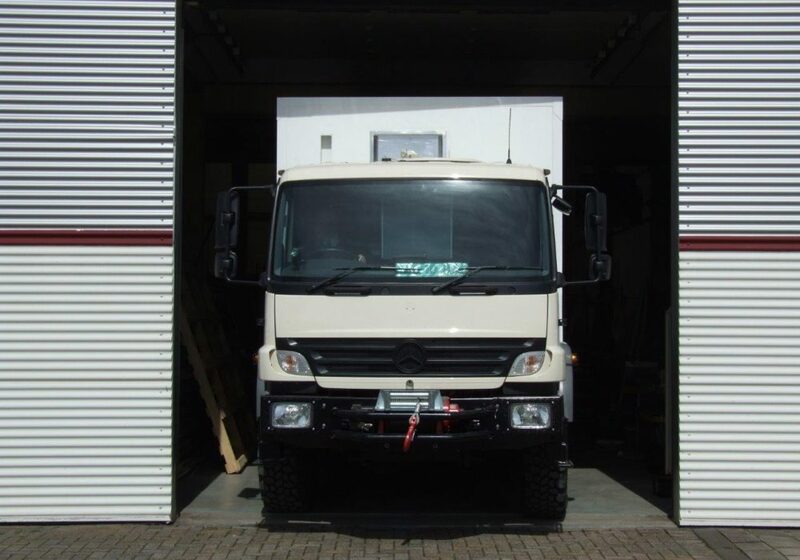 Our Atego is a rigid two-axle truck. 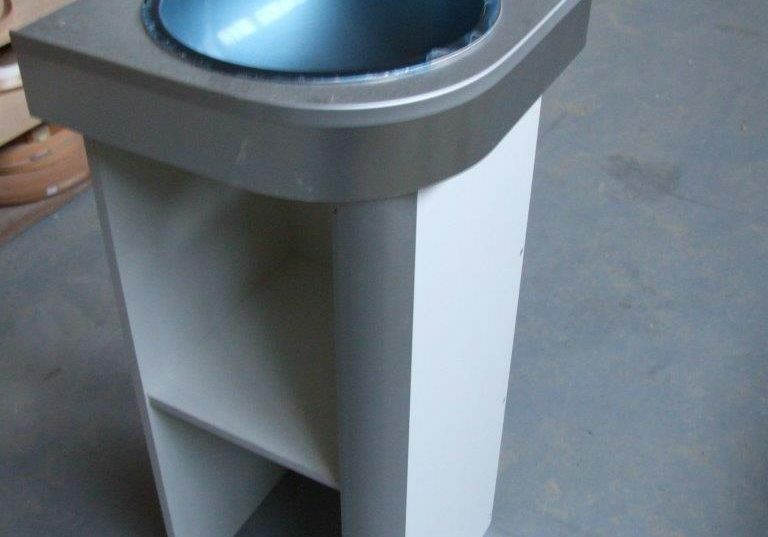 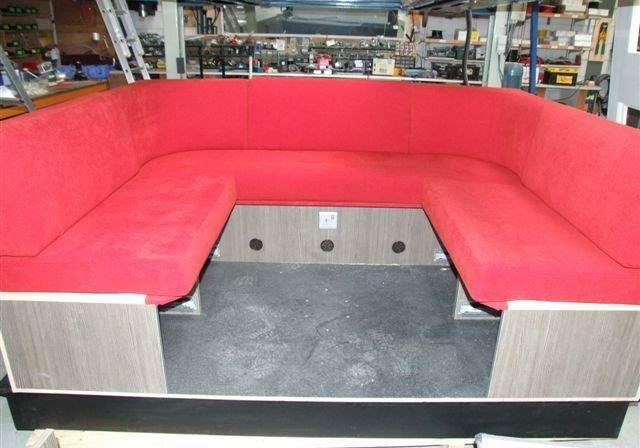 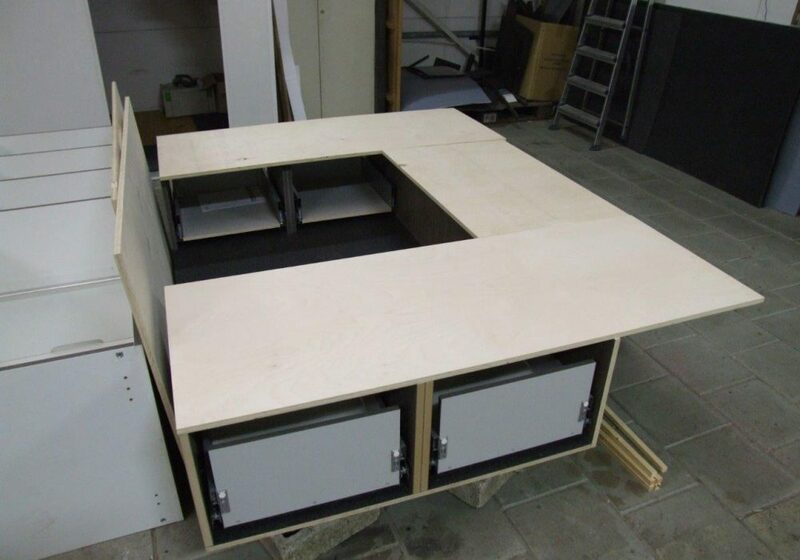 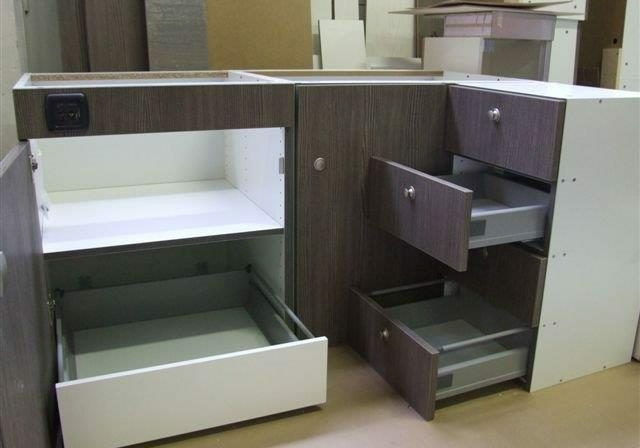 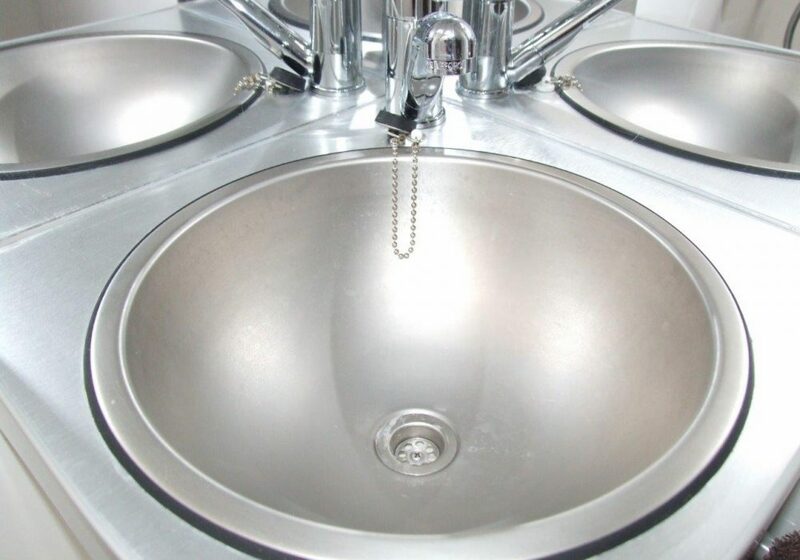 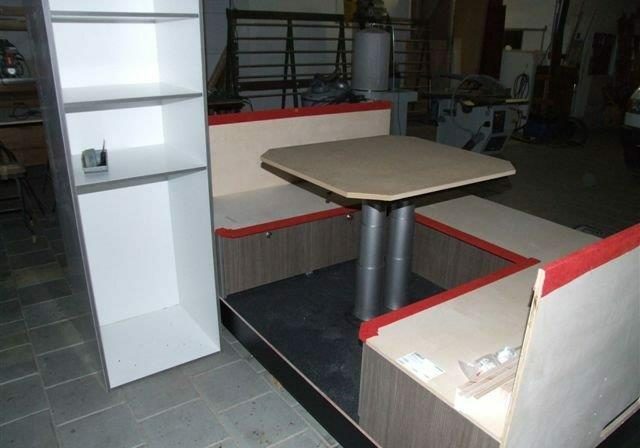 It is a militarized commercial design, modified to suit specific requirements. 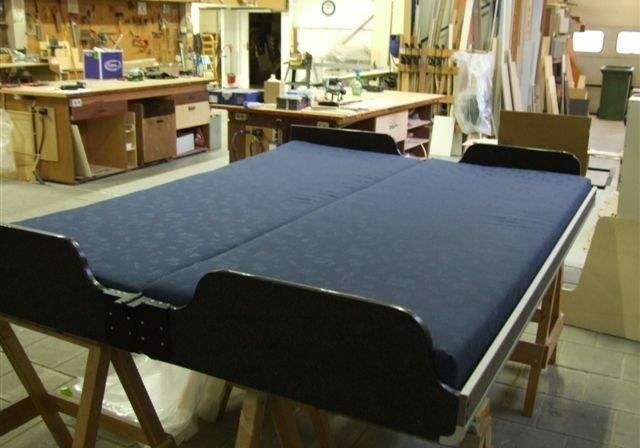 Our model was one of the last militarized versions which started in 1999 and ceased production in 2004. 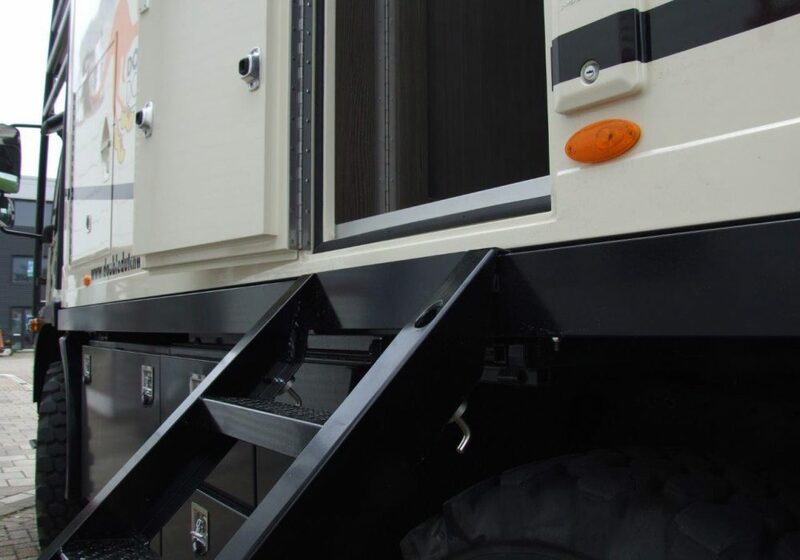 It comes in 2 models and various wheel bases, ours being the short wheel base makes it very easy to manoeuvre on small narrow tracks. 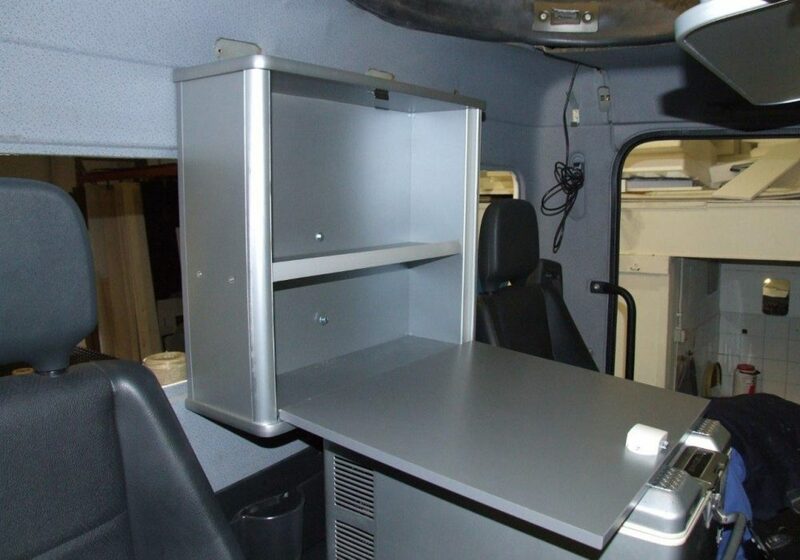 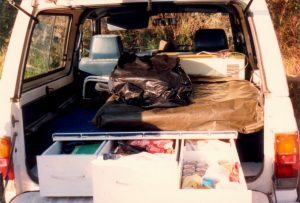 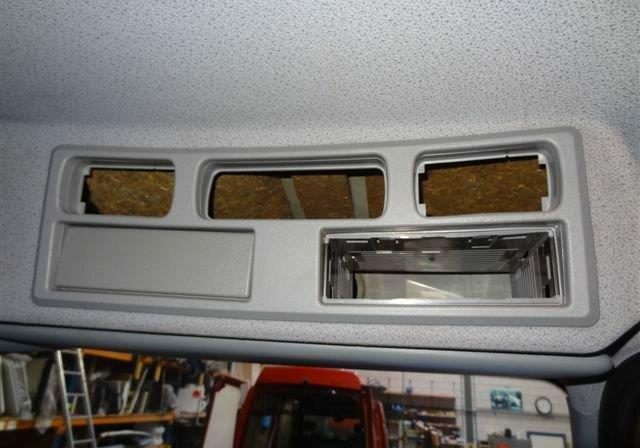 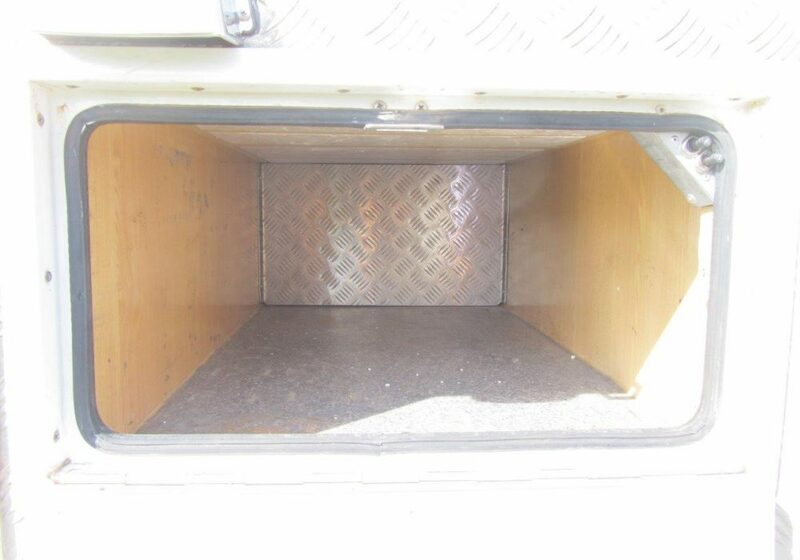 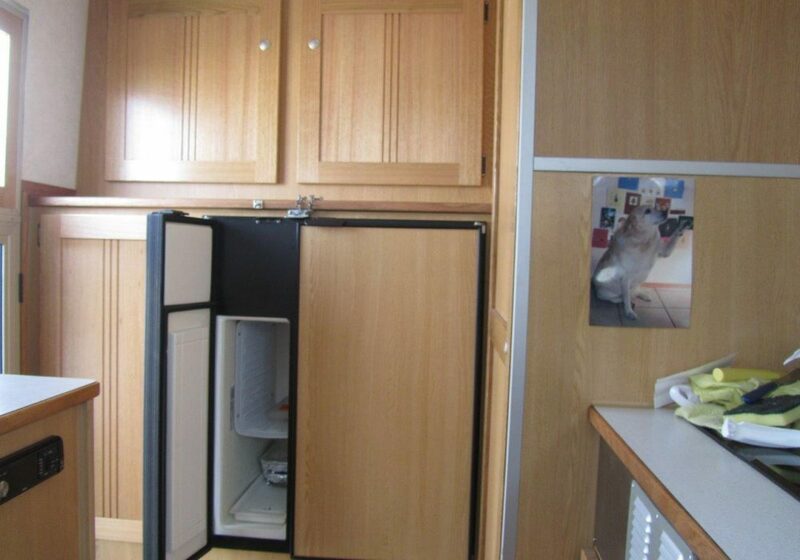 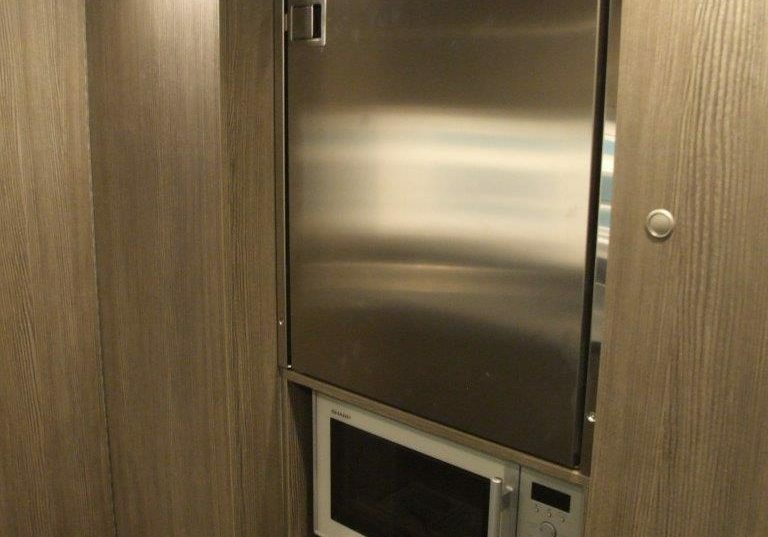 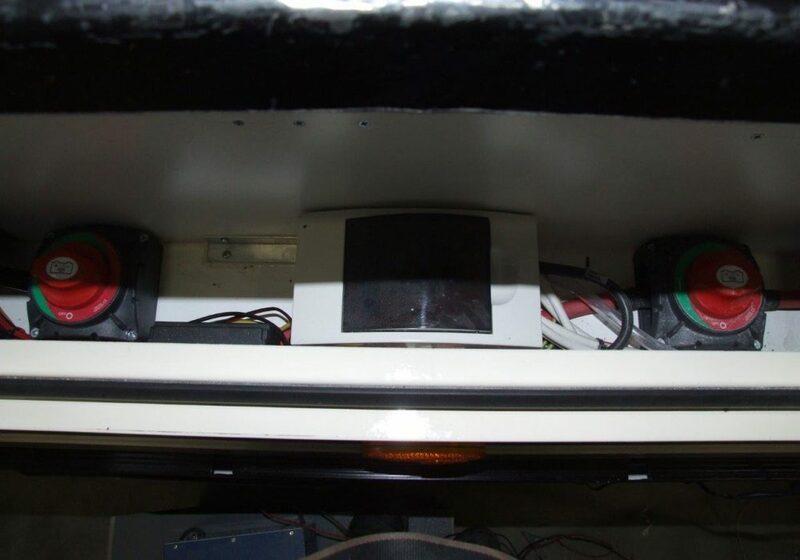 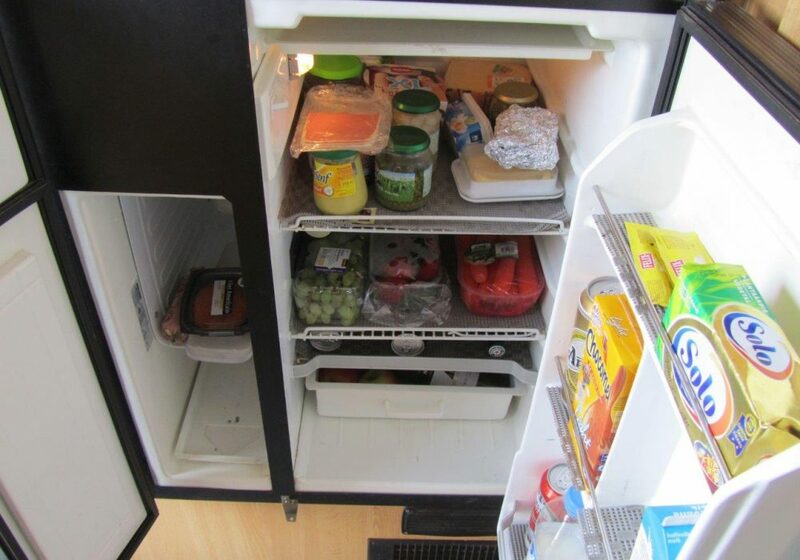 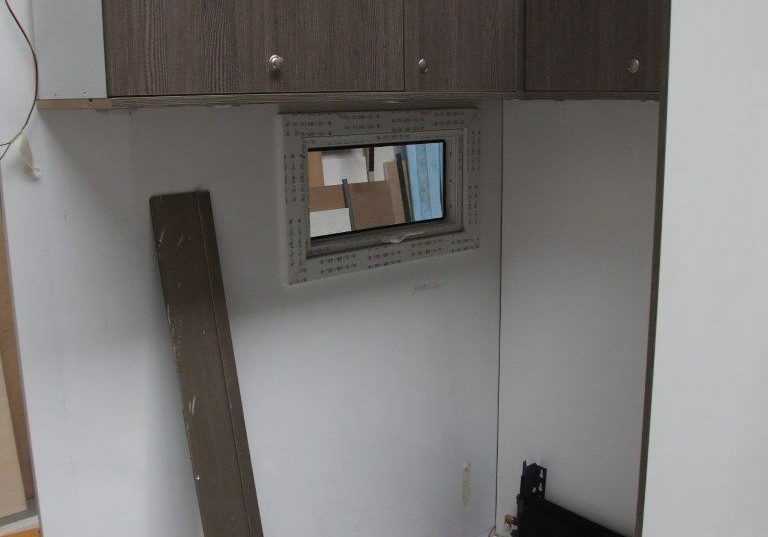 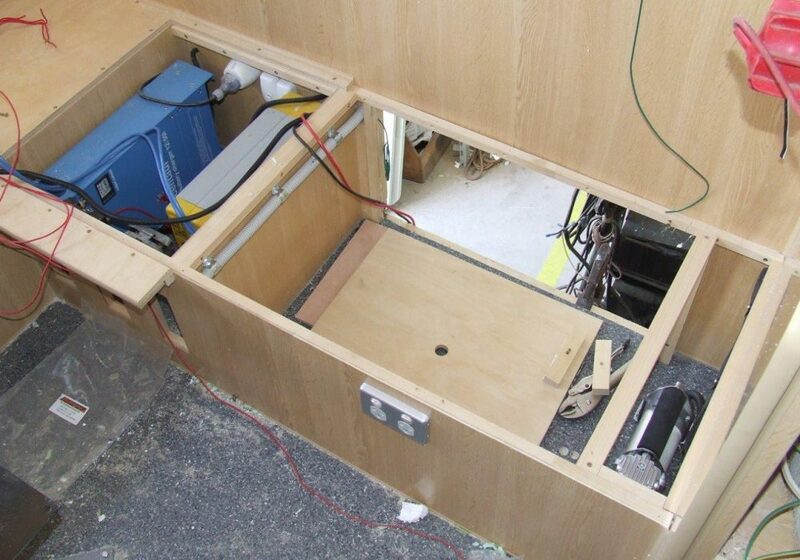 Our truck has the single cab where we removed the middle seat to install a 40 liter Fridge/Freezer Engel fridge. 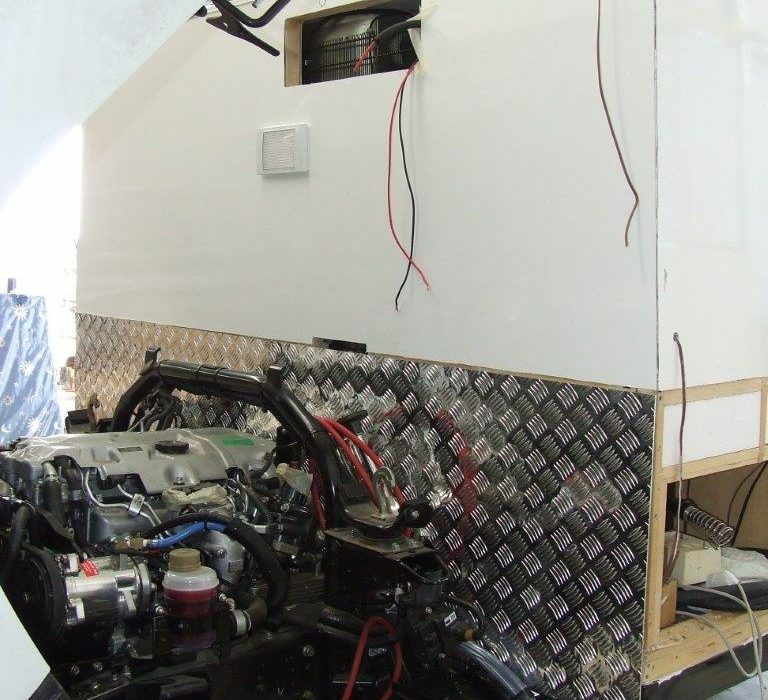 Our engine is a Euro 3 (2004). 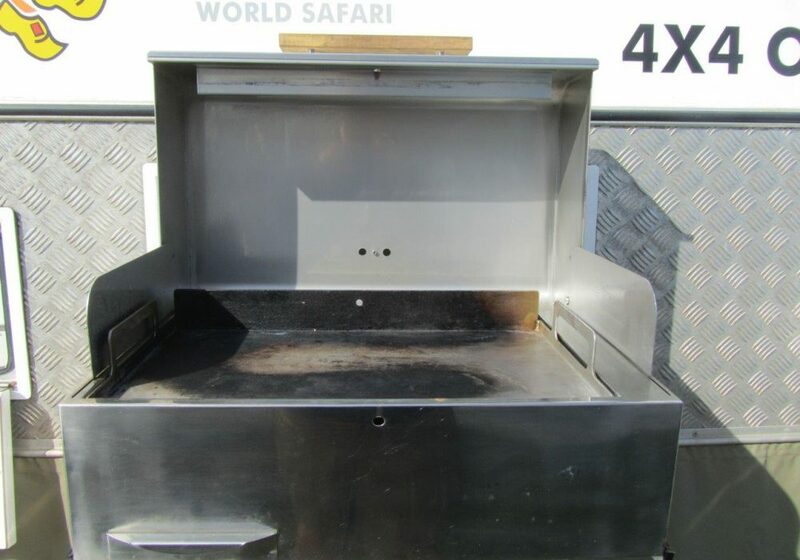 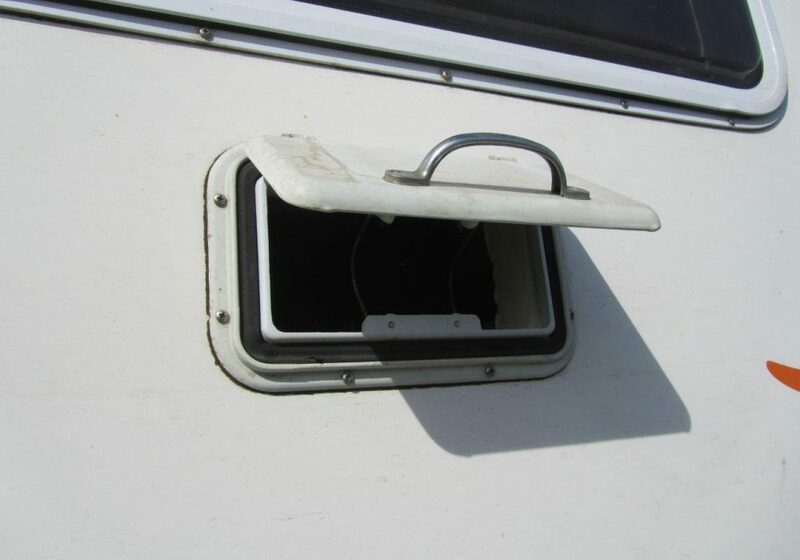 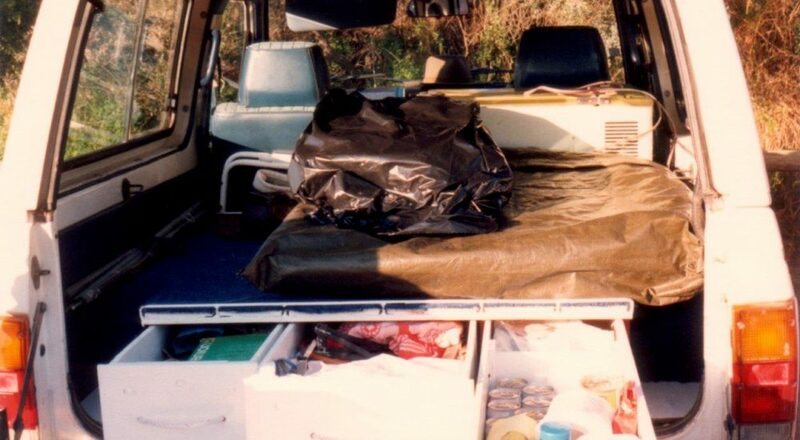 Our truck came with an observation hatch on the roof with a light machine gun mount, which was taken off after we purchased the truck but the observation hatch is a real asset when looking for wild life. 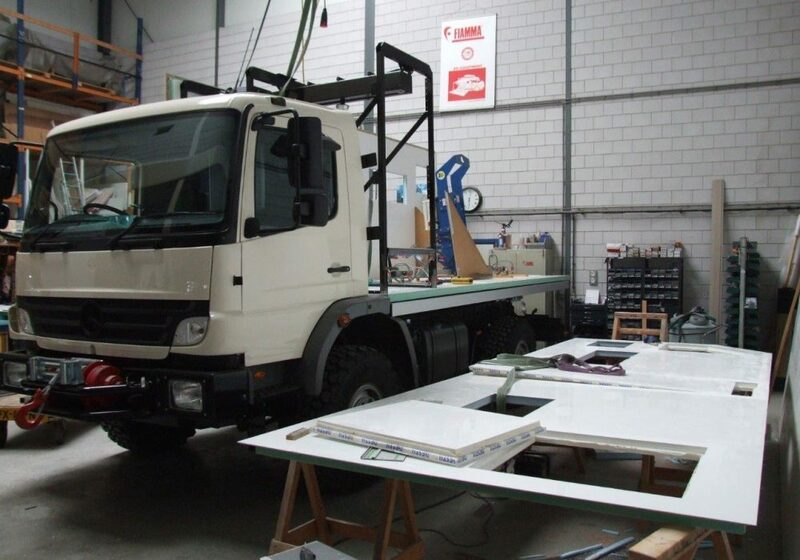 The most famous Atego was the one build by Larag in Switzerland in 1998. 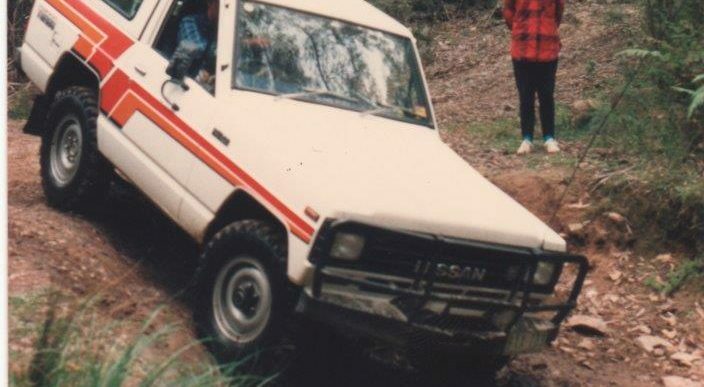 It had a 1200HP engine and 5600NM. 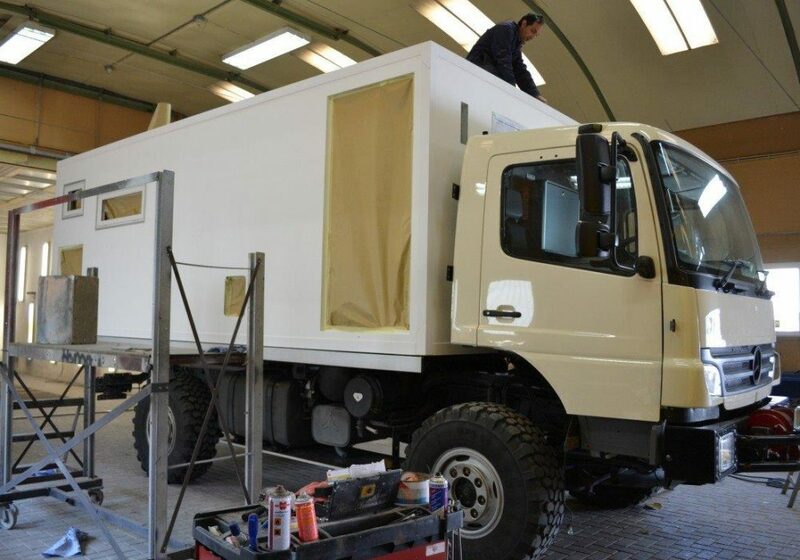 It won the FIA Truck racing championships and weight just over 5600KG. 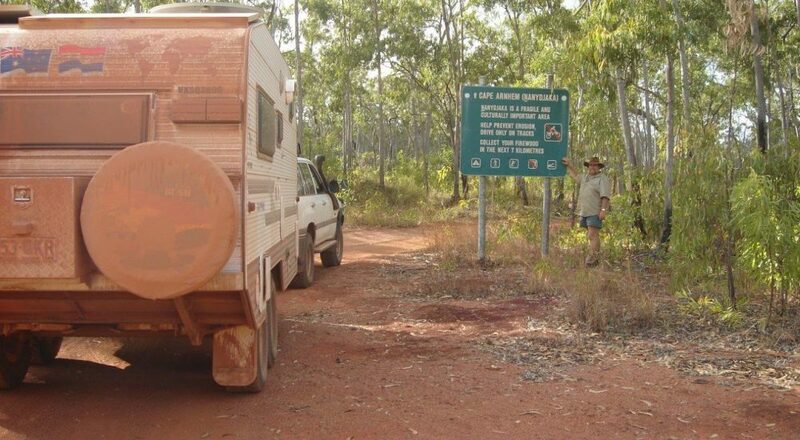 With our average km per day of just under 90KM, we have no need for speed; all we want is comfort. 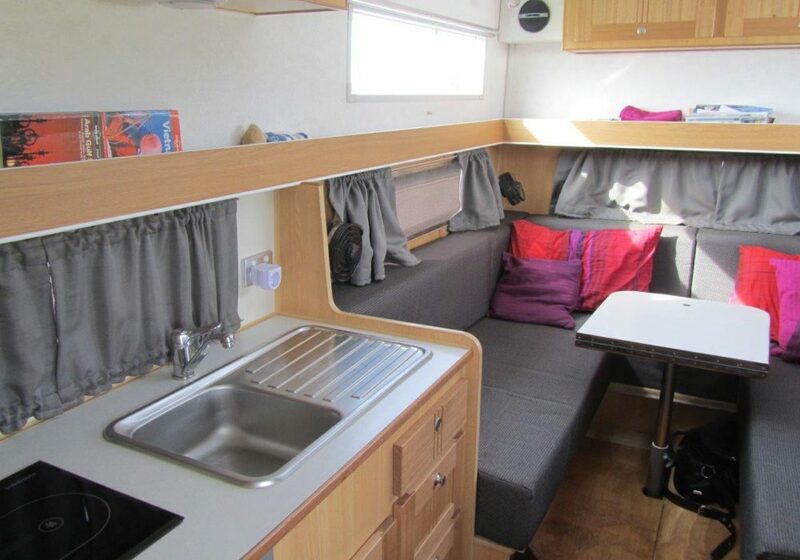 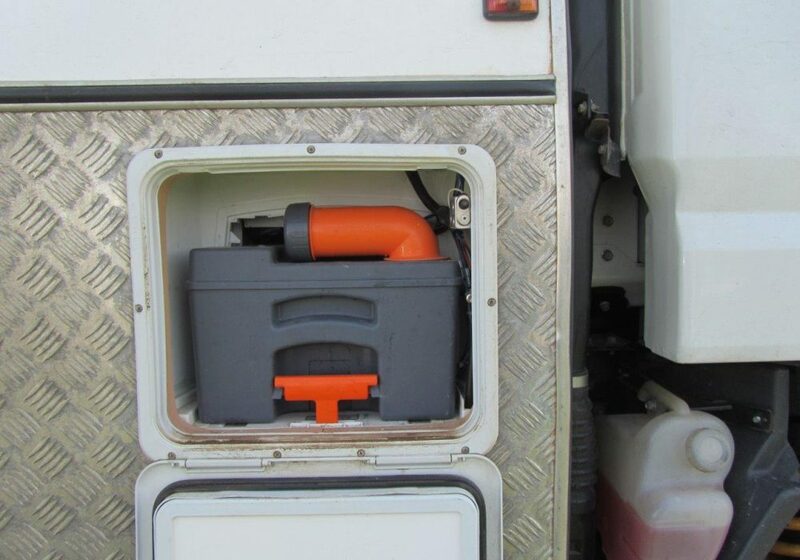 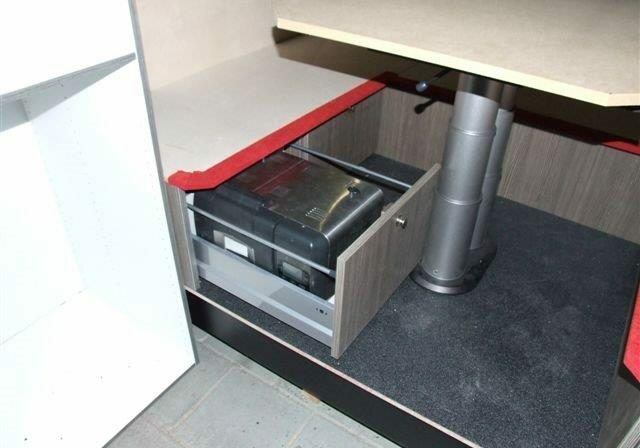 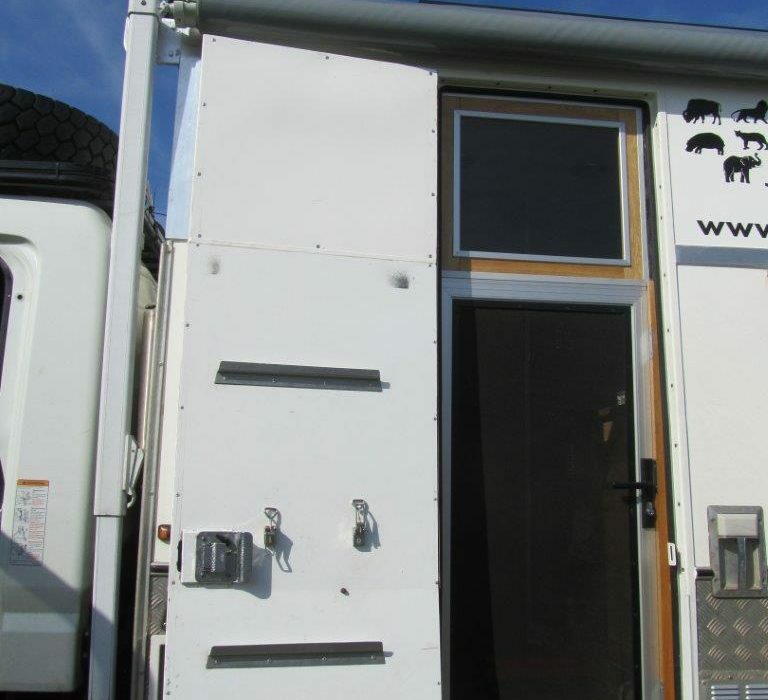 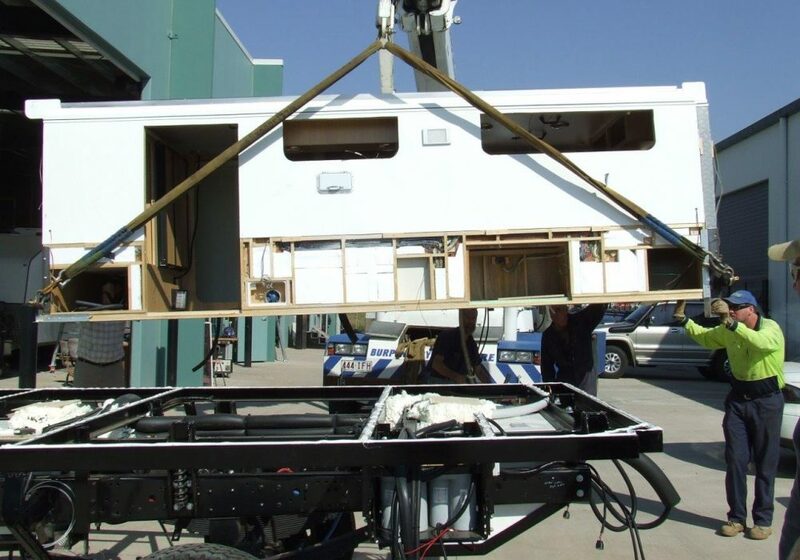 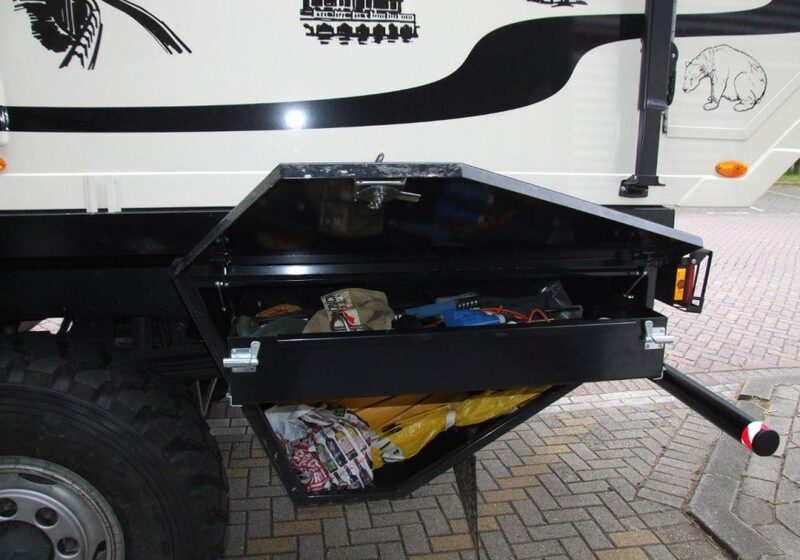 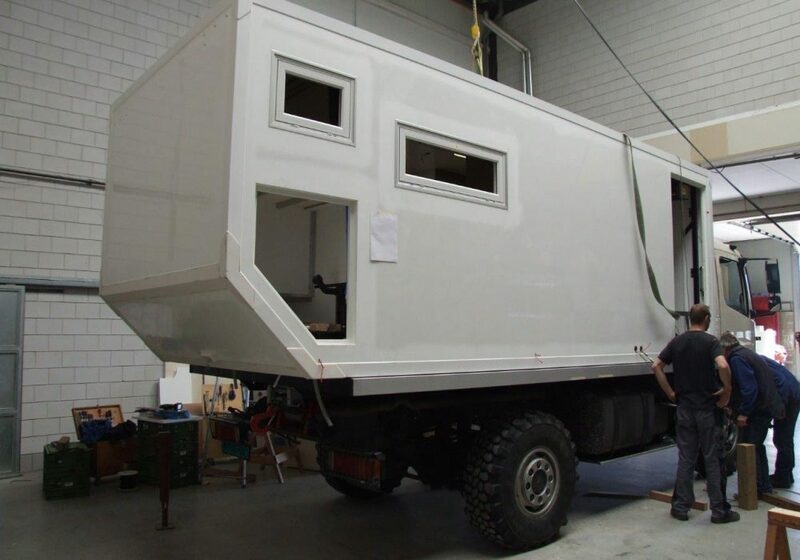 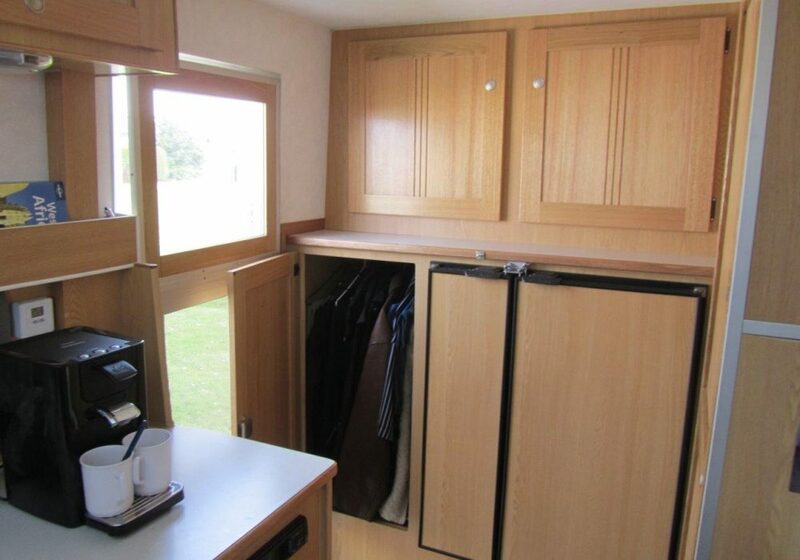 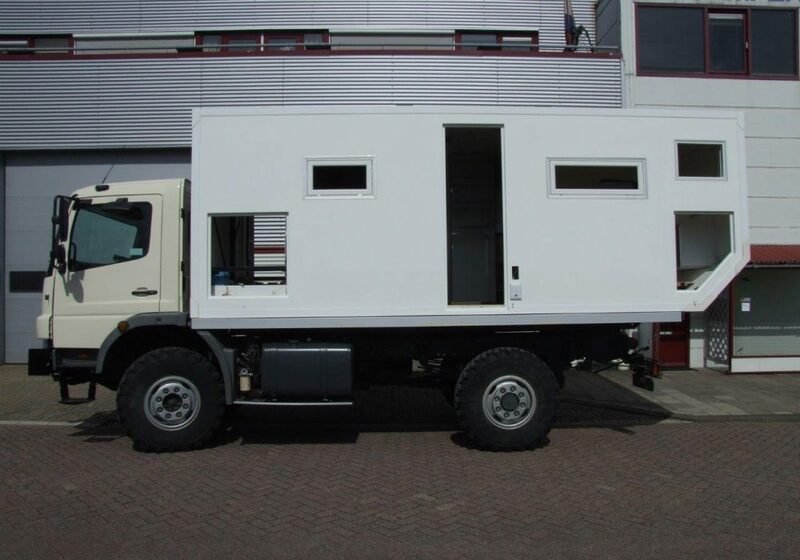 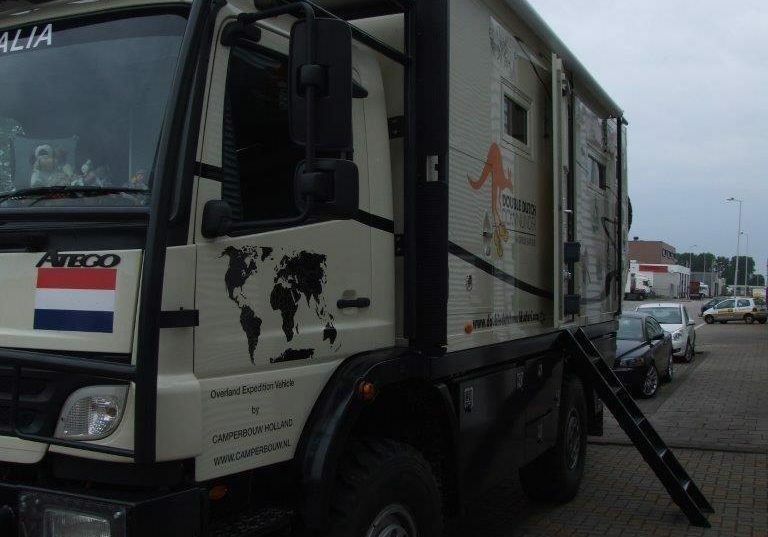 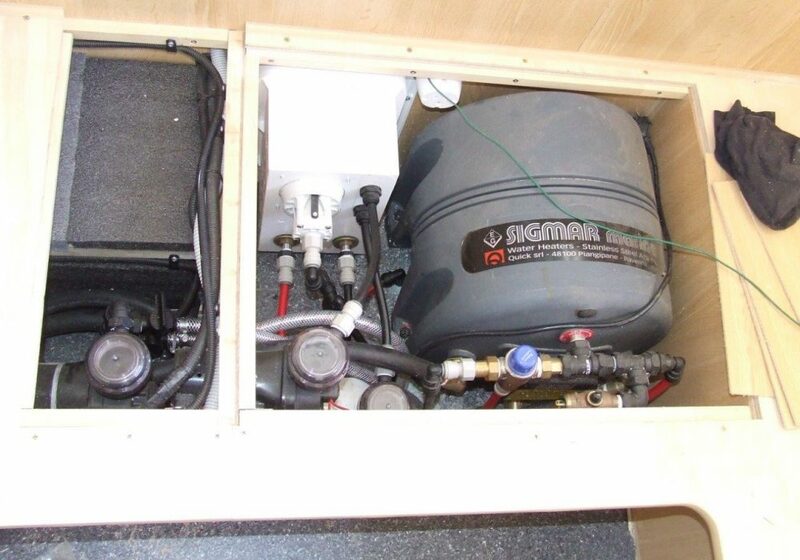 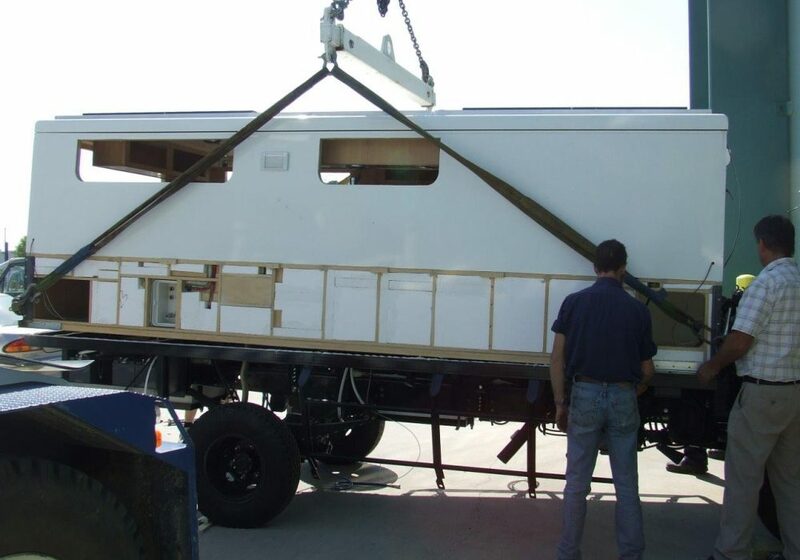 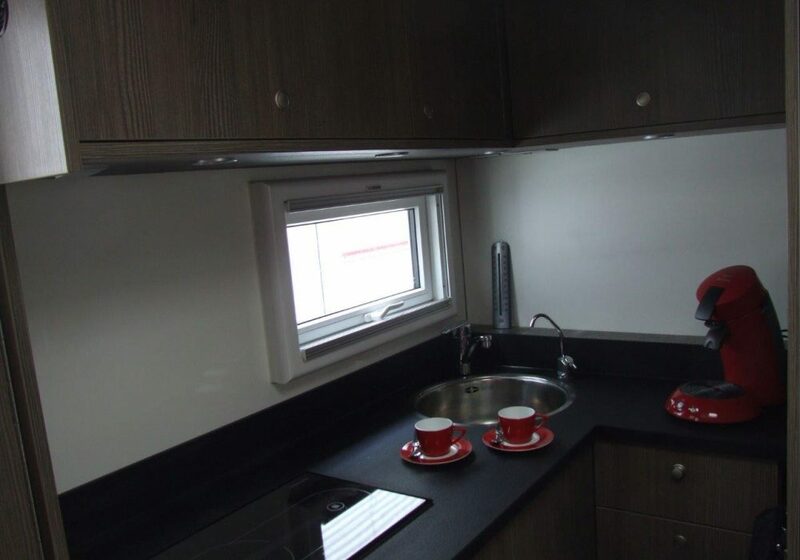 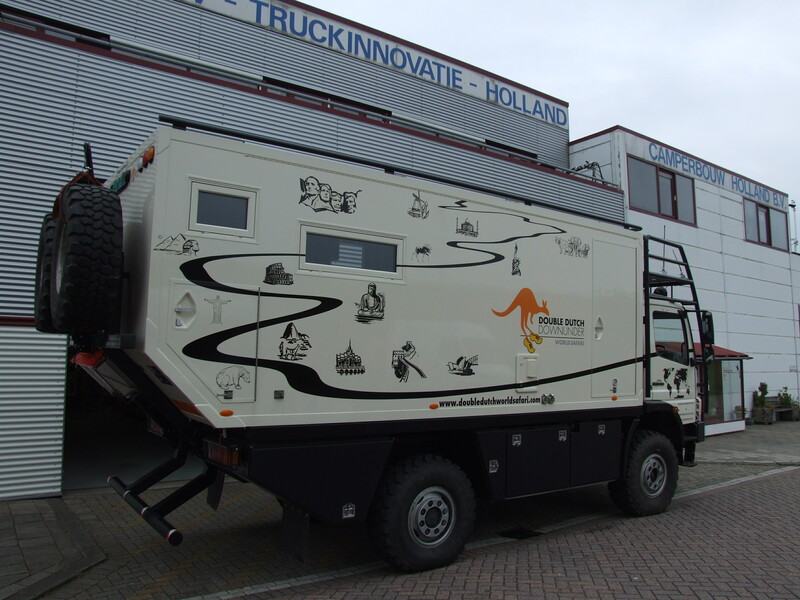 After seeing the larger trucks in Europe at the various shows and the extra room/space allowing for more water, living and storage space we were hooked on that concept. 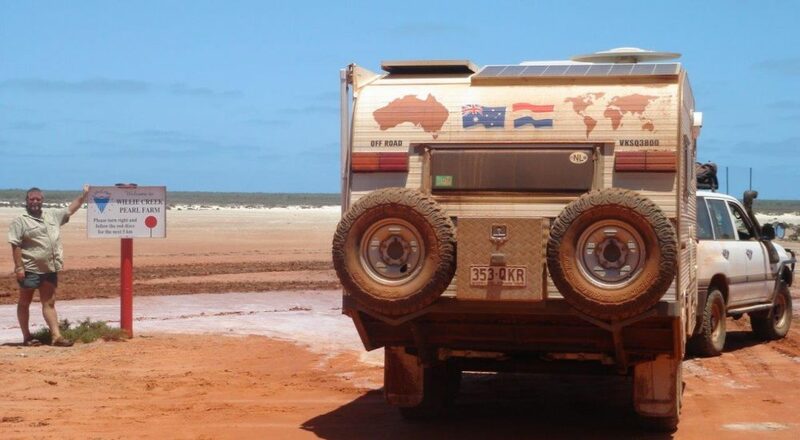 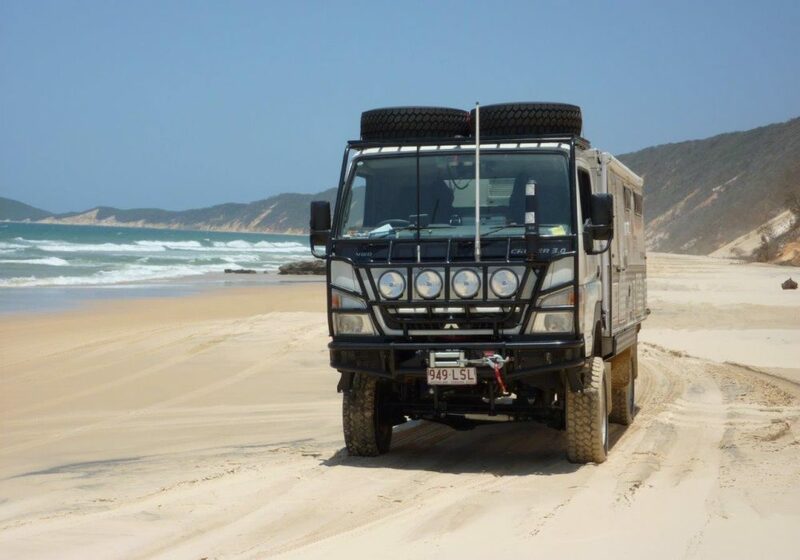 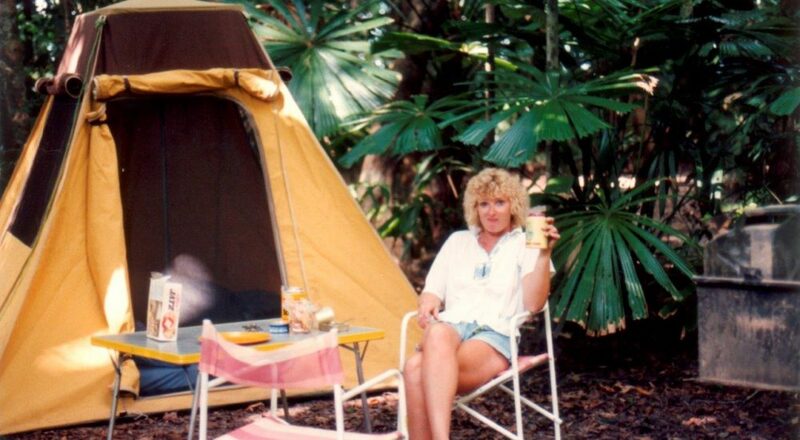 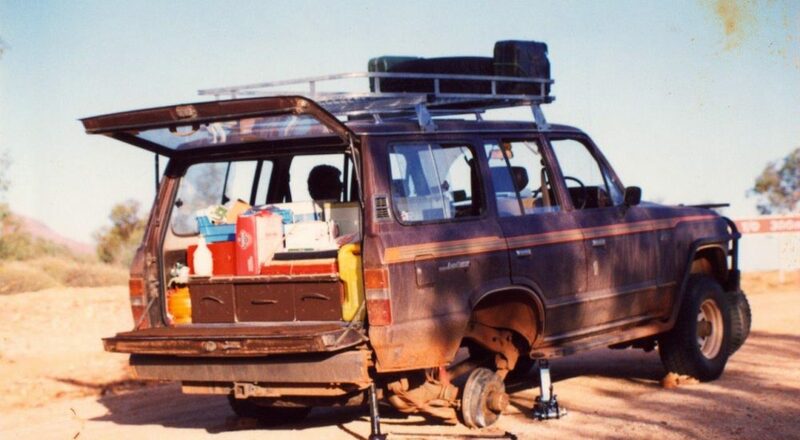 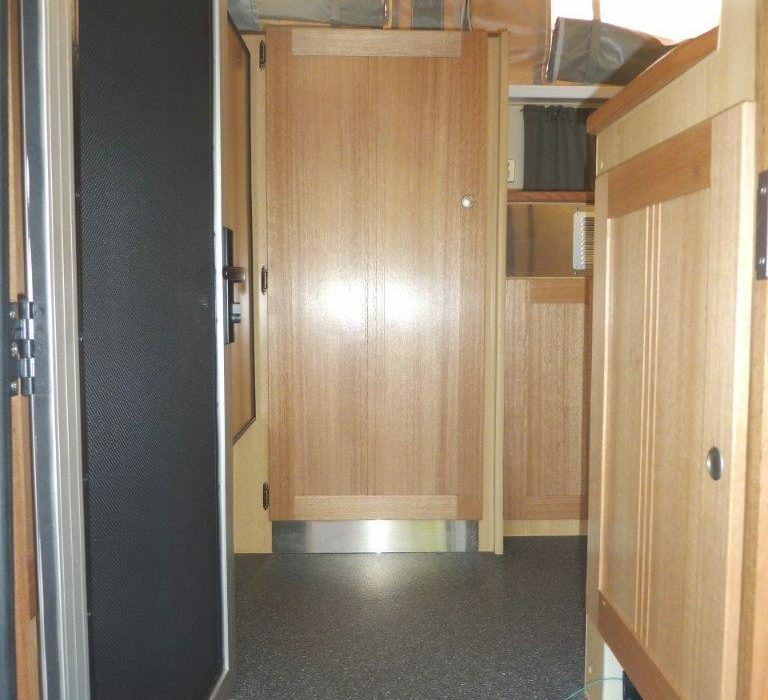 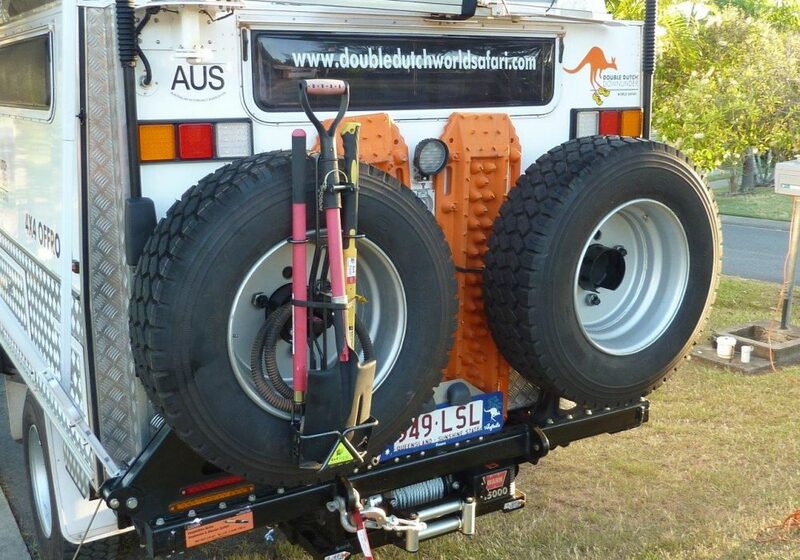 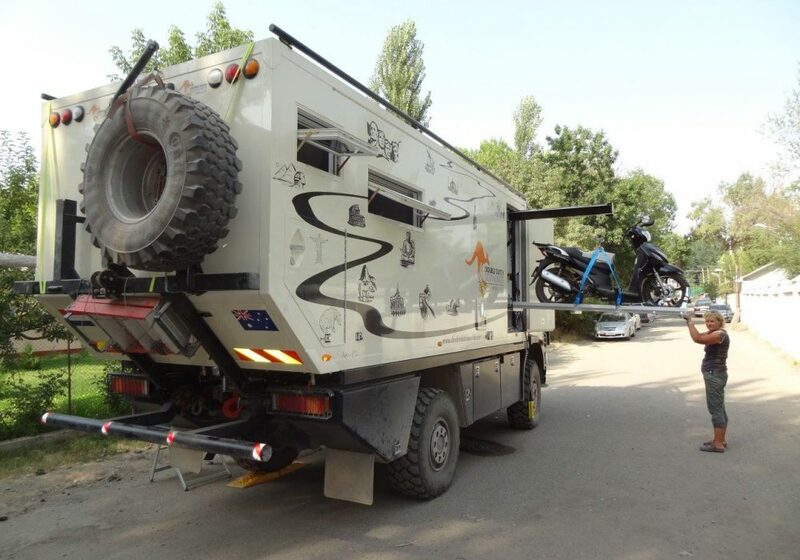 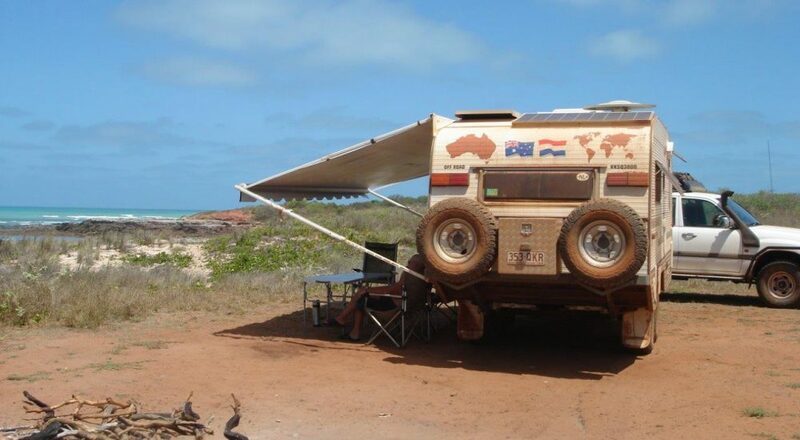 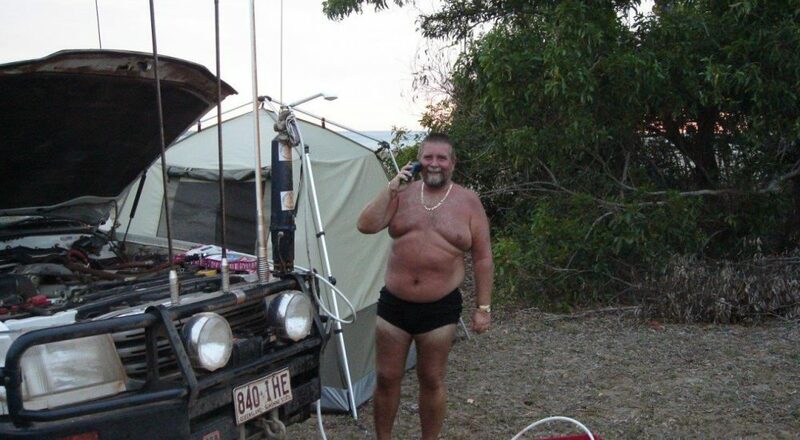 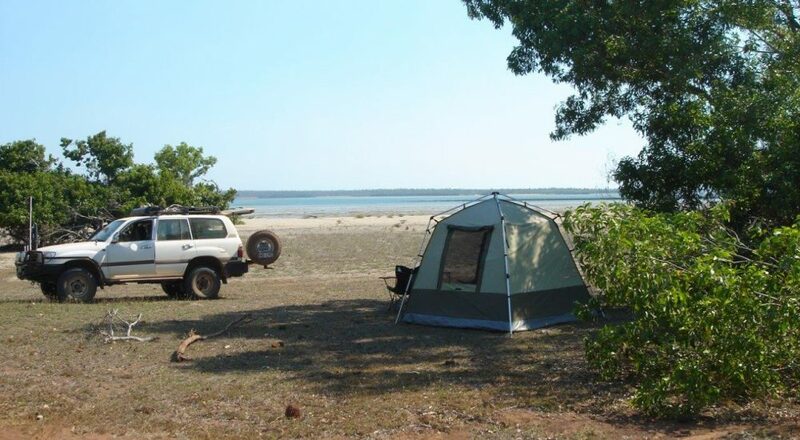 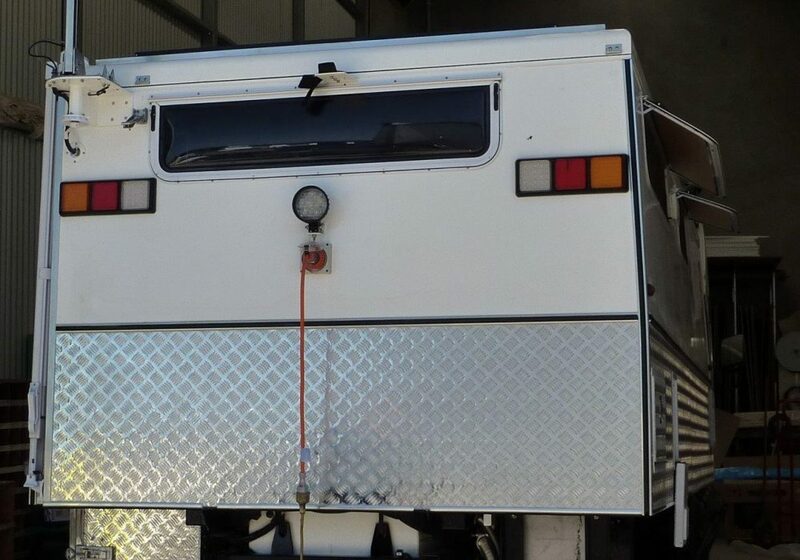 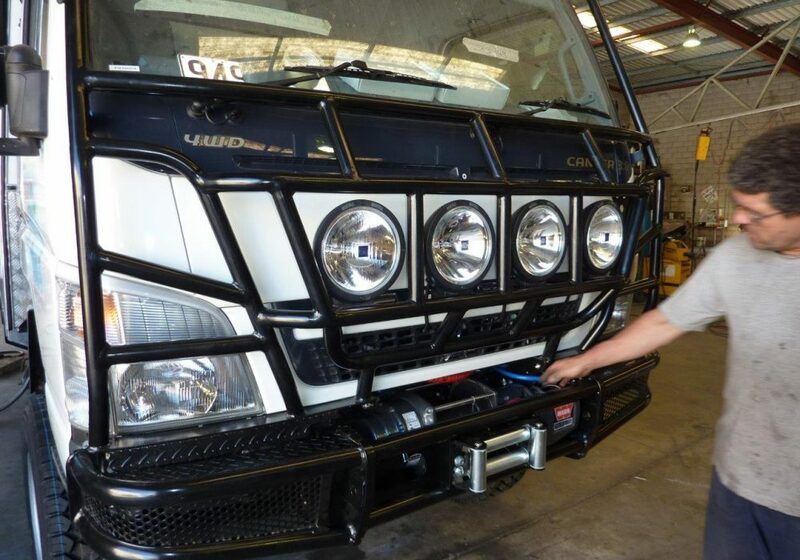 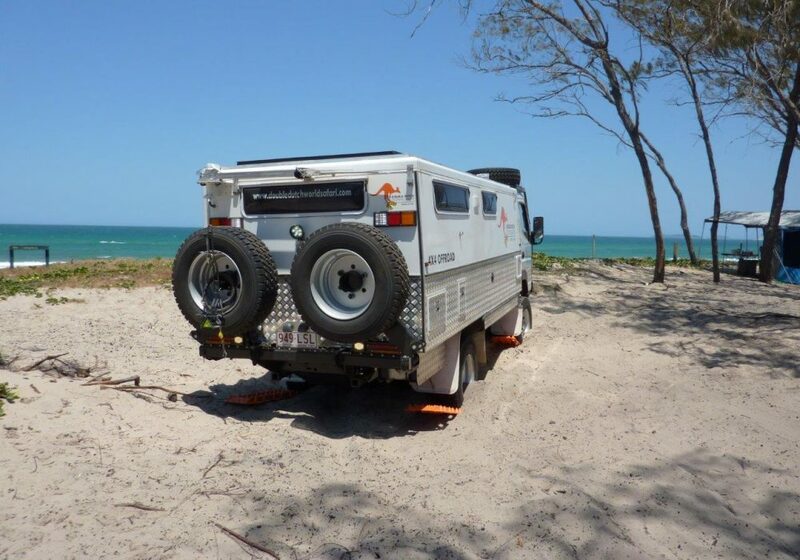 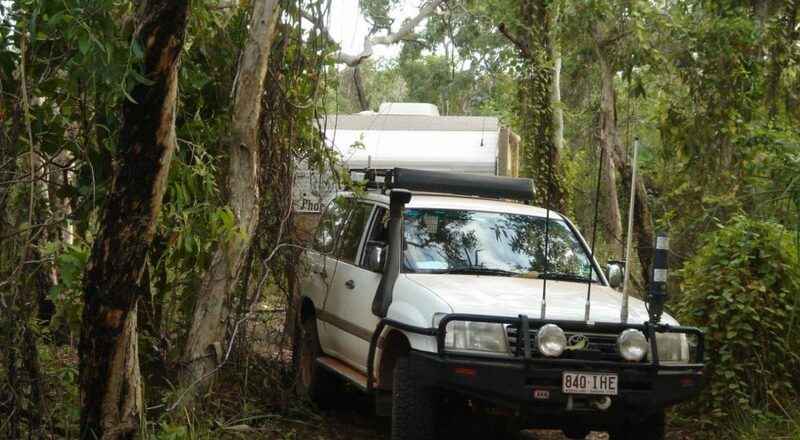 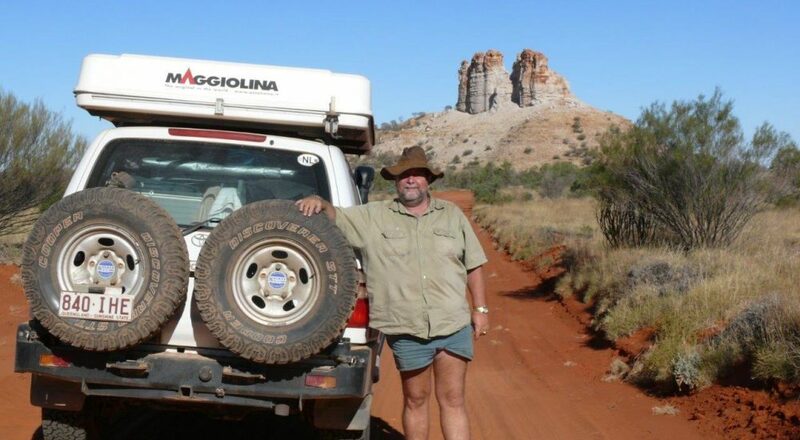 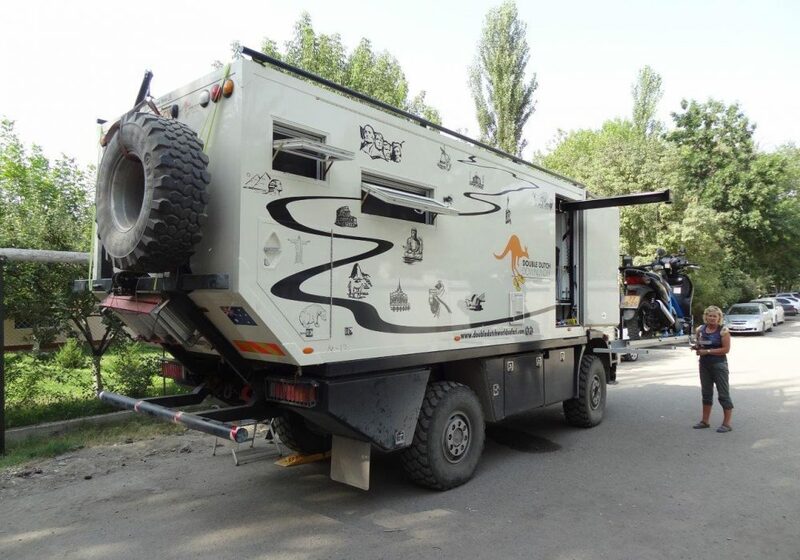 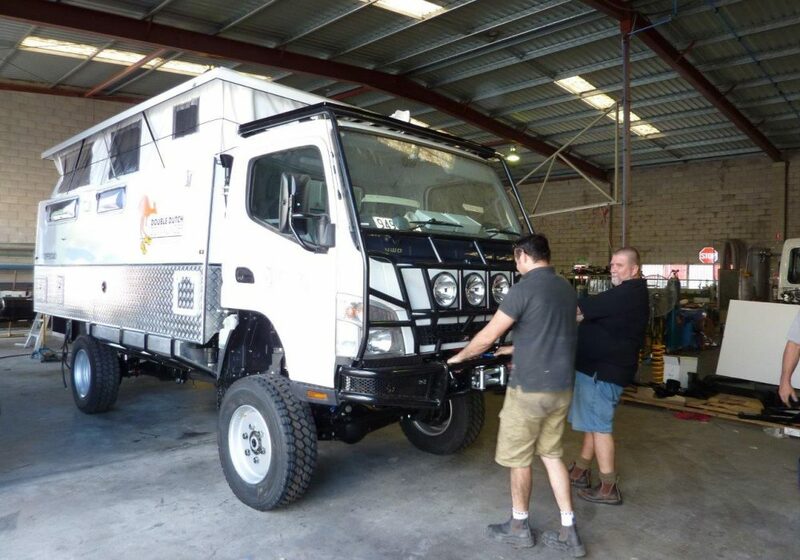 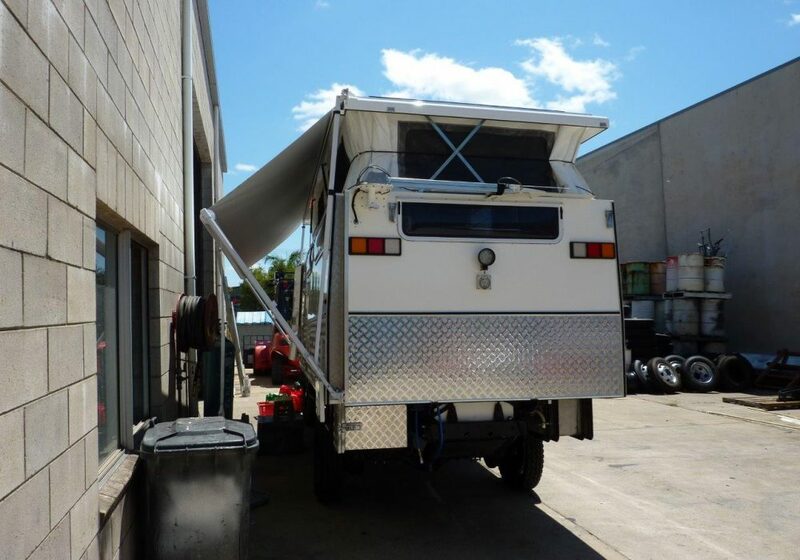 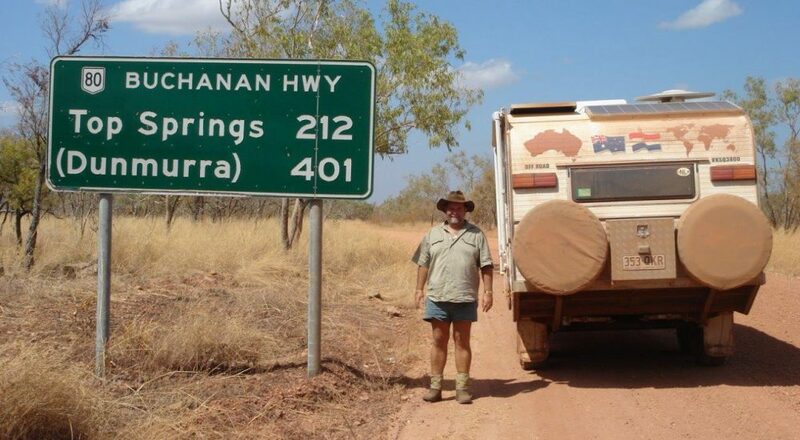 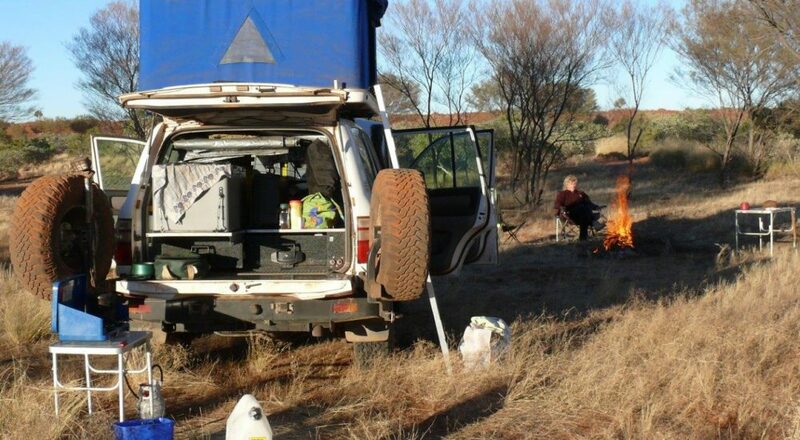 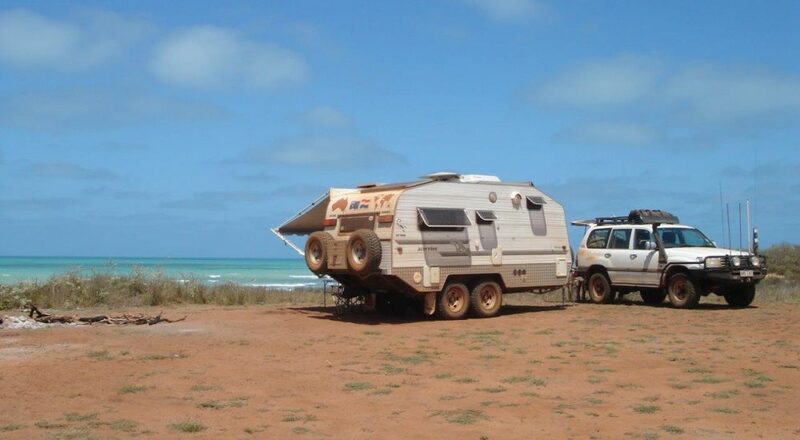 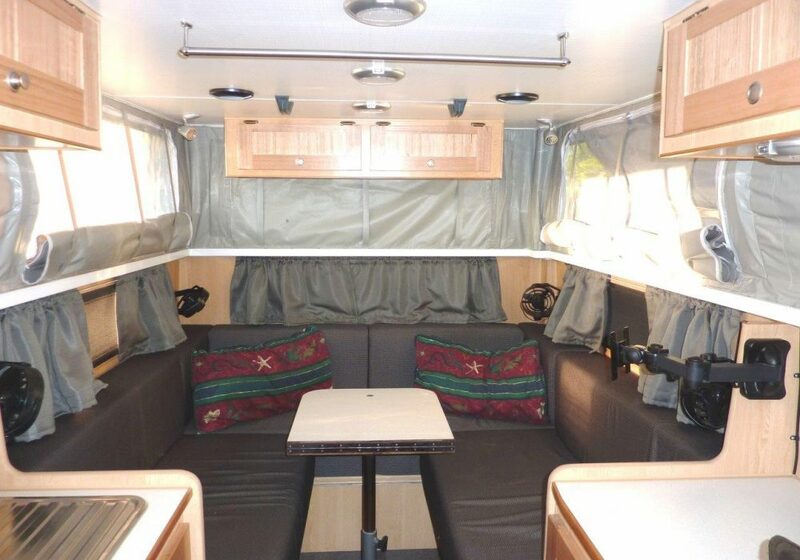 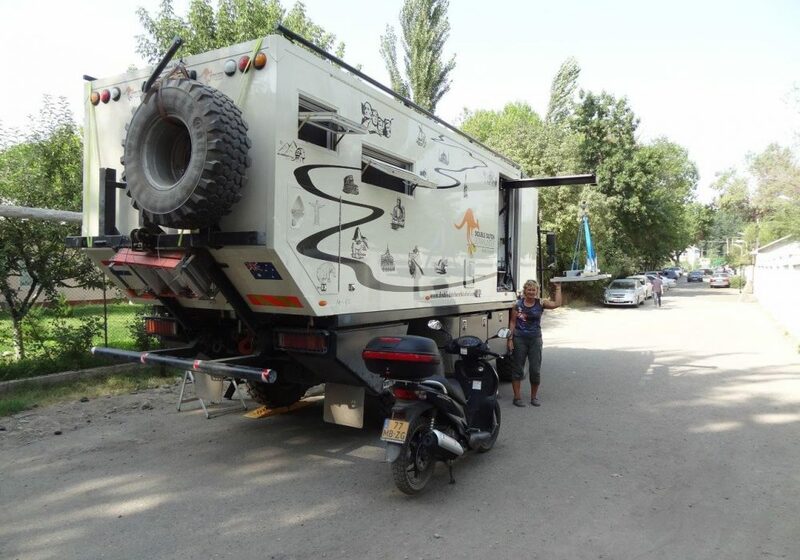 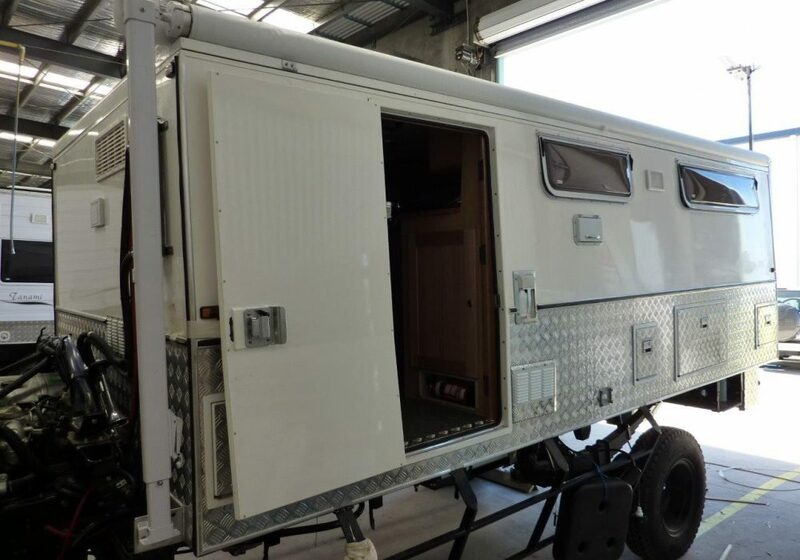 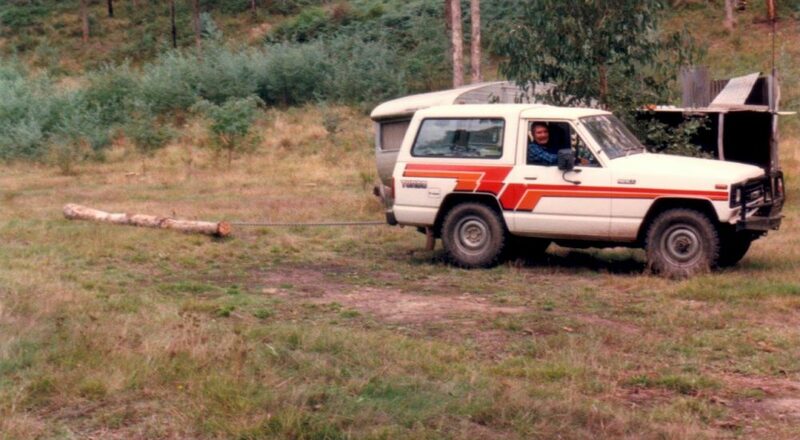 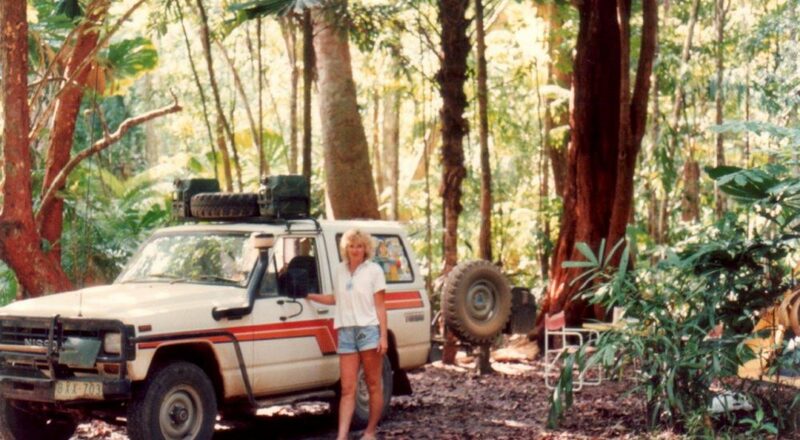 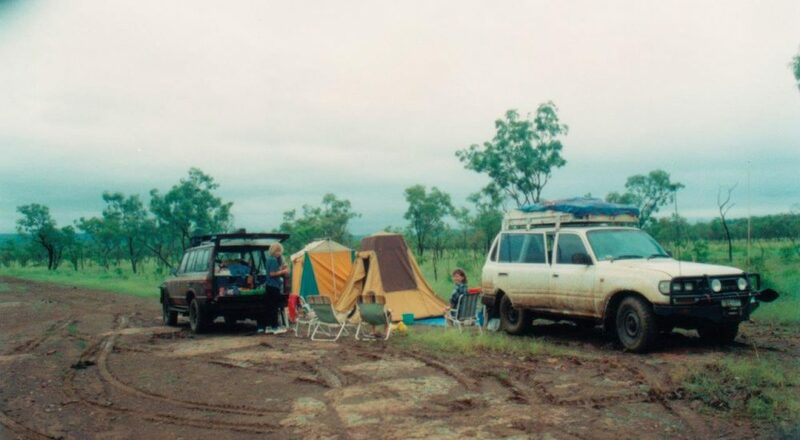 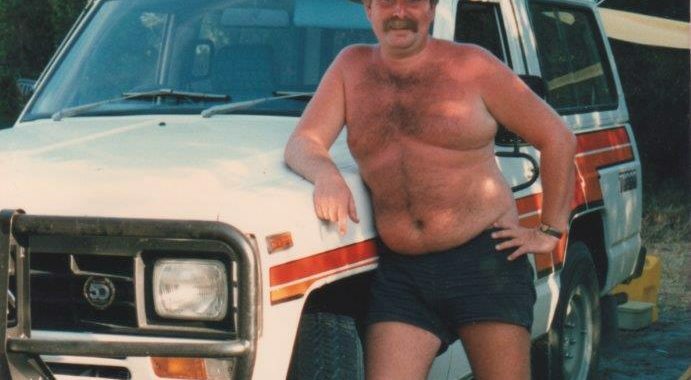 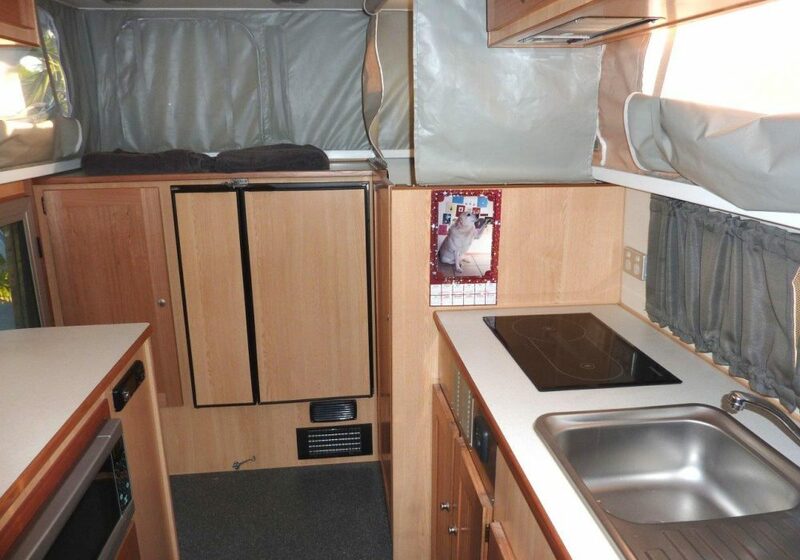 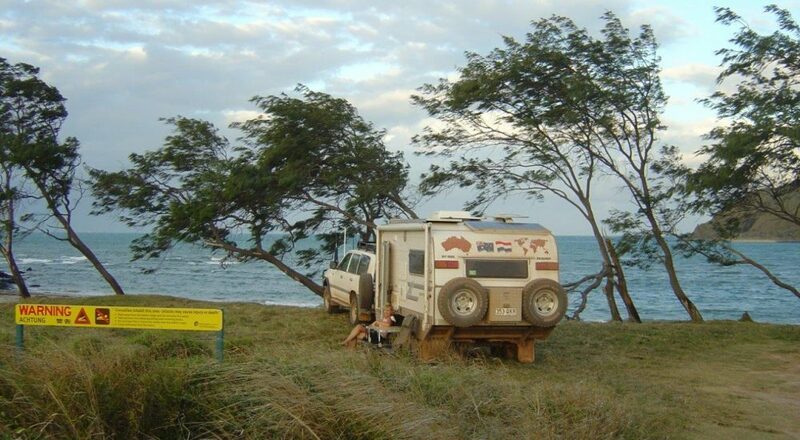 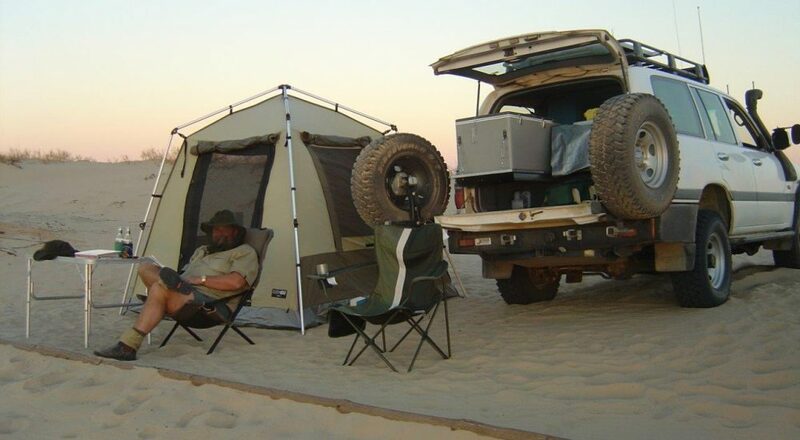 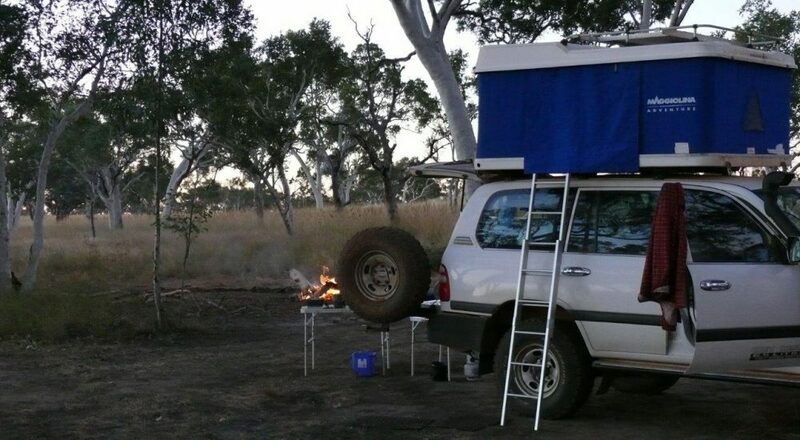 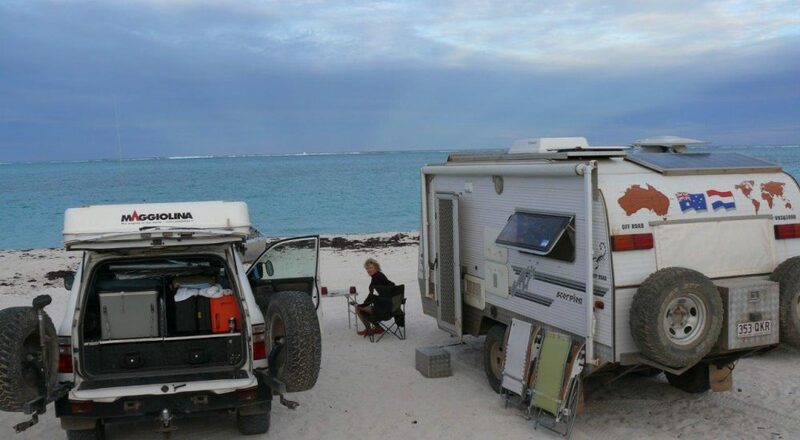 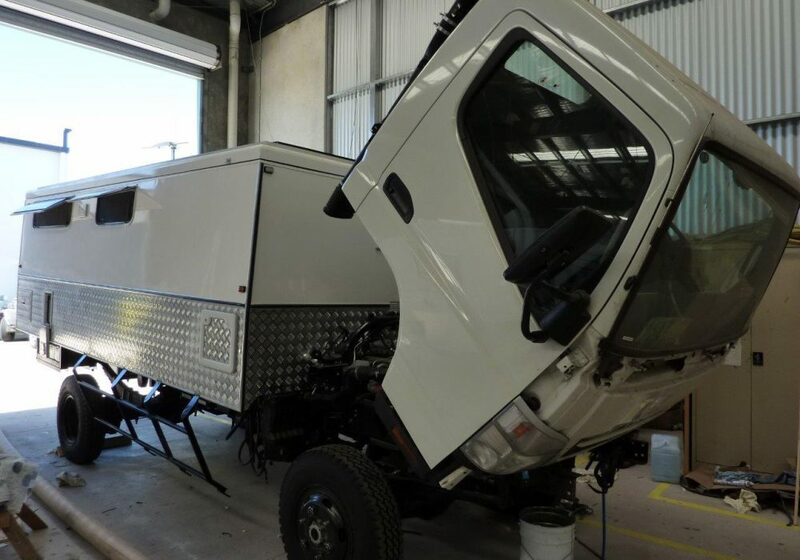 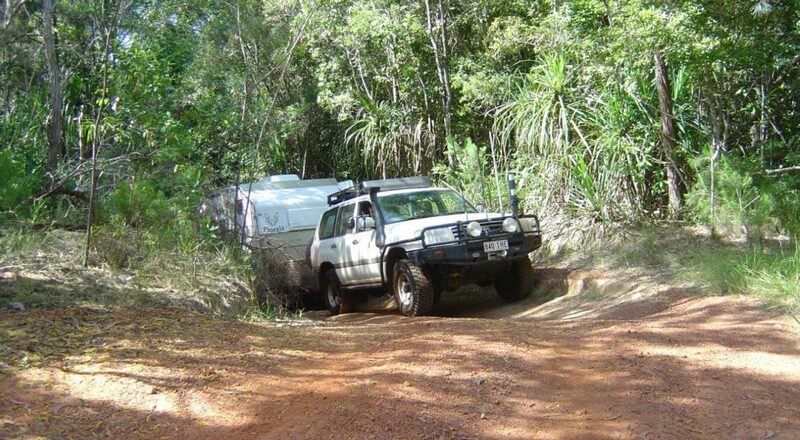 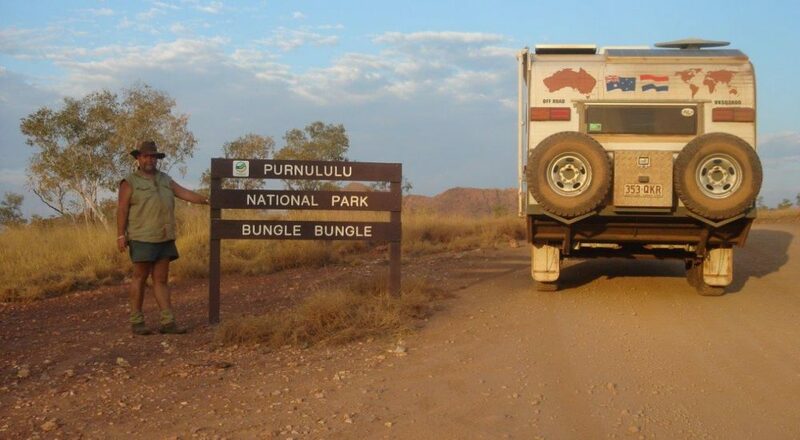 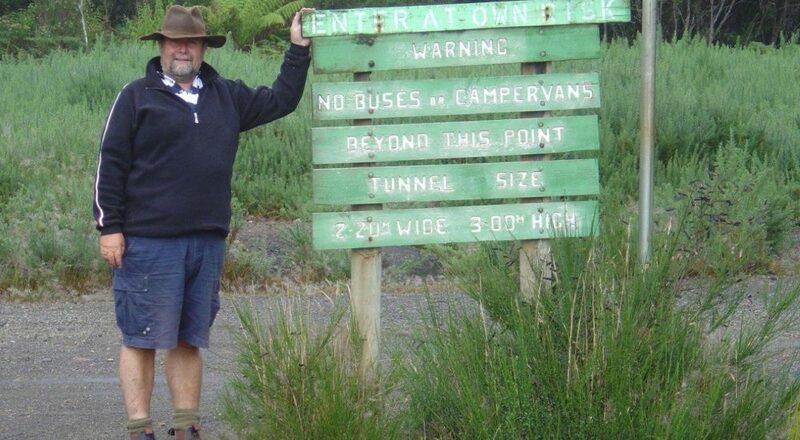 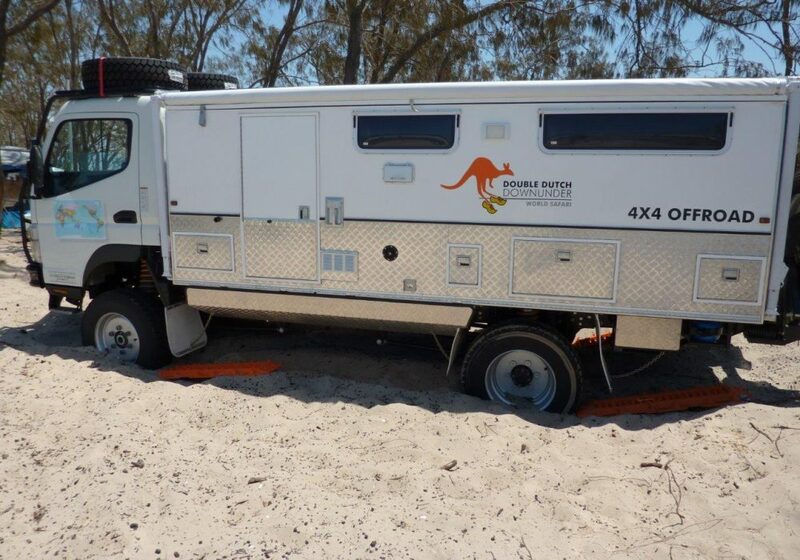 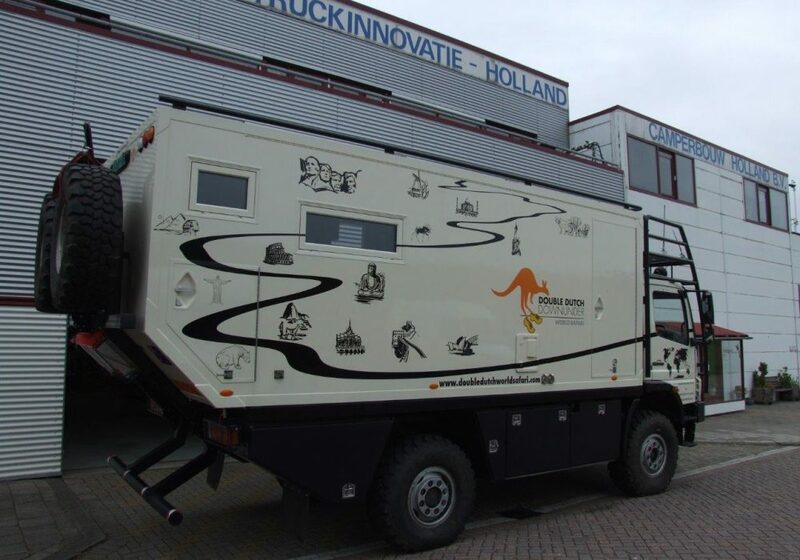 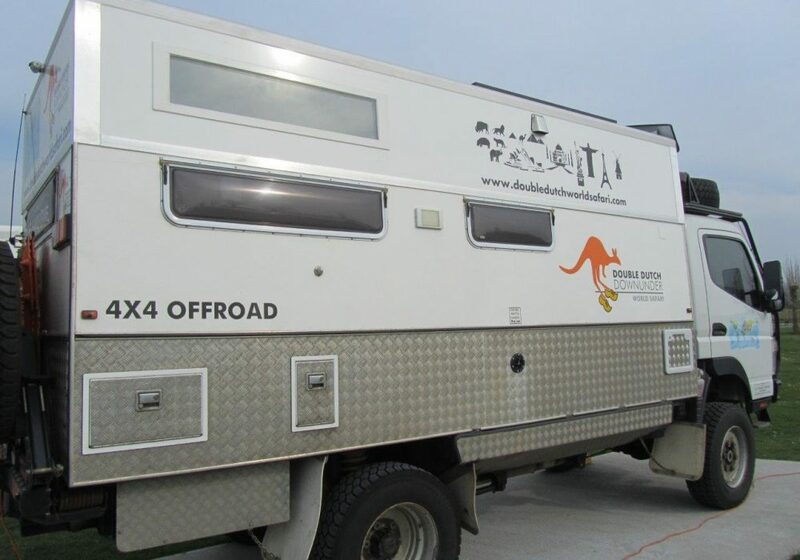 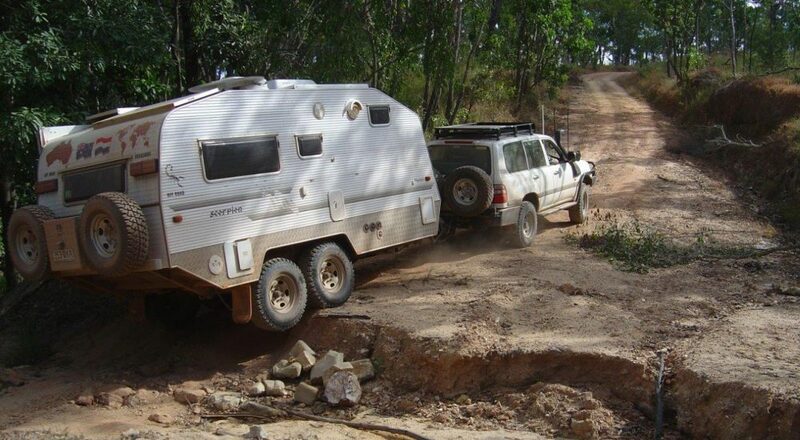 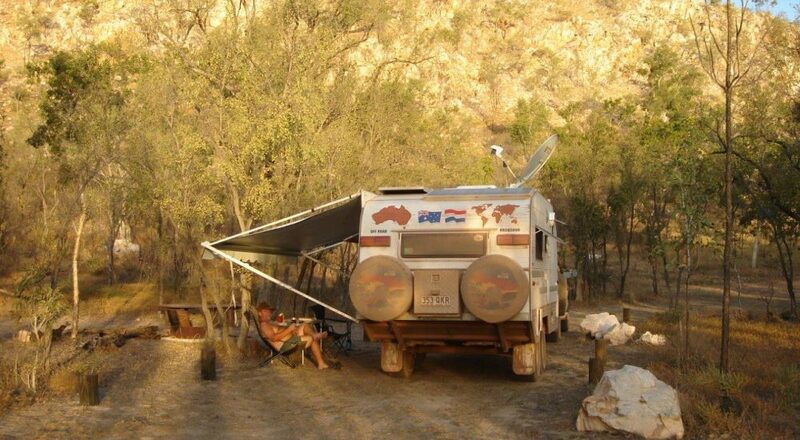 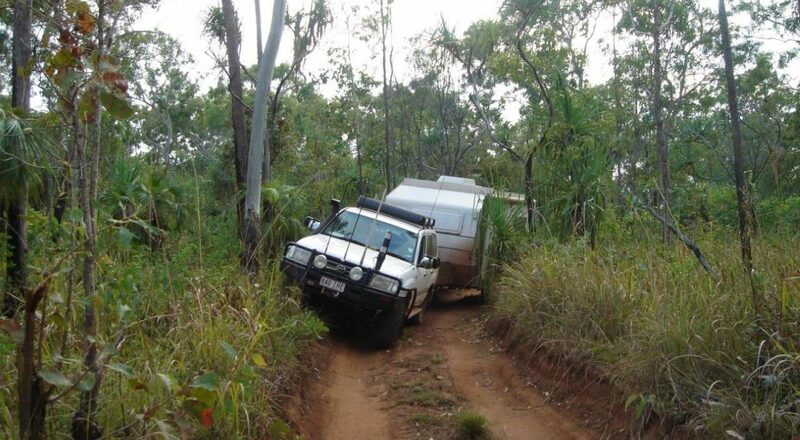 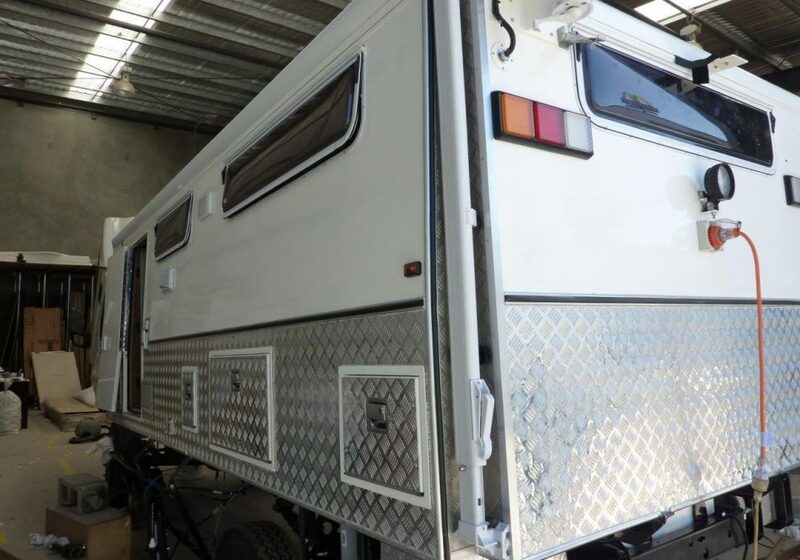 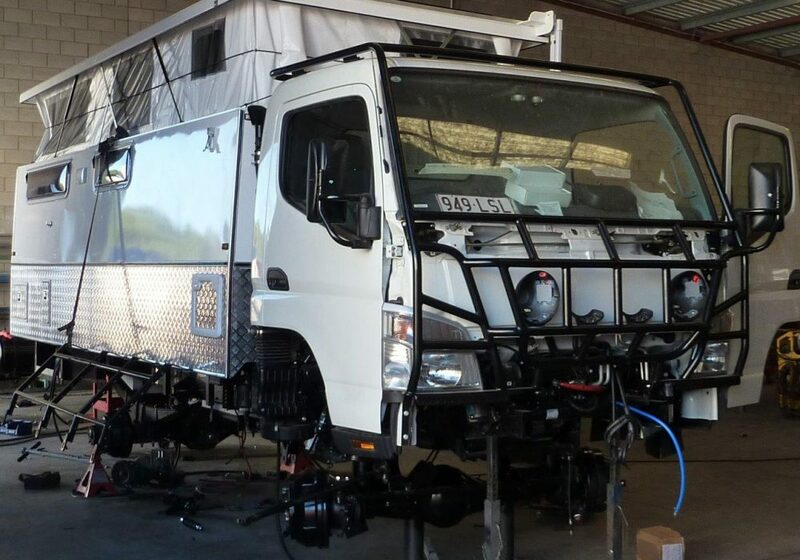 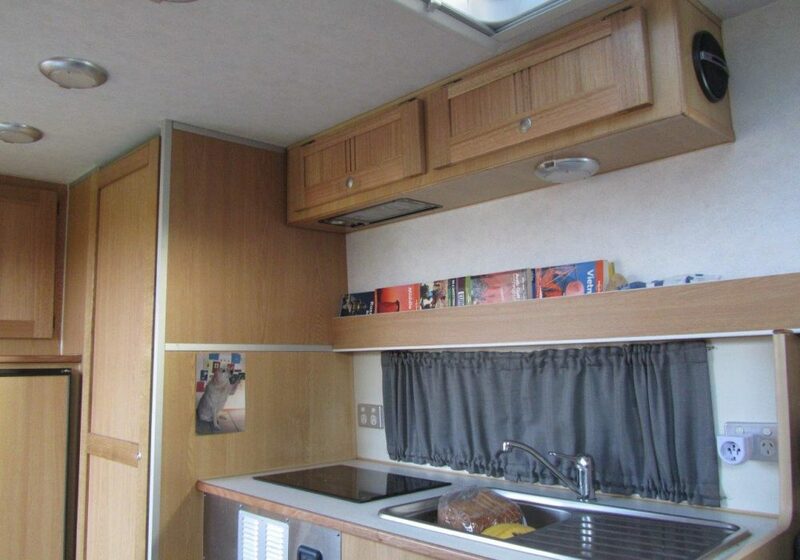 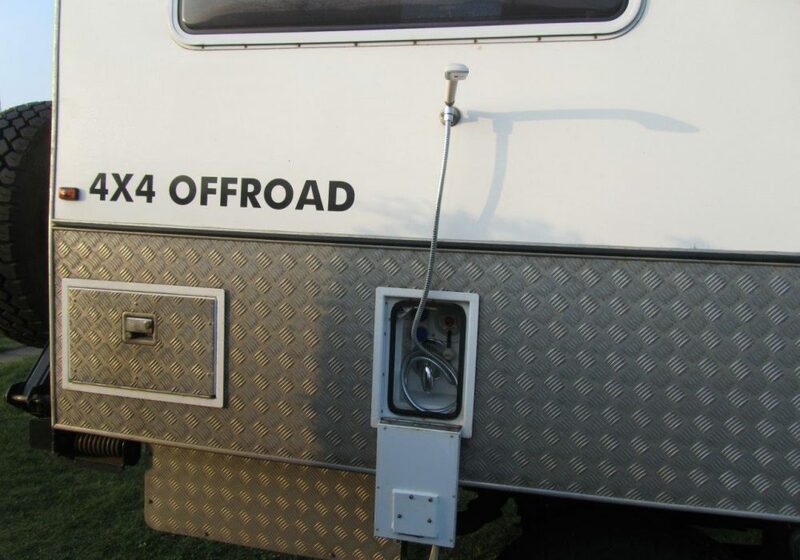 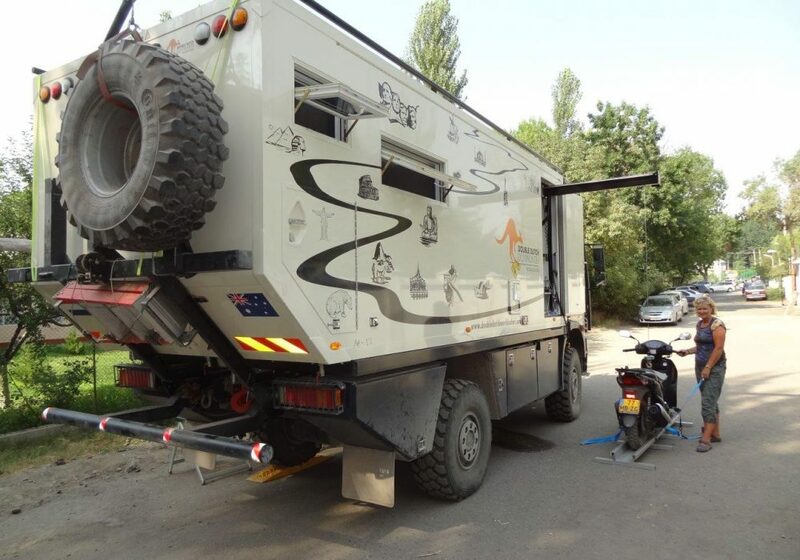 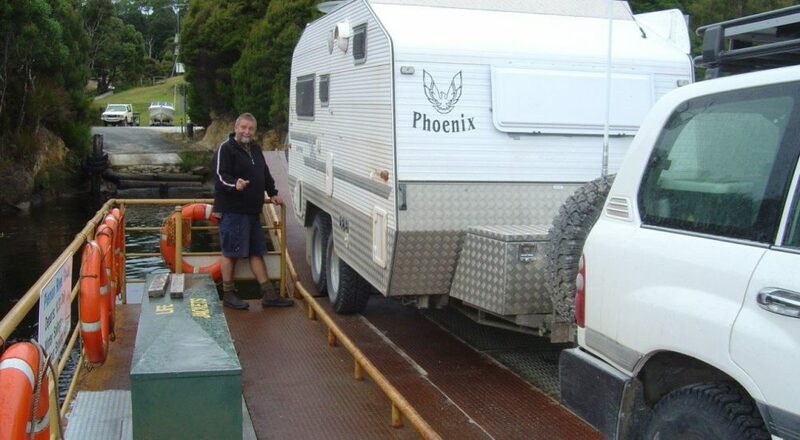 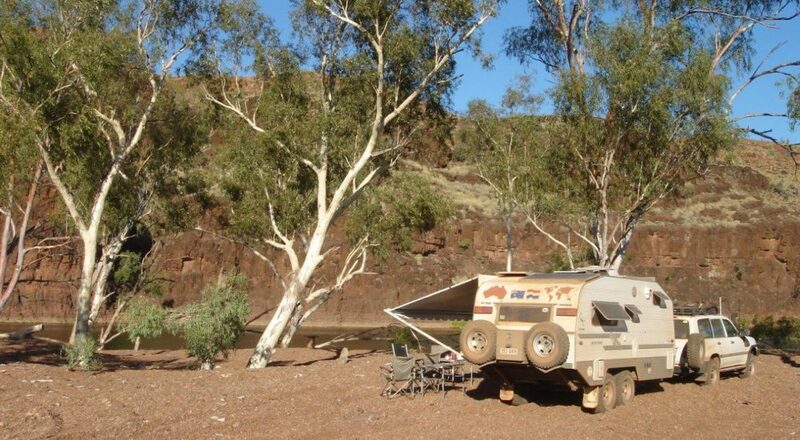 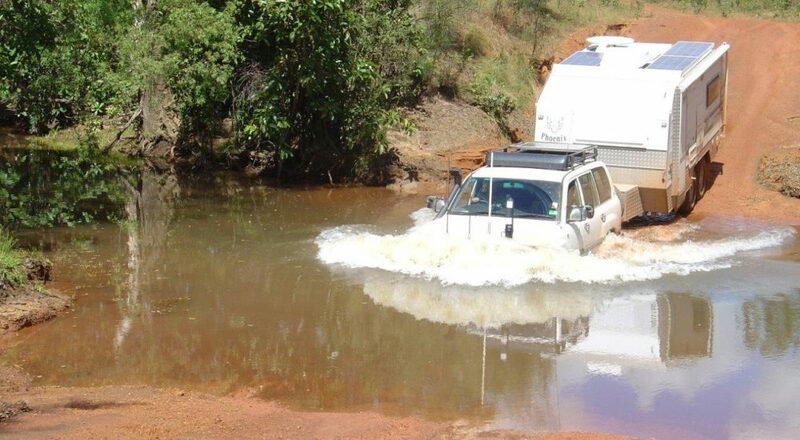 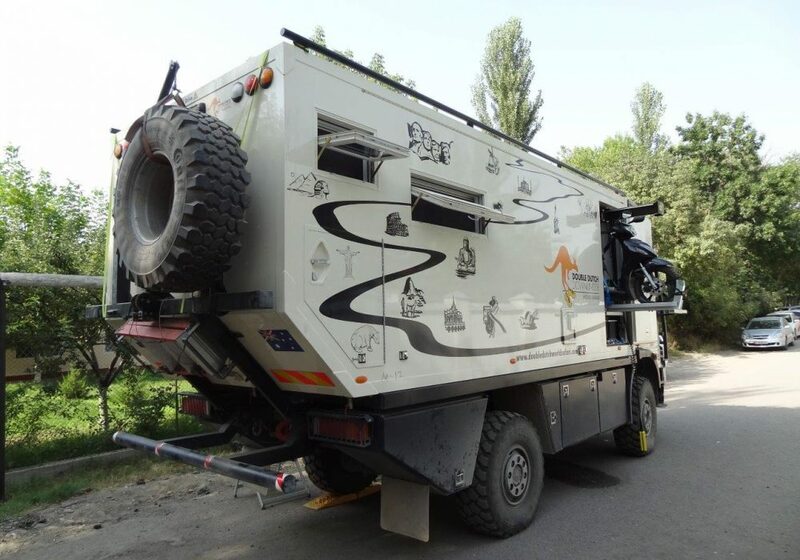 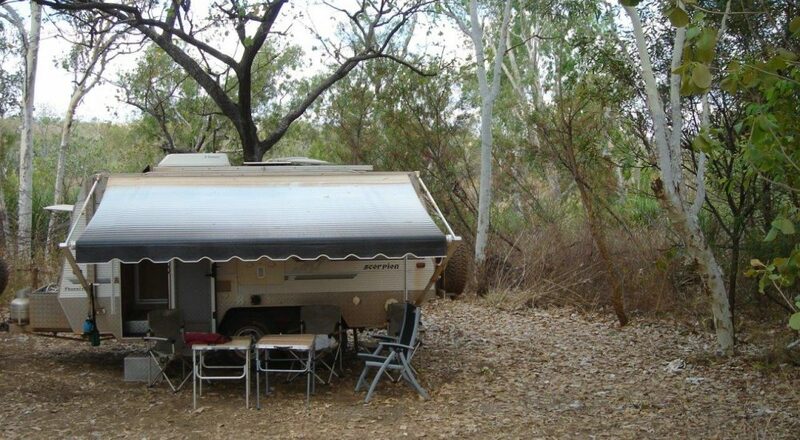 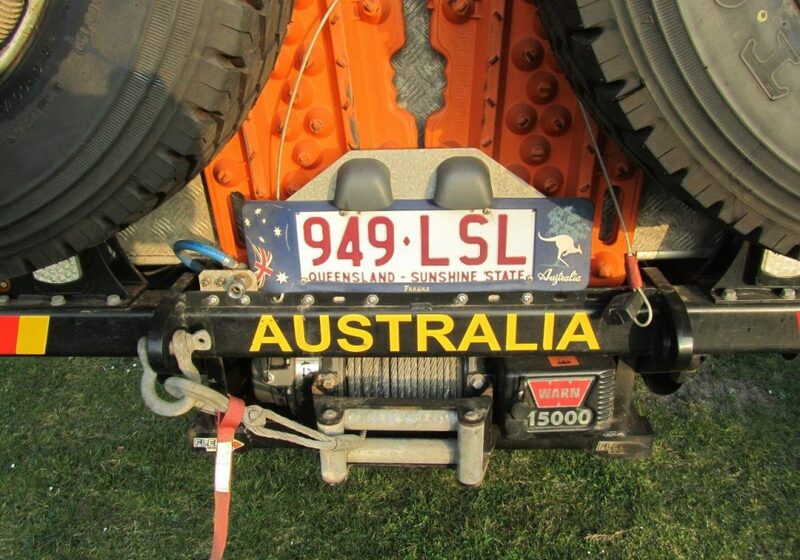 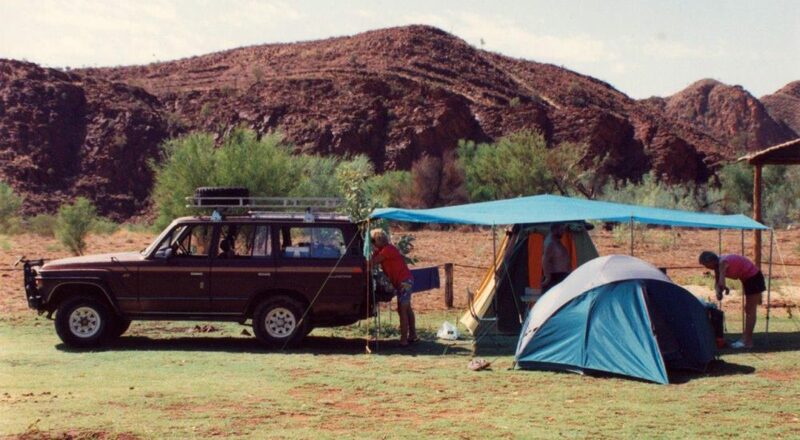 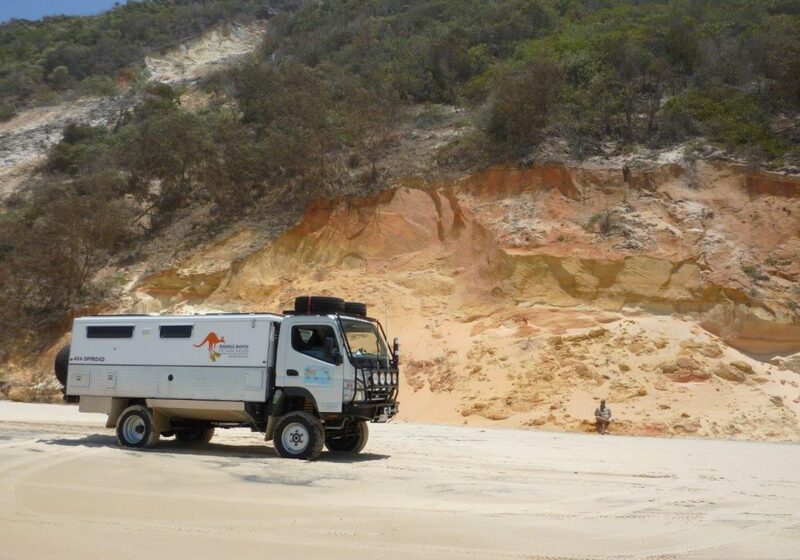 Except from the Australian Build Oka we had hardly seen overland motorhomes in Australia. 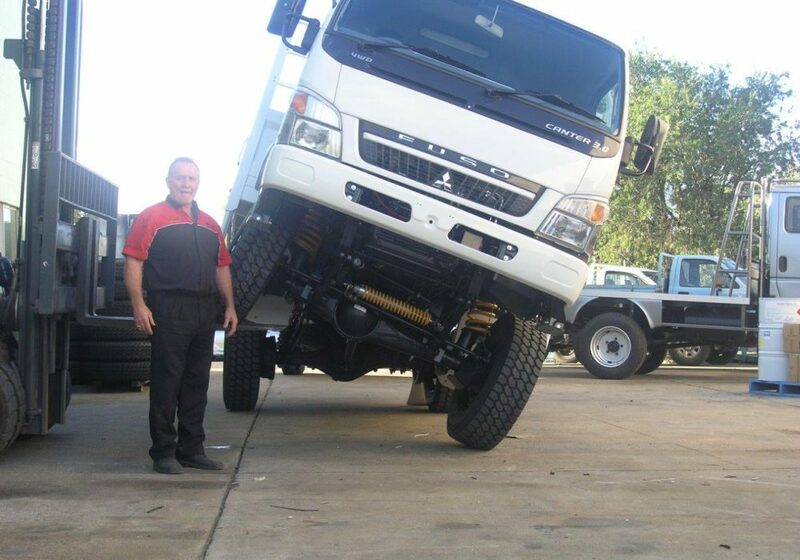 However, we noticed stacks of Fuso 4X4 bushfire trucks, mining vehicles and off road tour busses in service in Australia and it became clear they have a reputation as a tough and reliable little unit. 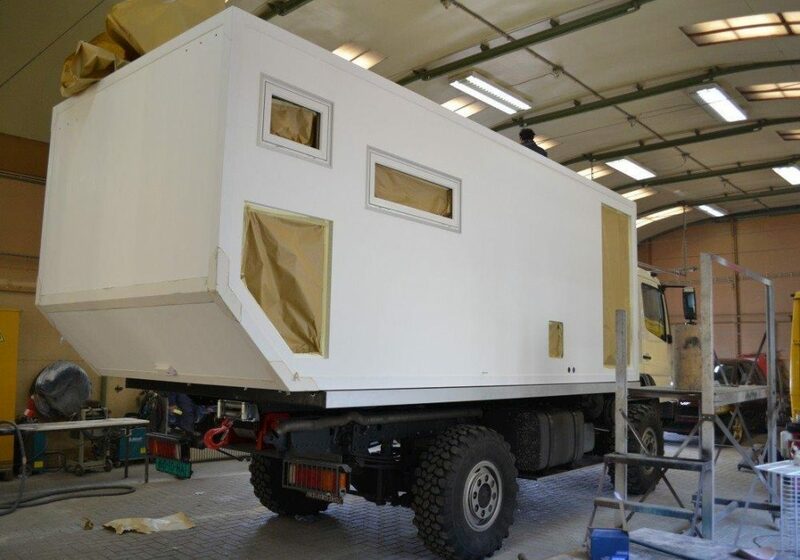 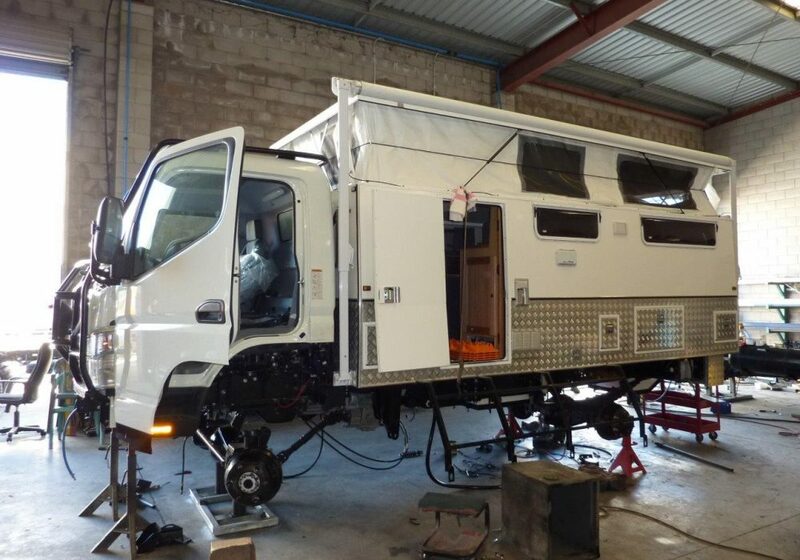 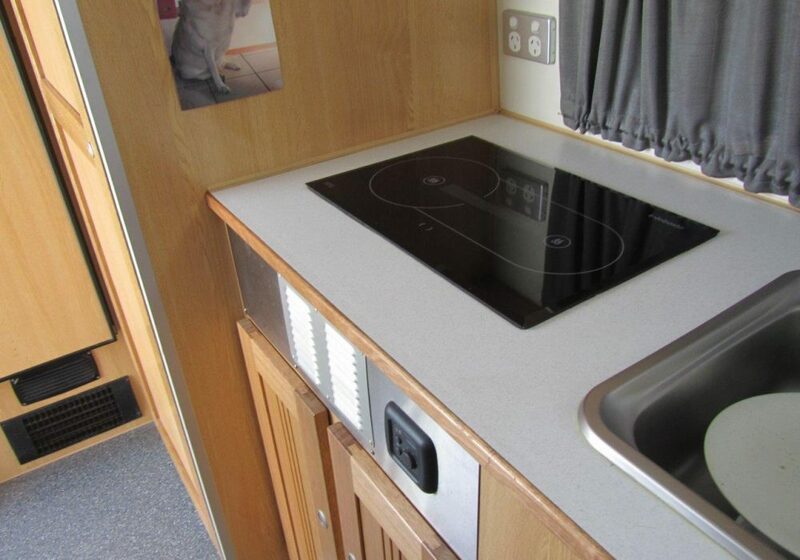 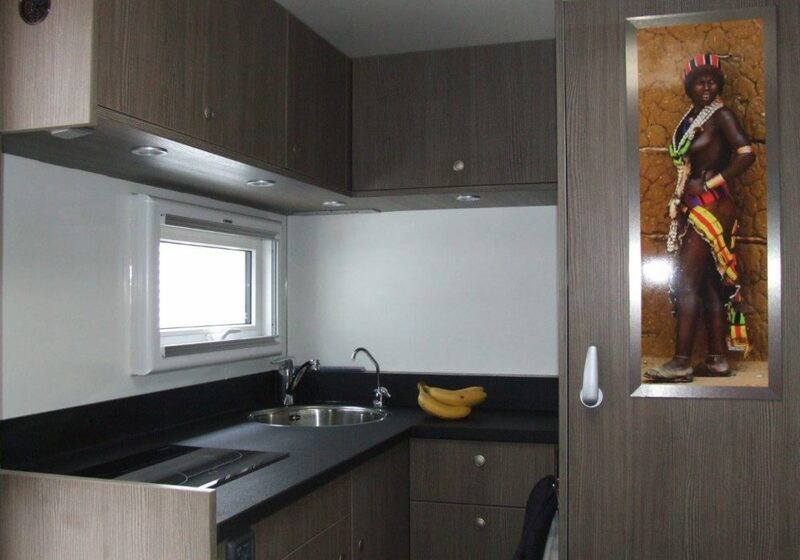 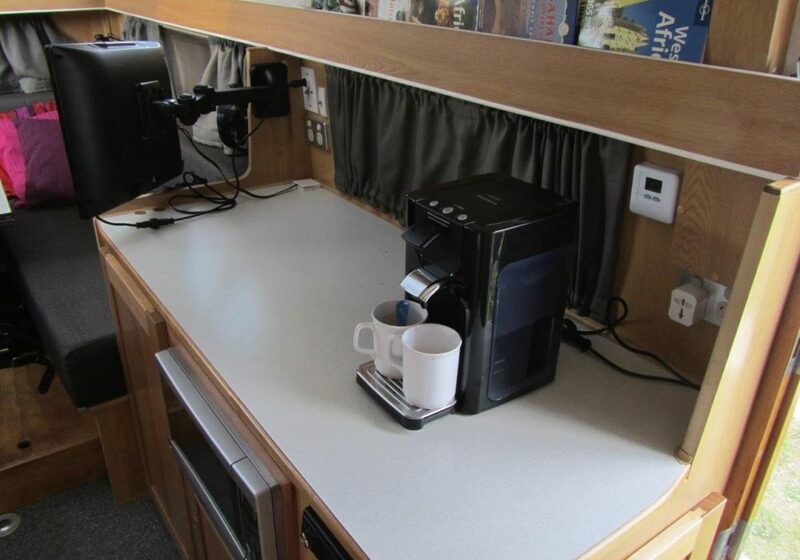 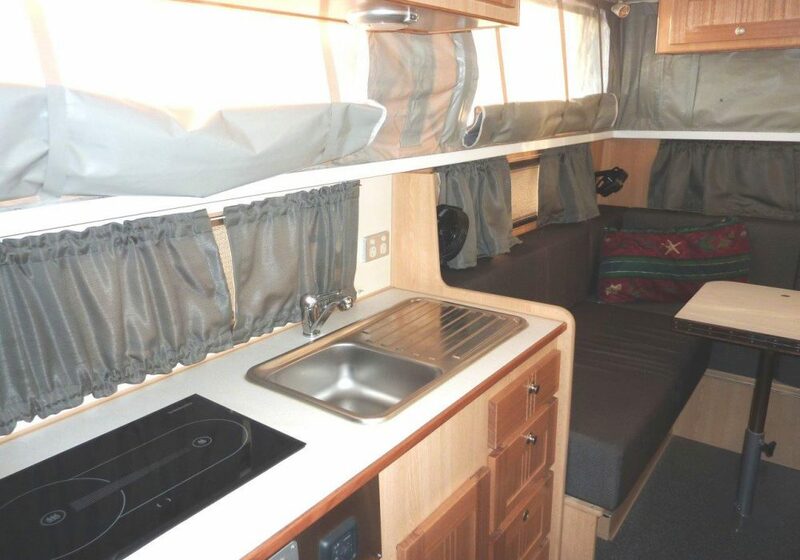 We choose for our first larger off road motorhome, the Fuso FG 84 Turbo Diesel 4.9 with a wheel base of 3460mm. 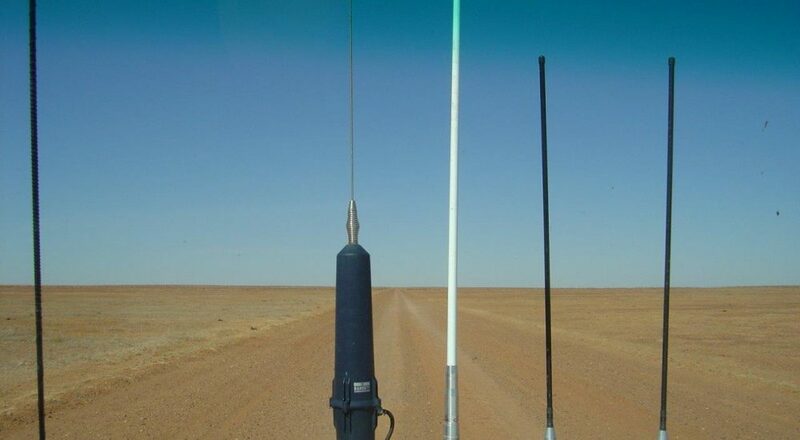 Approach and departure angles are amazing and the low range is fantastic. 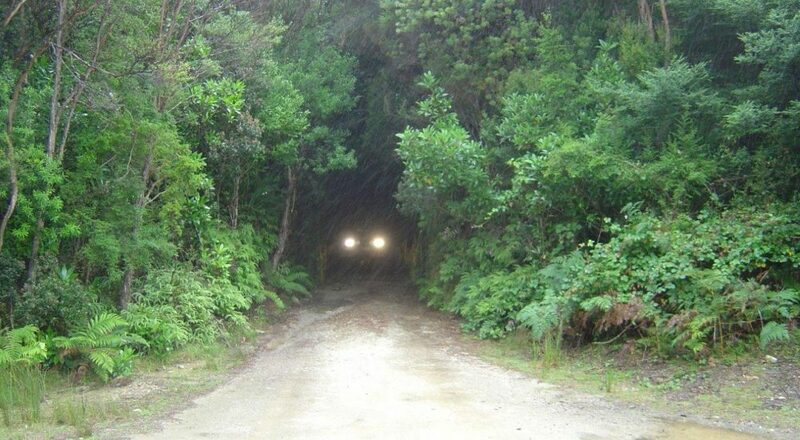 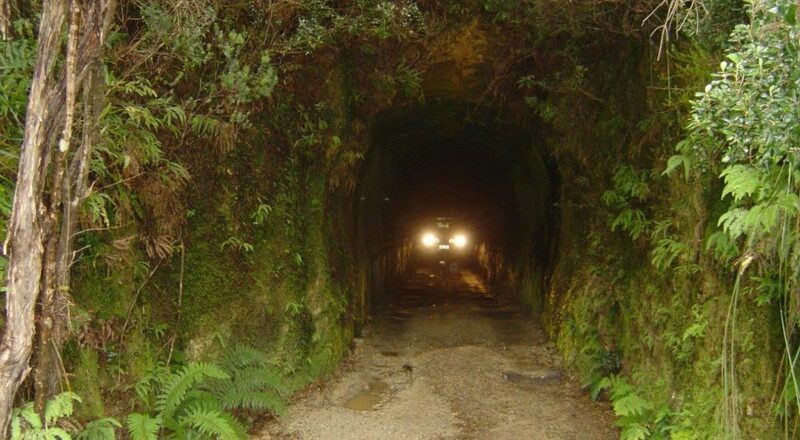 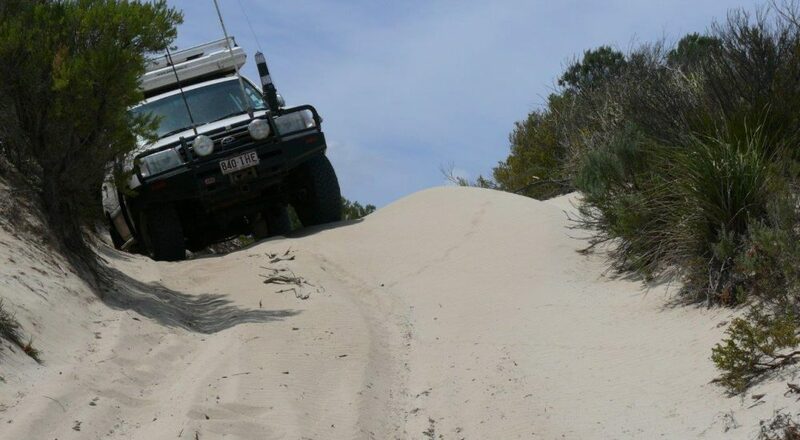 You can crawl down an extremely steep slope in first or reverse gear without touching the brakes; and crawl up a steep pinch without touching the accelerator. 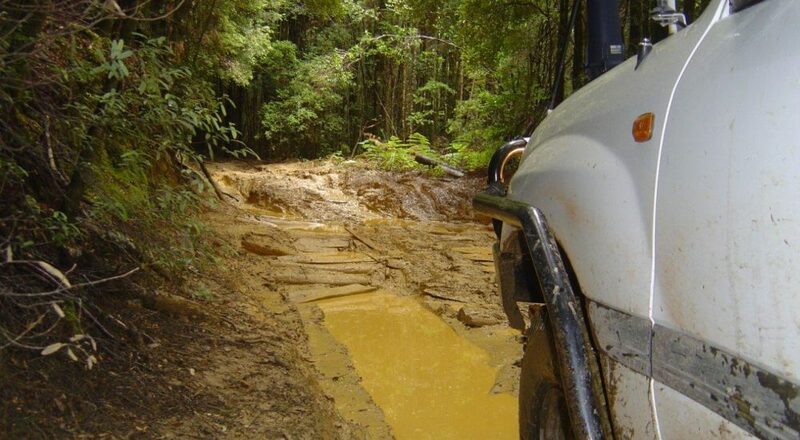 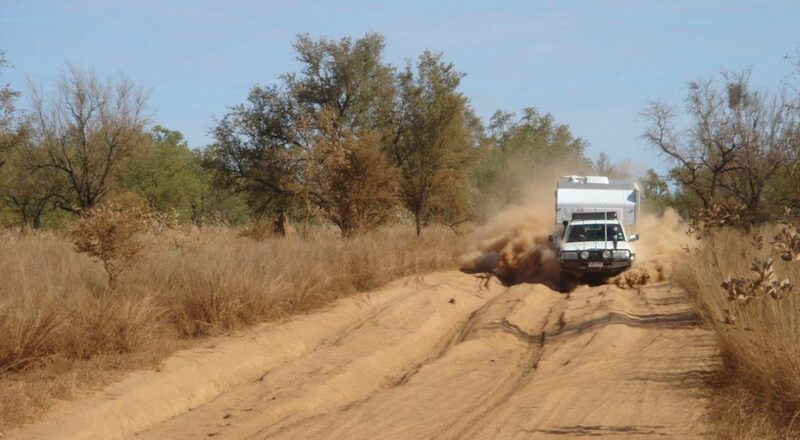 Travelling off the beaten track can be rough, dusty and demanding. 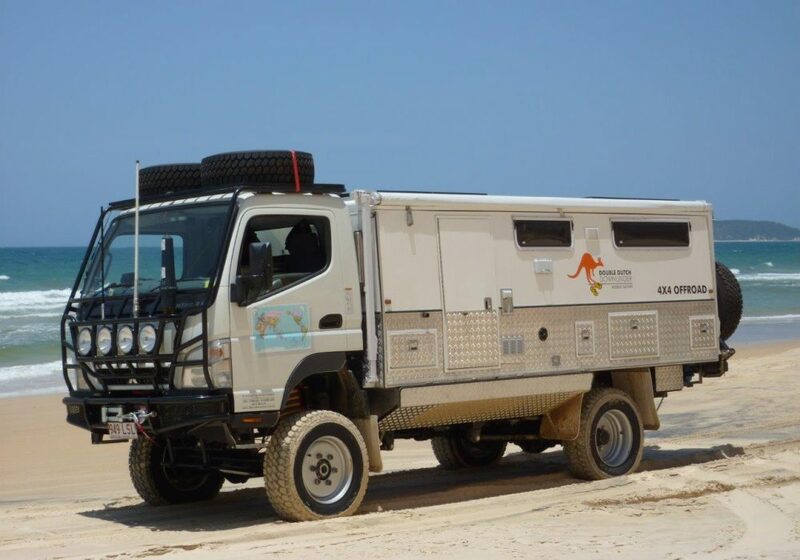 This truck has all the conceivable comfort you can ask for while travelling off the beaten track, all blended in a compact vehicle that got us to 80% of all places our Toyota land cruiser would have driven us. 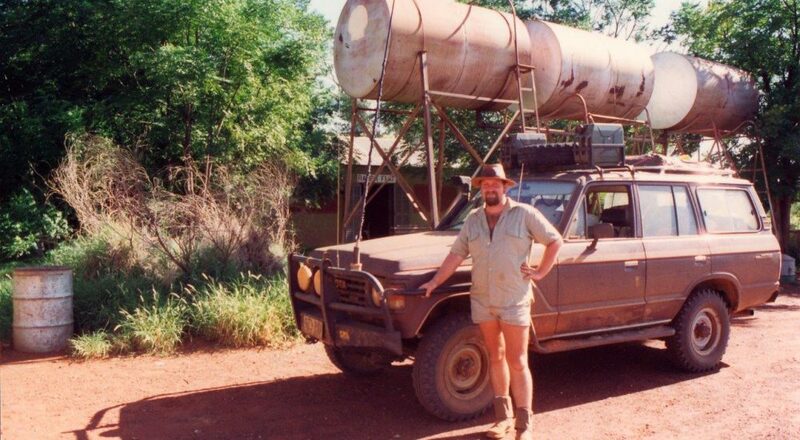 With a range of over 2000KM we never ran out of fuel in Africa and South East Asia. 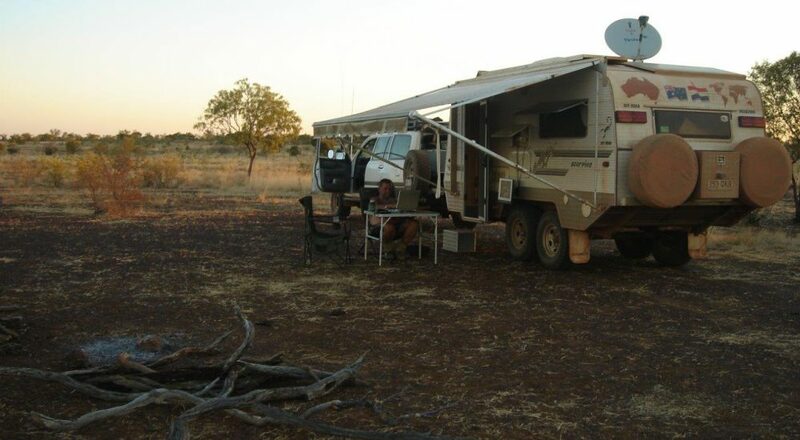 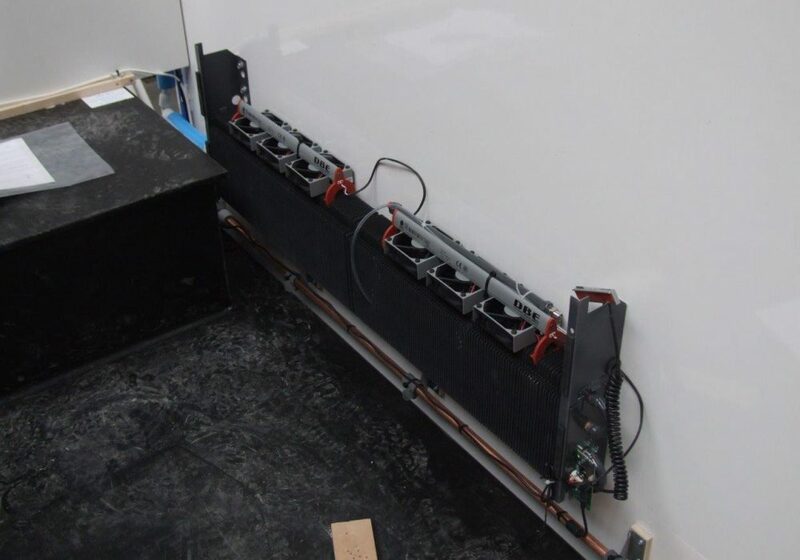 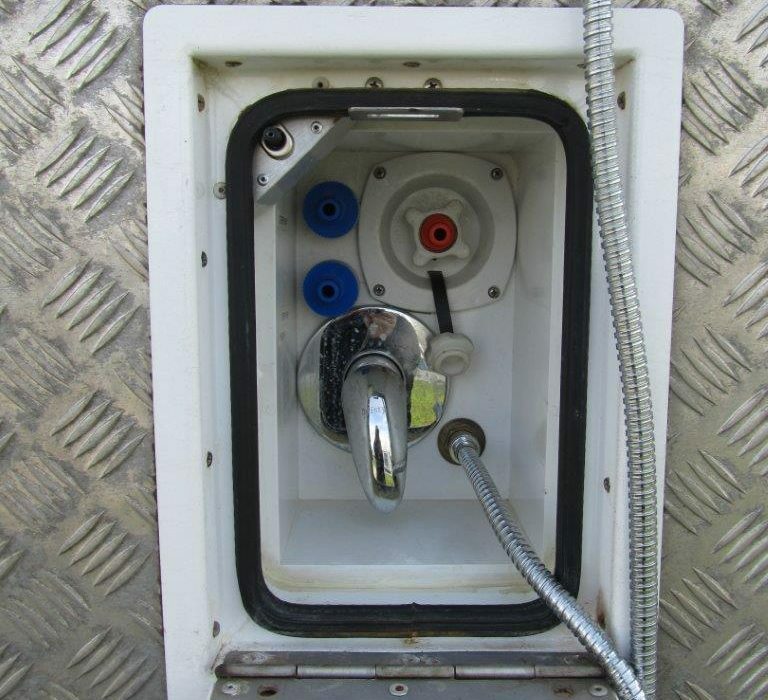 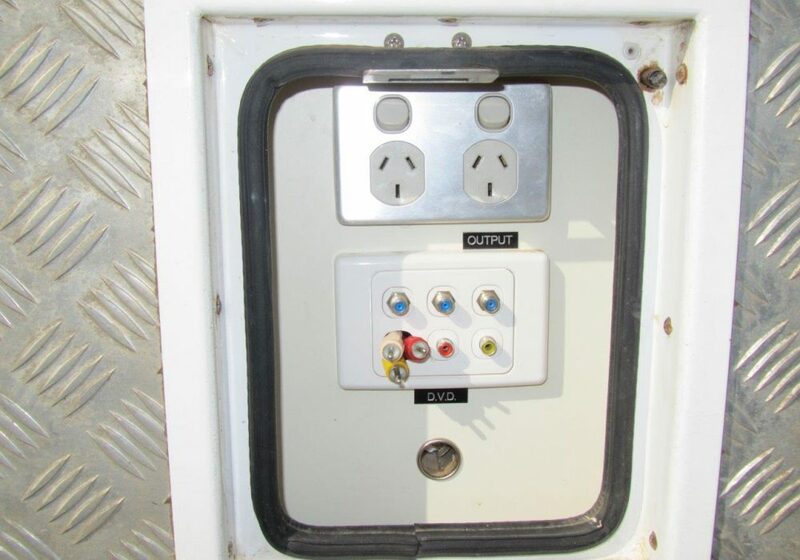 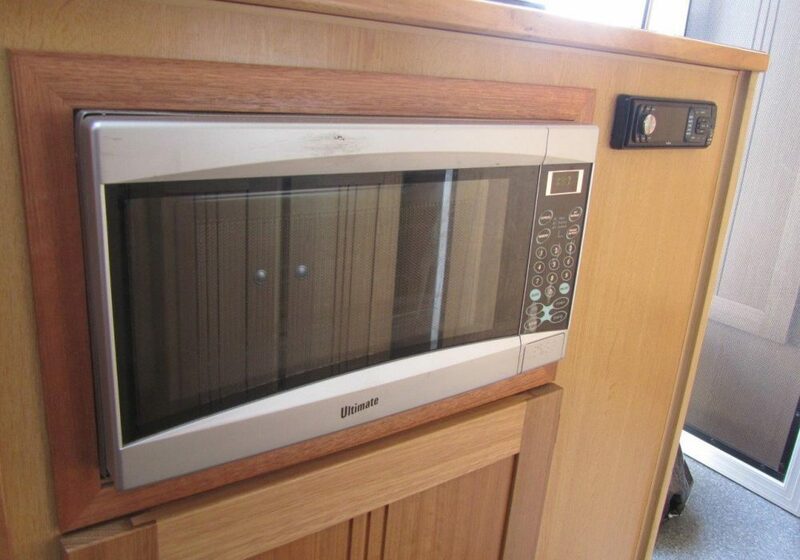 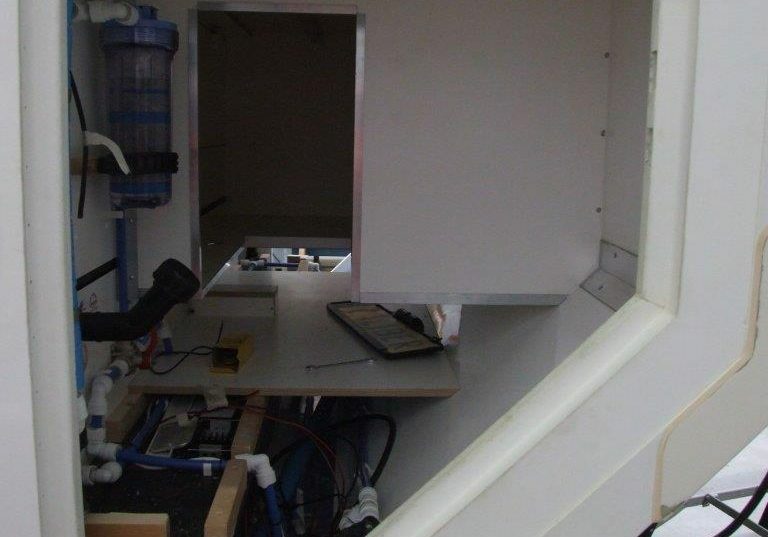 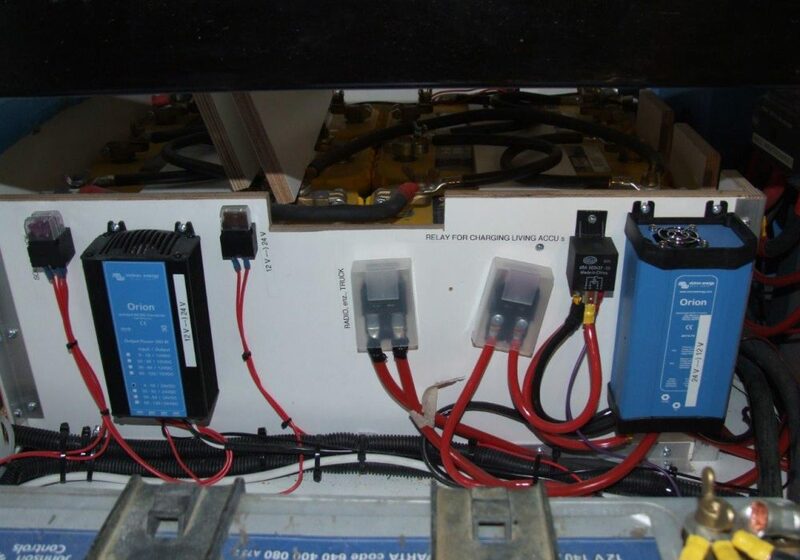 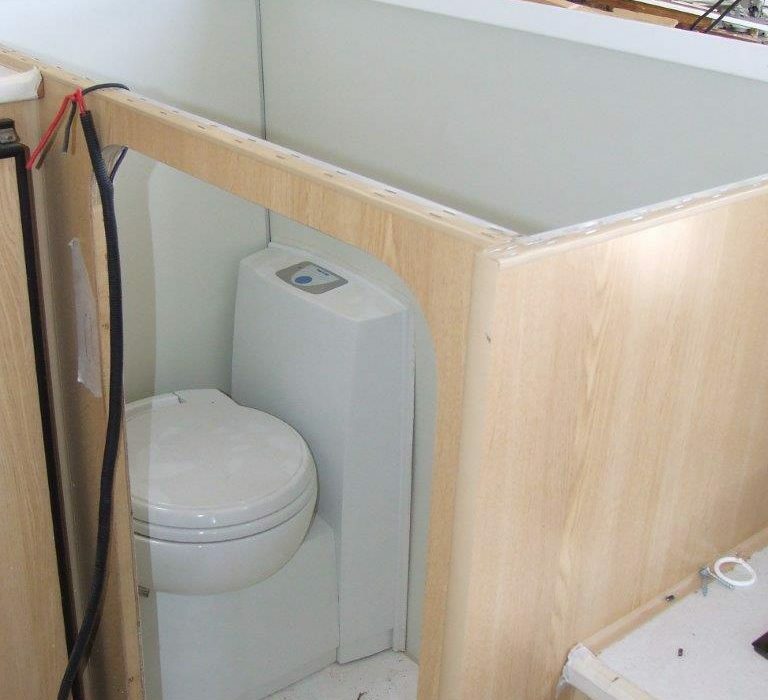 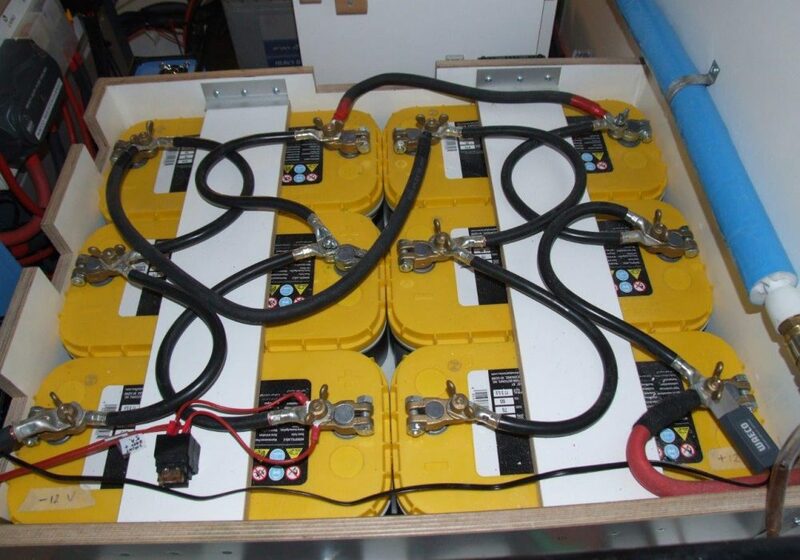 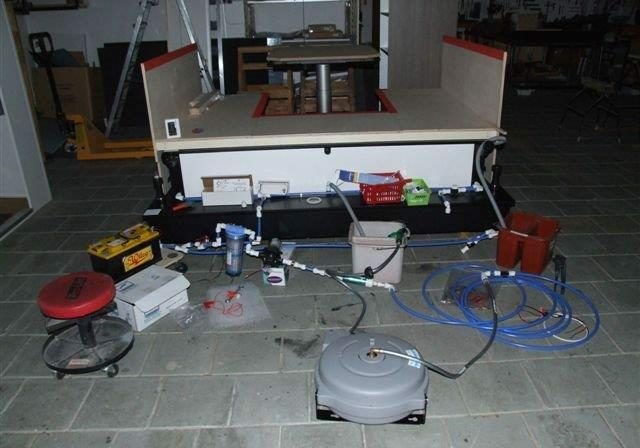 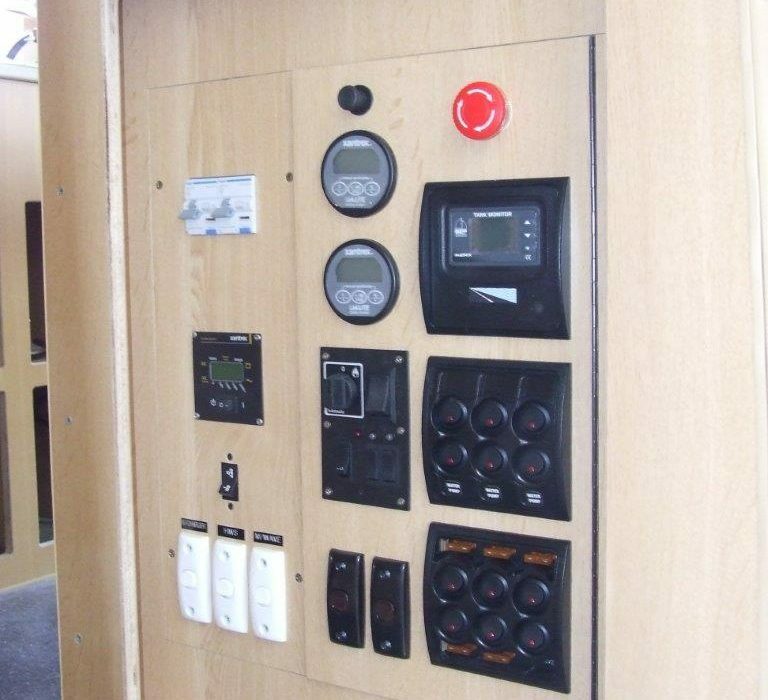 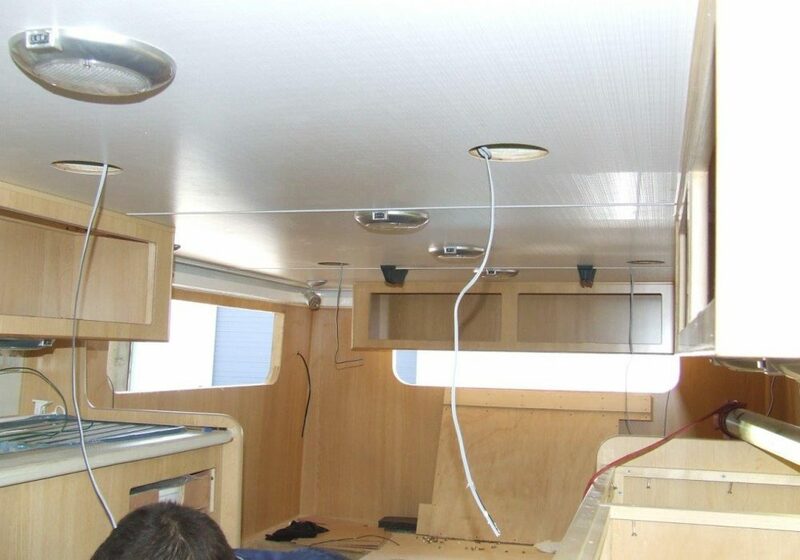 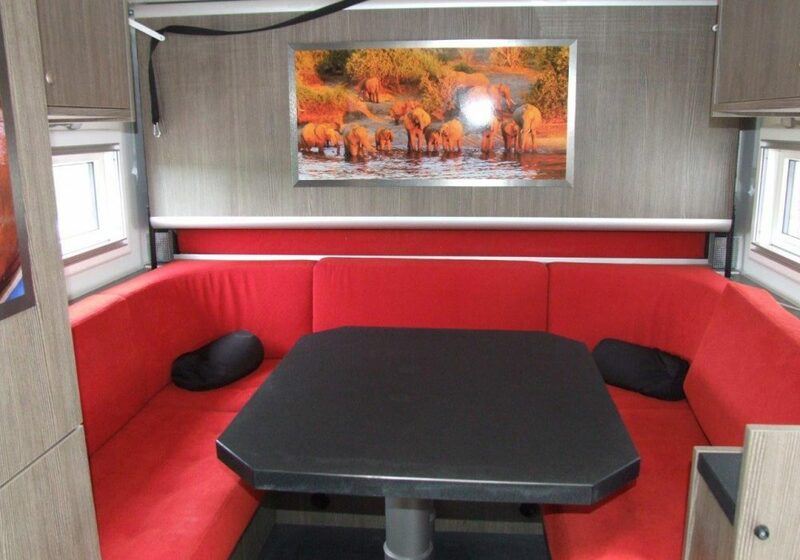 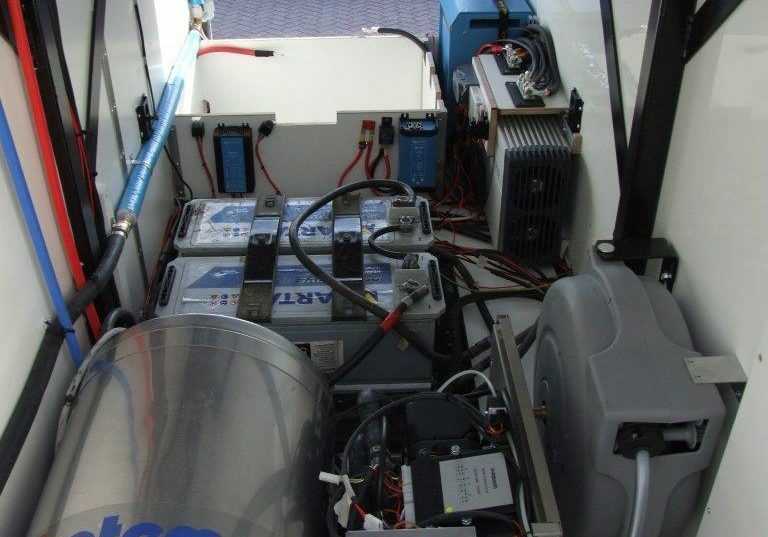 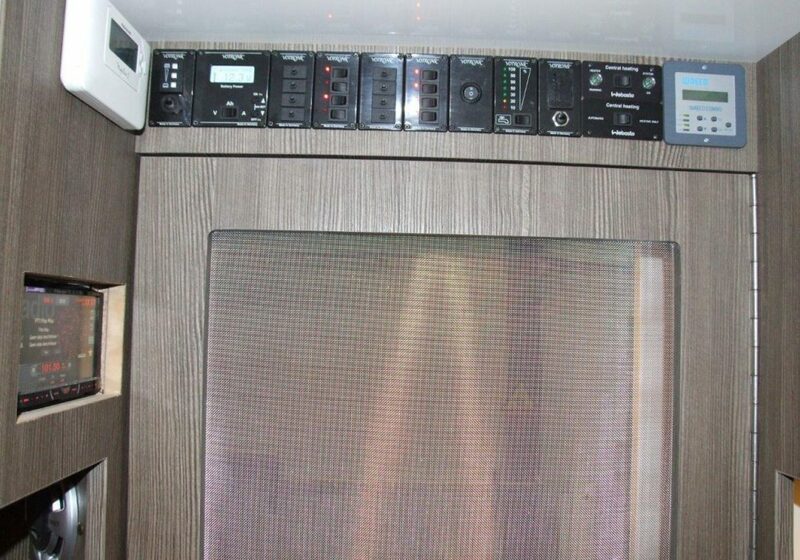 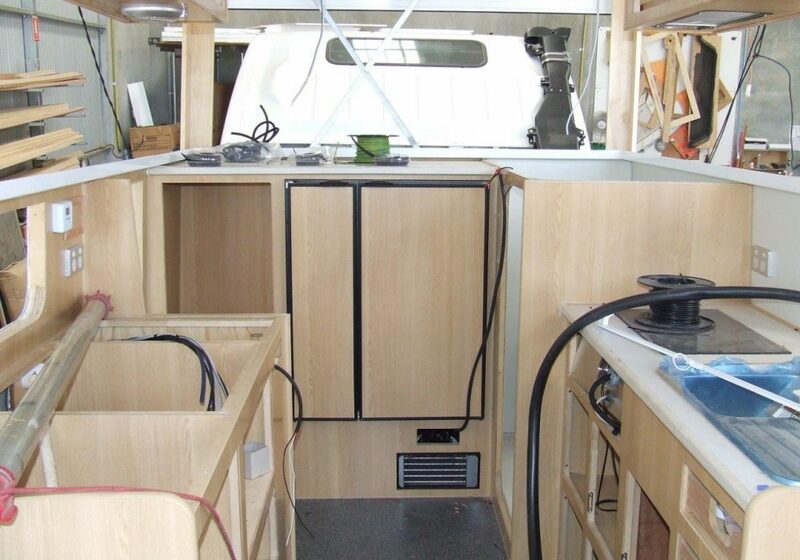 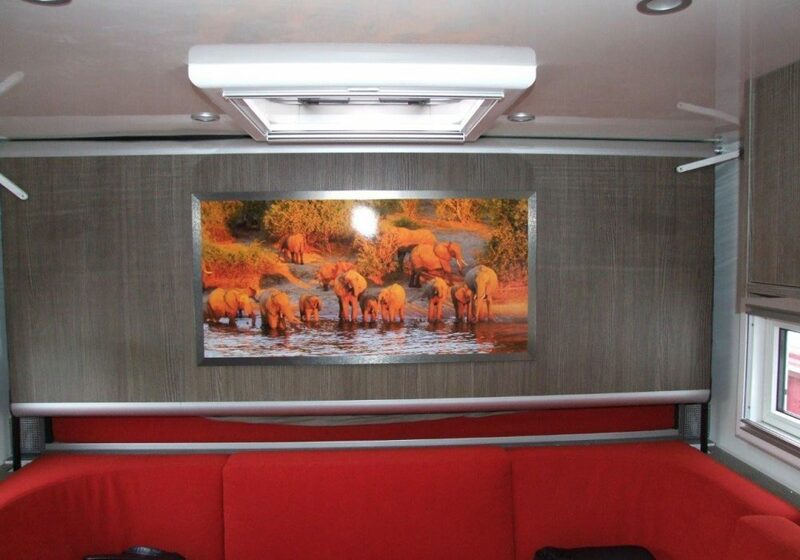 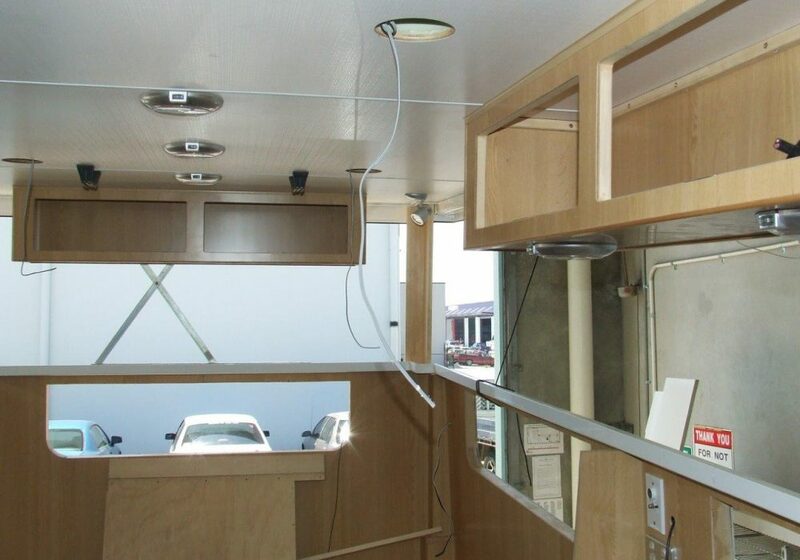 The solar panels and water filtration systems provide power and clean water when remote. 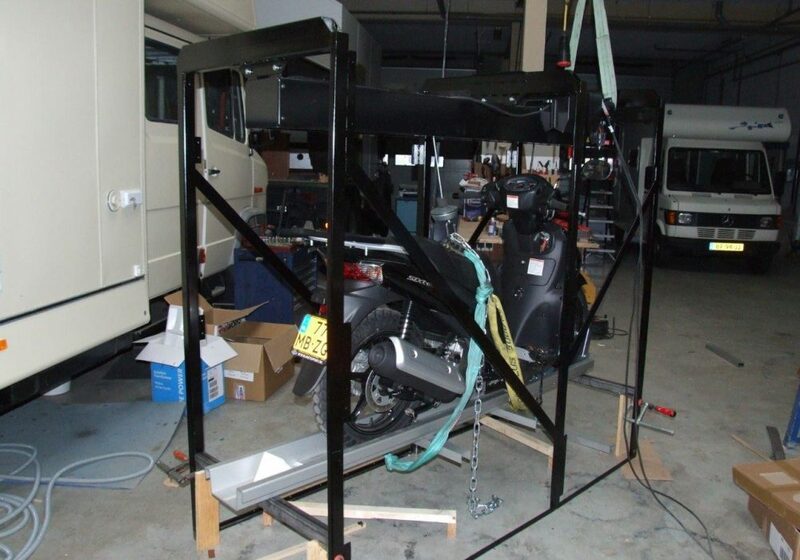 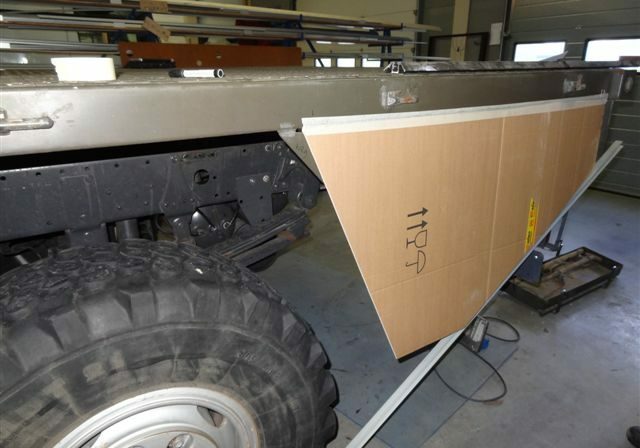 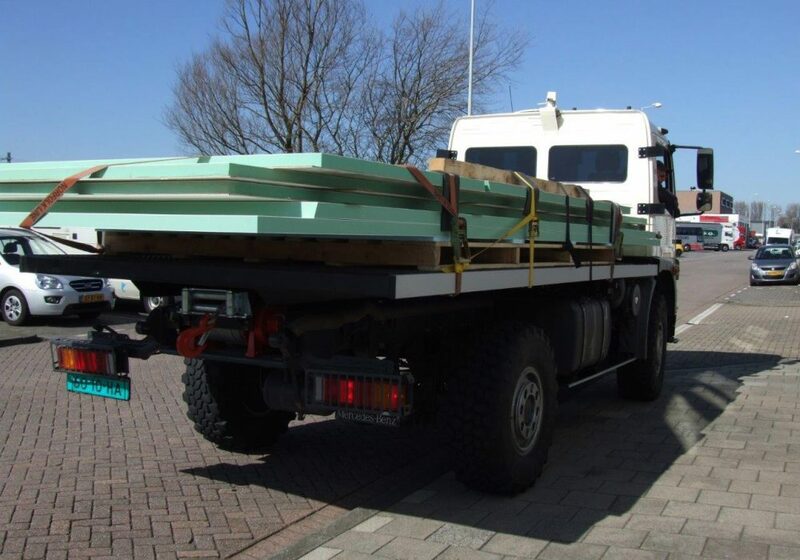 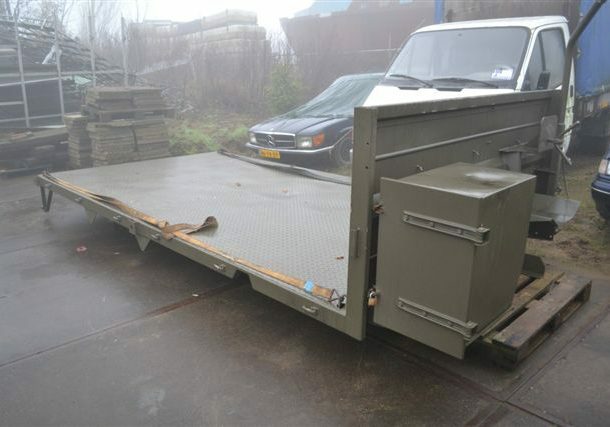 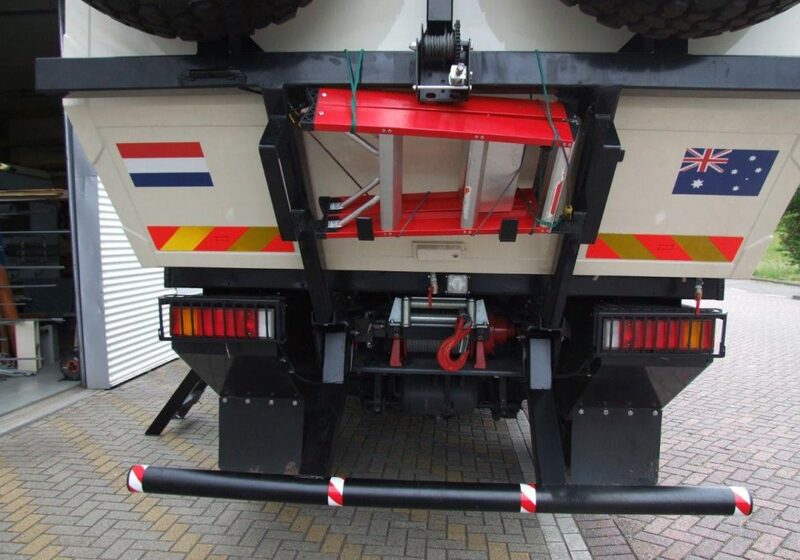 Protection bars front and rear and checker plate protect the truck when traversing Off Road and also while driving in the more exotic cities around Africa and South East Asia. 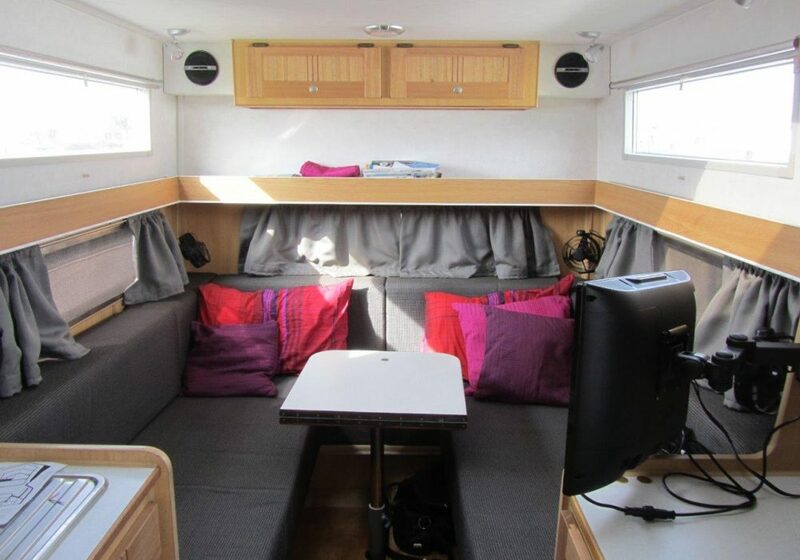 Outside entertainment area TV-DVD-SOUND SYSTEM-POWER. 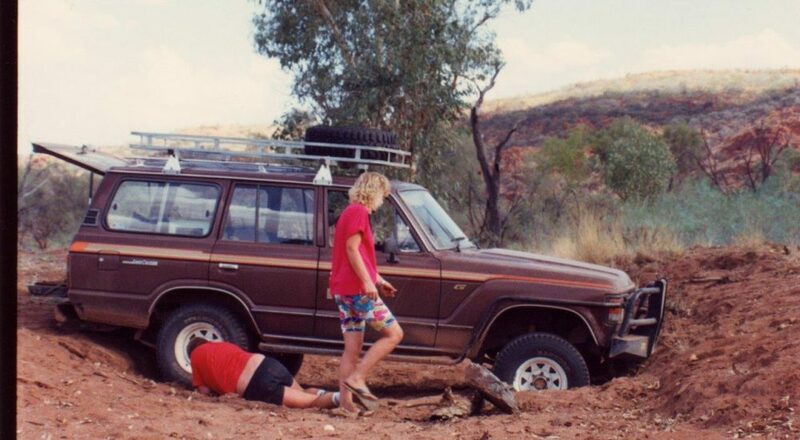 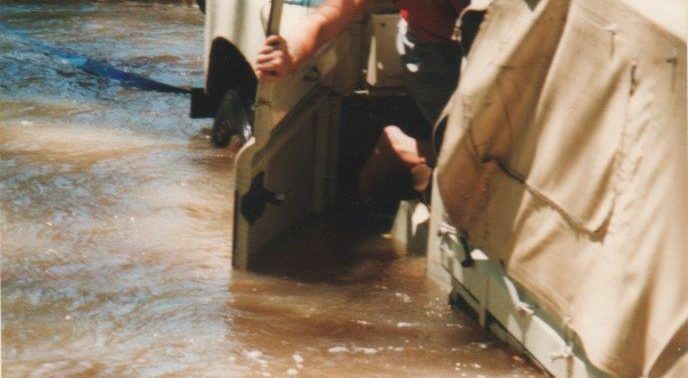 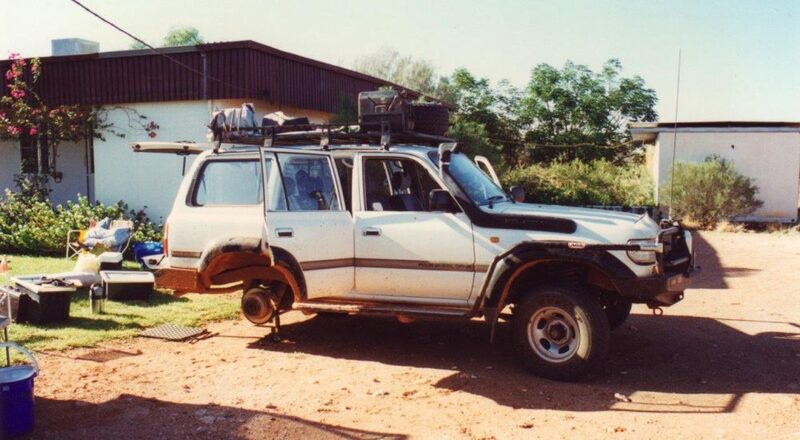 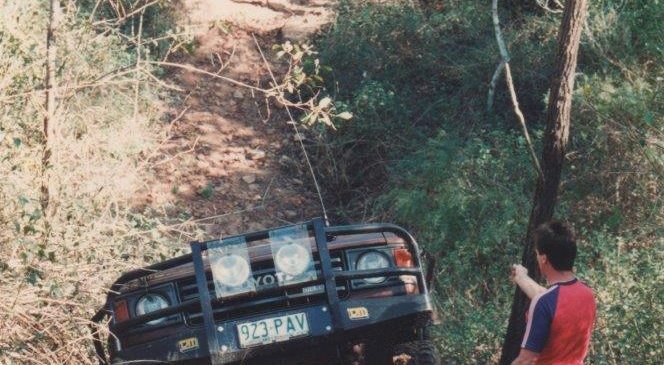 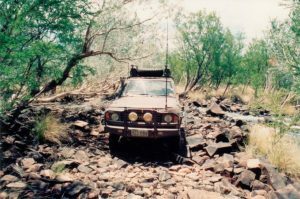 In Australia the name Land Cruiser had earned a strong reputation for its high performance on bad roads, manoeuvrability, durability and as one of the most reliable 4x4s available. 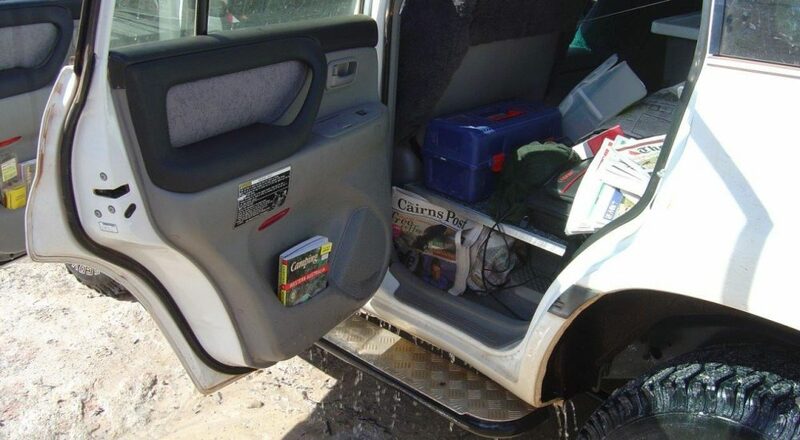 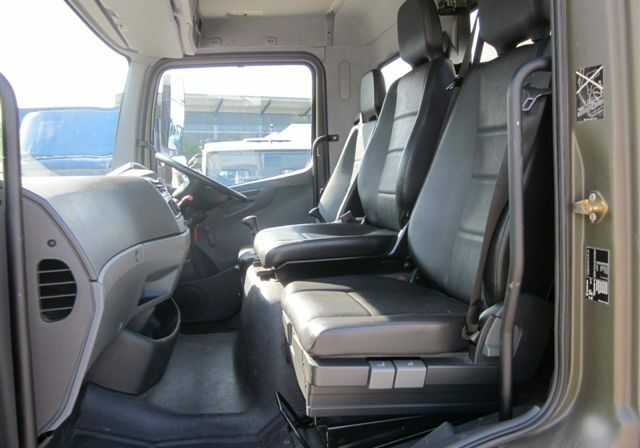 The interior was luxurious, with air-conditioning and an audio system. 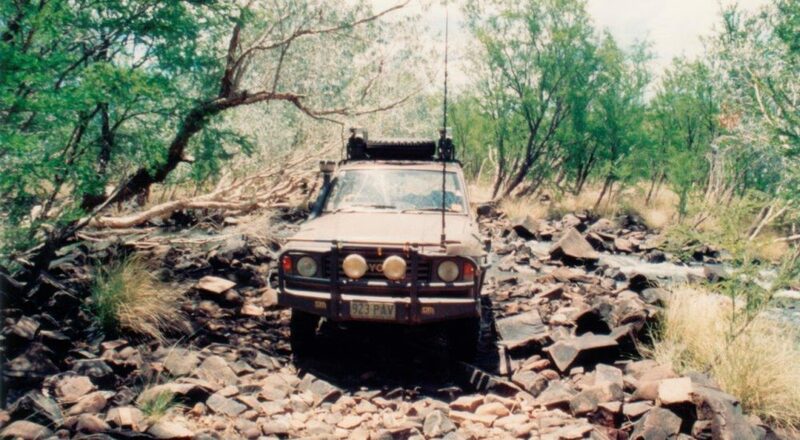 Worldwide the Landcruiser replaced Landrover and Nissan in organizations such as the UN, Foreign army’s and Local governments as domestically and overseas for rescue operations, as a relay vehicle for satellite broadcasting, but for many it also became a prestige SUV. 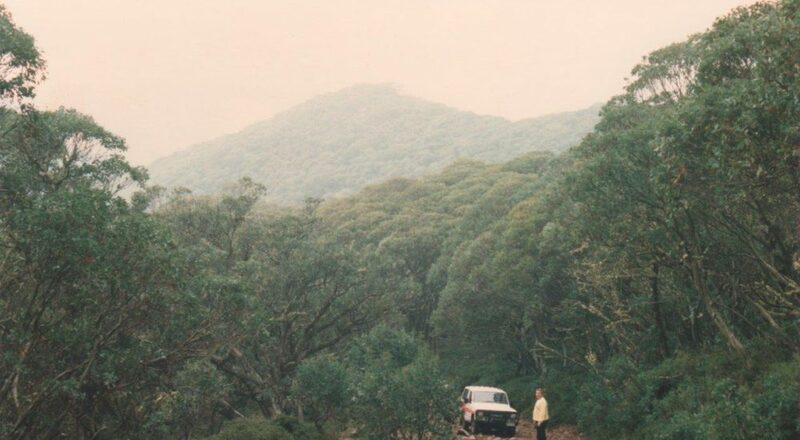 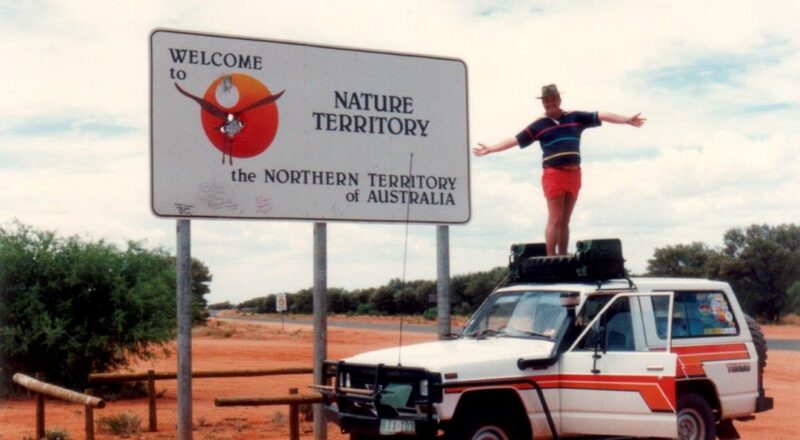 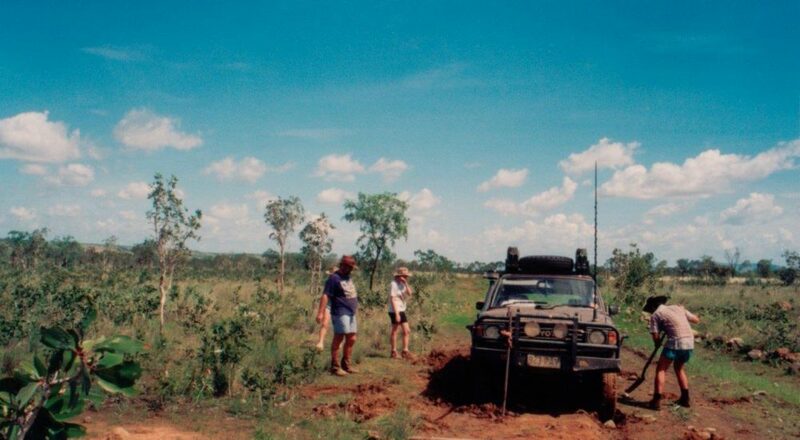 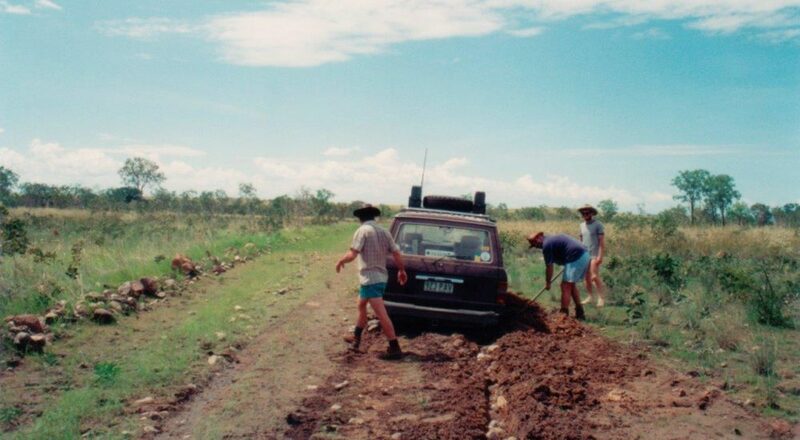 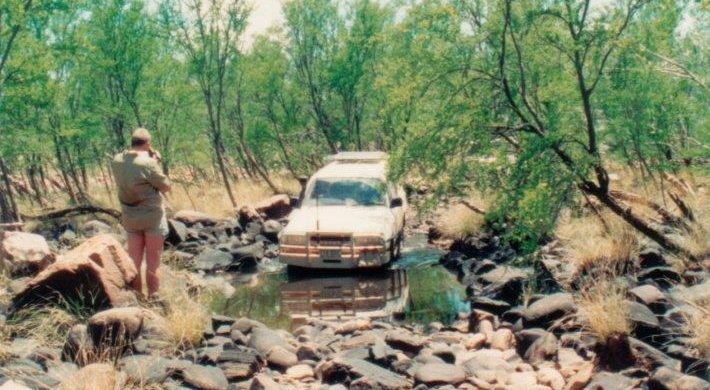 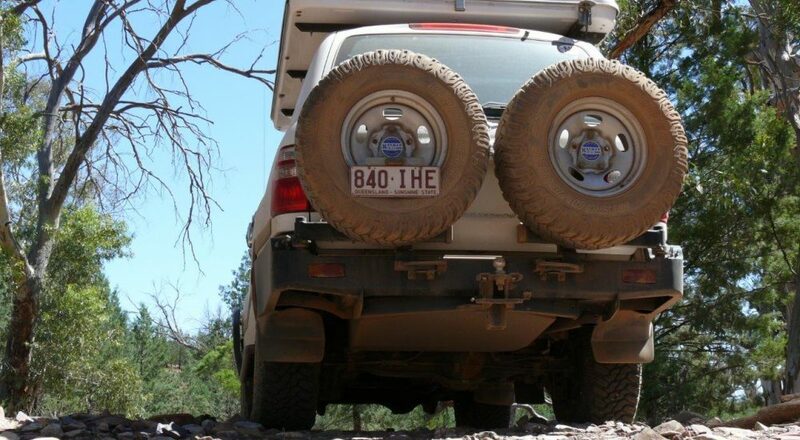 To meet Australia’s outback and other rugged areas, Toyota created the 105 series. 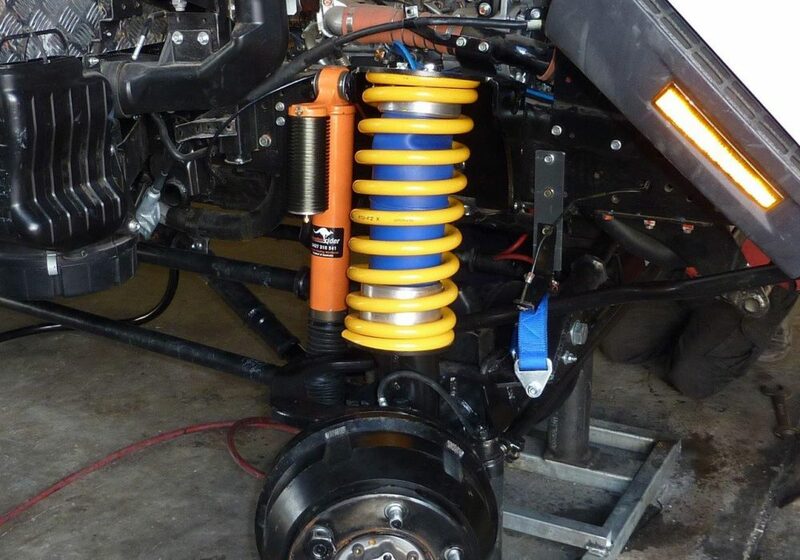 With rigid coil springs front and rear. 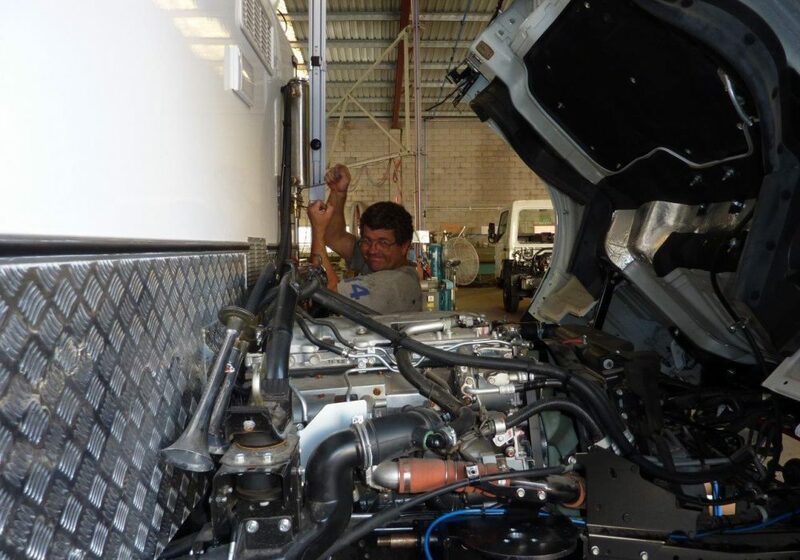 We decided to replace the engine with a 6.9 Turbo diesel Chevy add Diff Locks, Rock Crawlers, a Raised suspension and any other aftermarket item available at ARB. 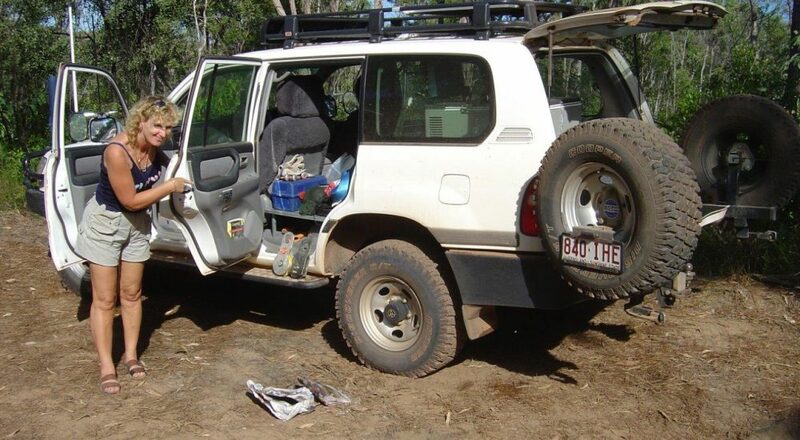 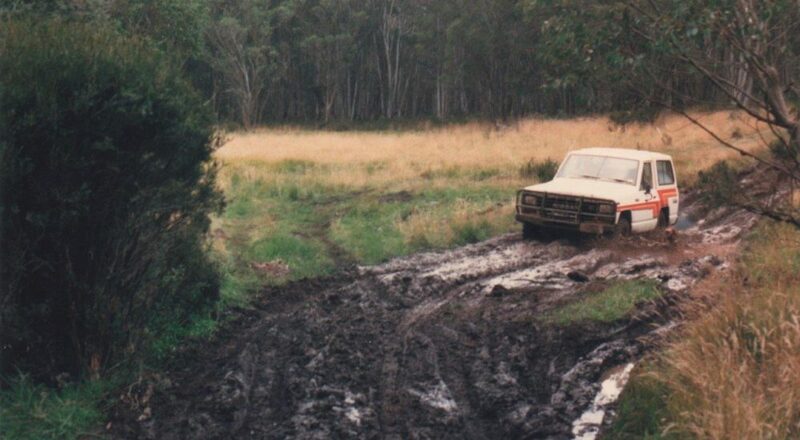 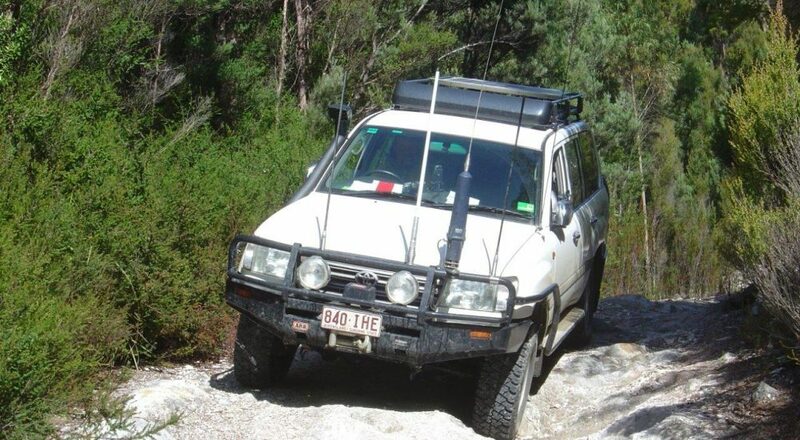 For us this became the best 4WD we have ever owned. 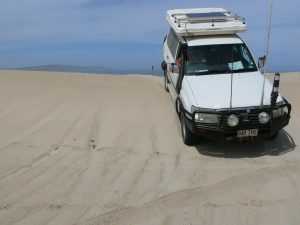 Weekend trips from where we live. 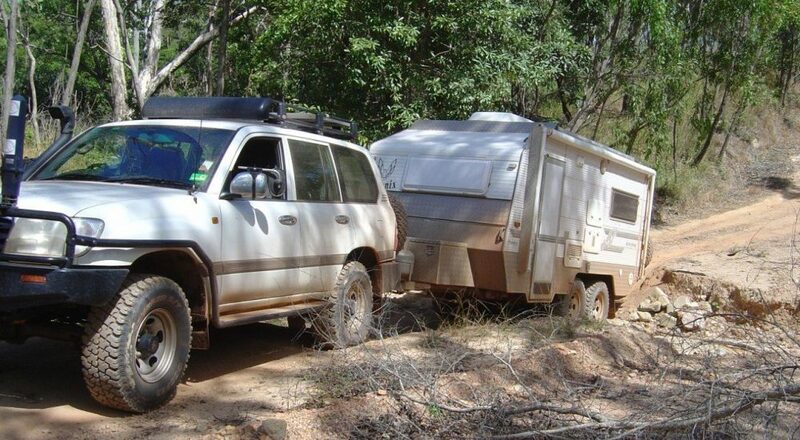 Lots of luxury compared to the old 60 series. 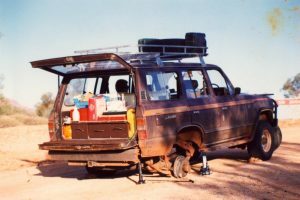 It looked and drove like a passenger style car. 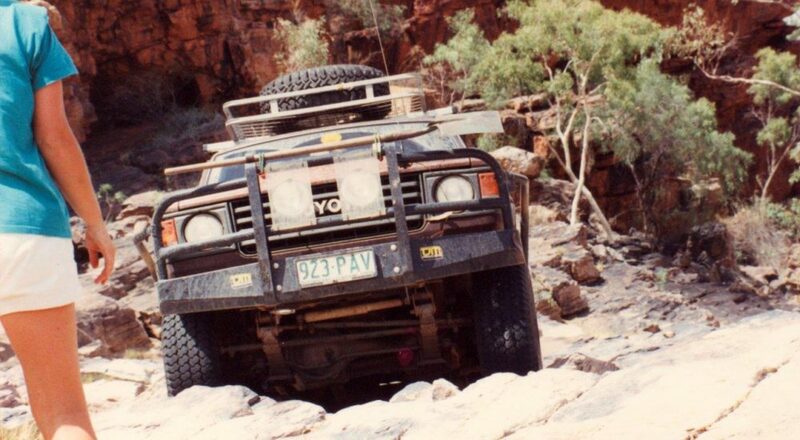 It had lost the traditional 4WD look. 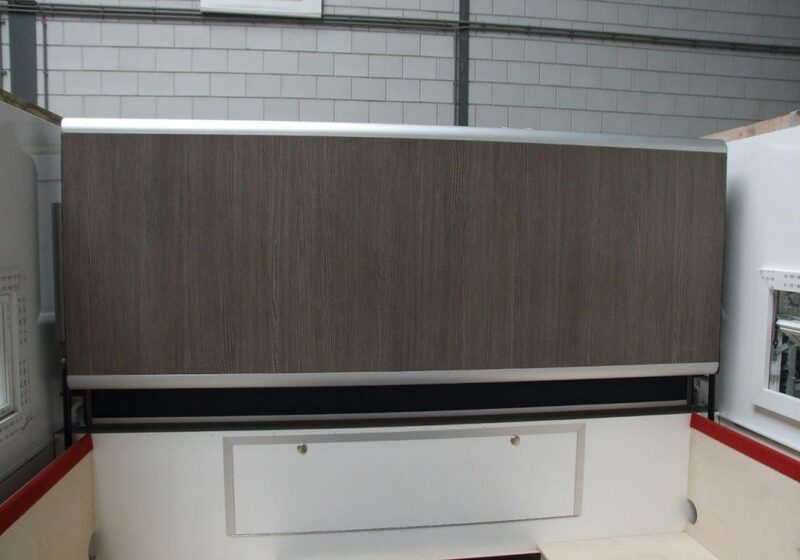 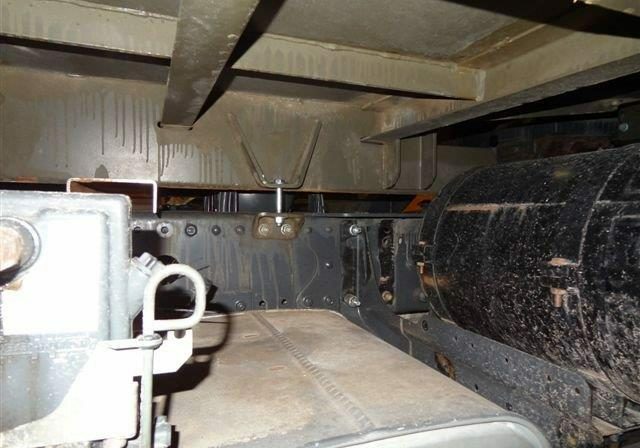 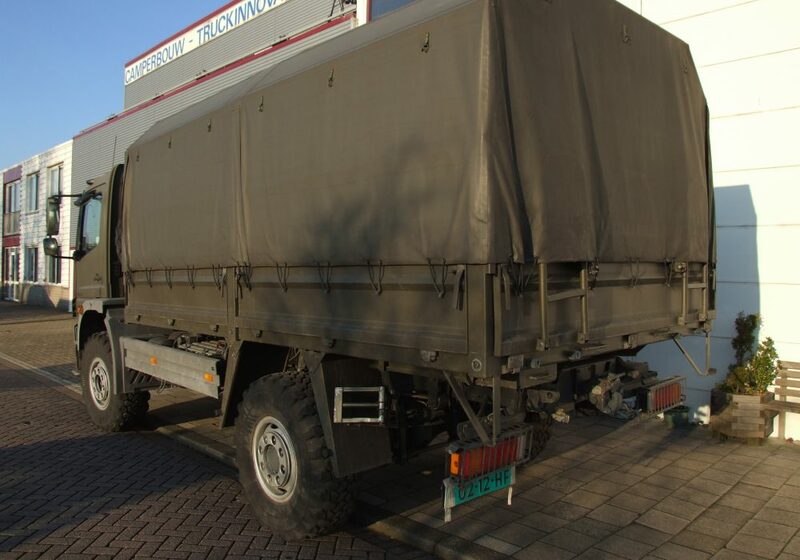 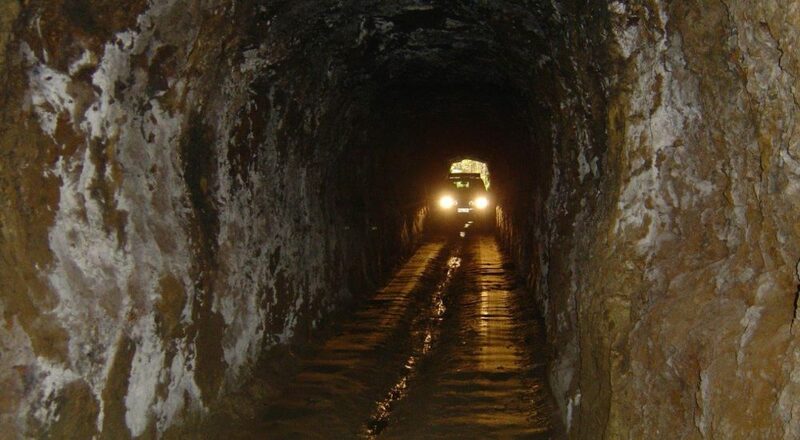 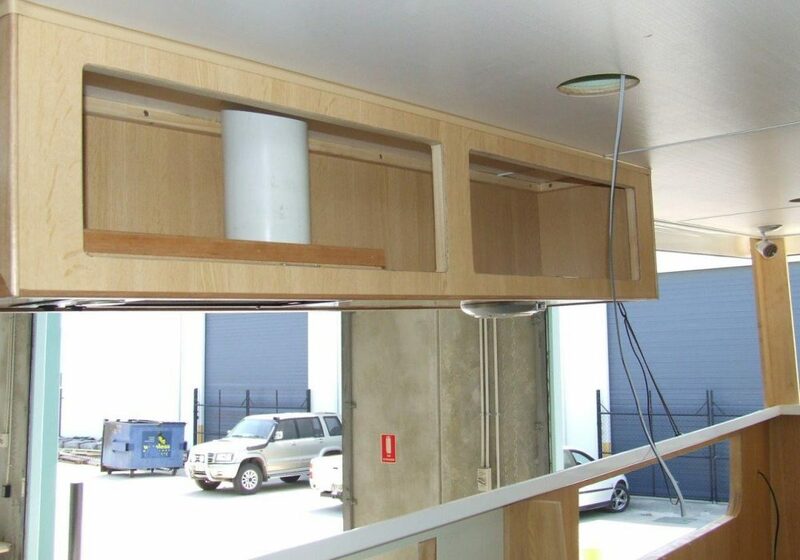 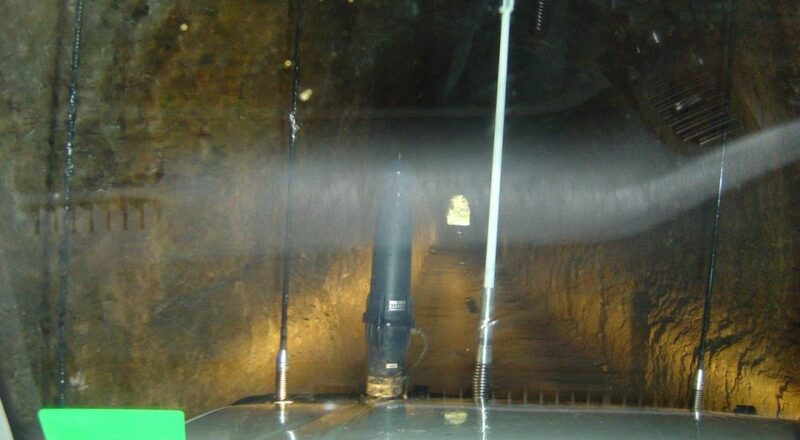 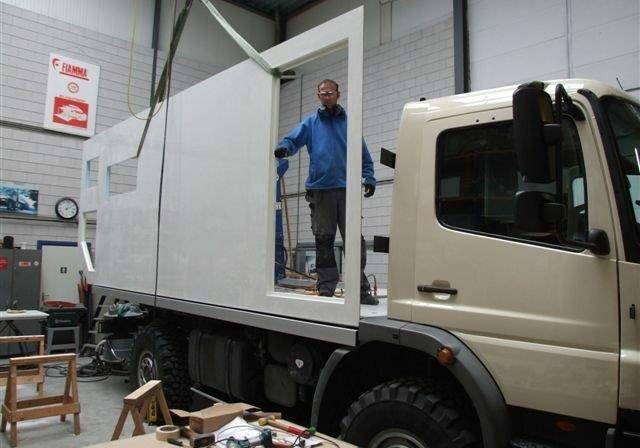 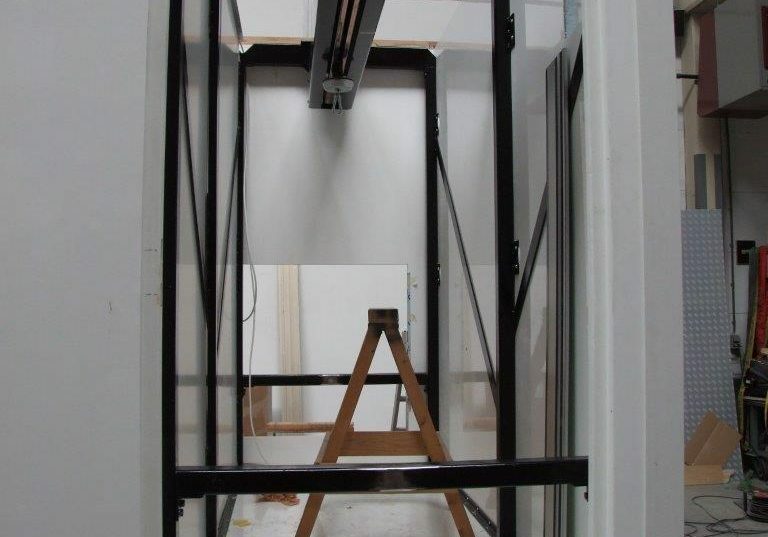 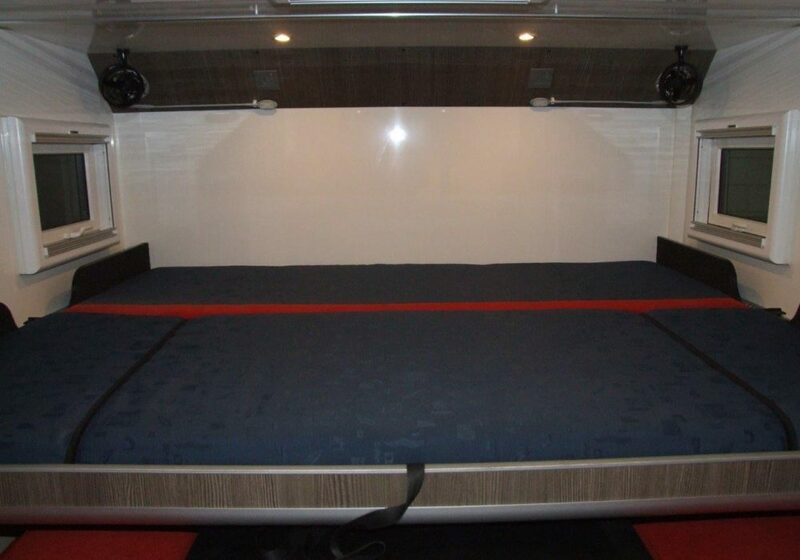 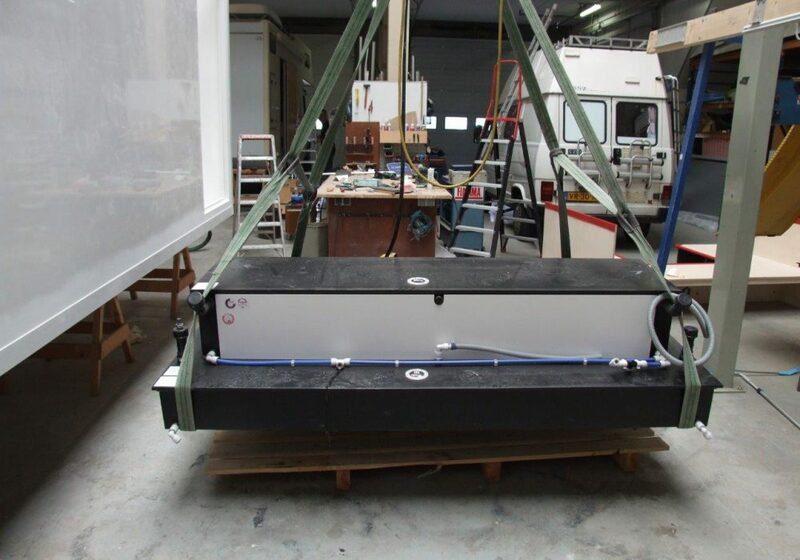 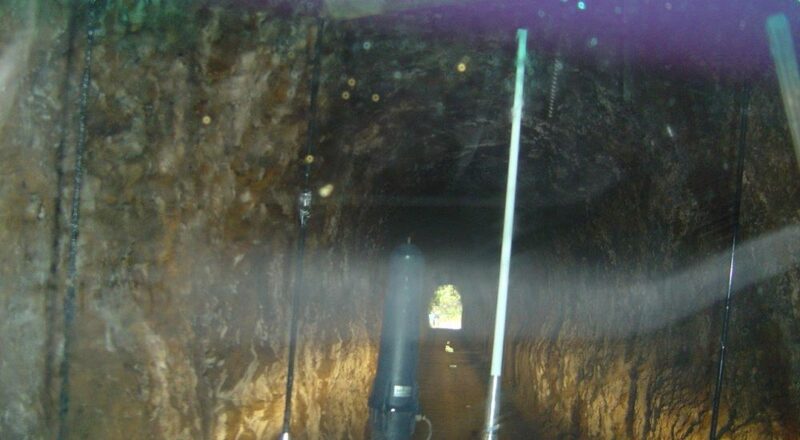 A large vehicle at 5 meters in length and 2 meters wide. 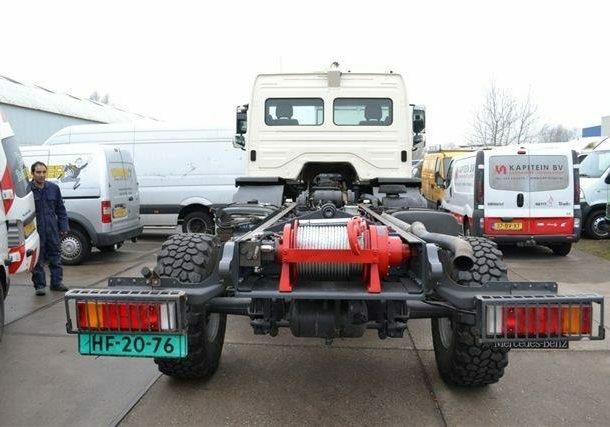 Great Diesel Turbo Engine. 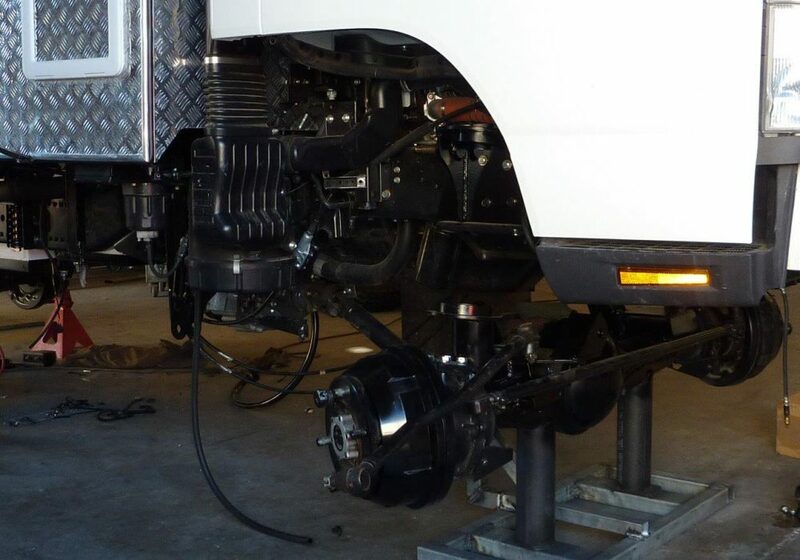 The 60 series leaf springs were replaced with coil springs in front and rear improving driving comfort and steering compared with the 60 series. 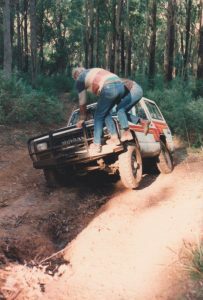 Despite the perfect on road performance the real problem area was the the low side-step and a long rear overhang, making the body scrape the ground in Off Road conditions. 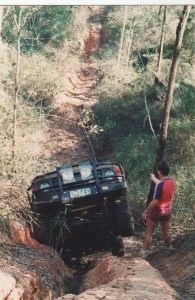 However once the body lift, Diff Locks, Rock Crawlers and after-market suspension was all fitted a great Off Road vehicle going anywhere and with lots of space for extended remote travel. 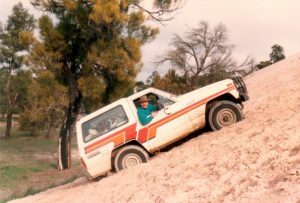 After the Toyota 40 series came the Toyota 60 series in 1980 and this changed the general opinion of 4WD vehicles in Australia. 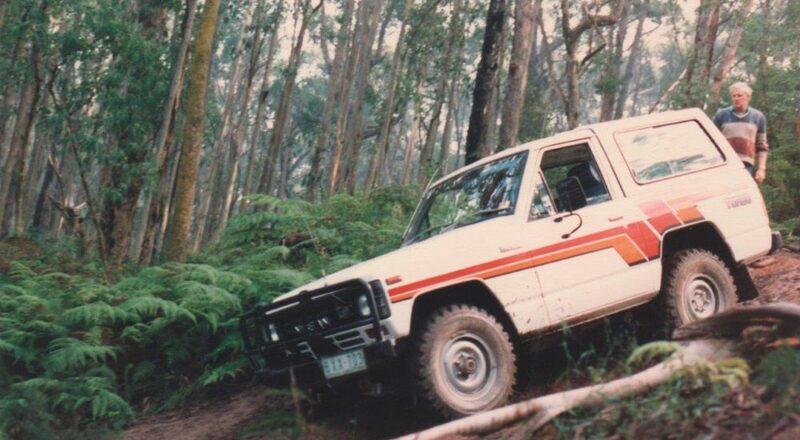 The 40 series were everywhere, especially after the new engines introduced in 1979. 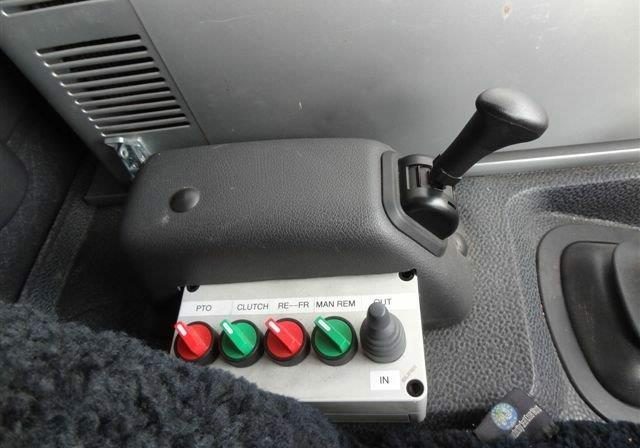 A minor change was introduced in 1982. 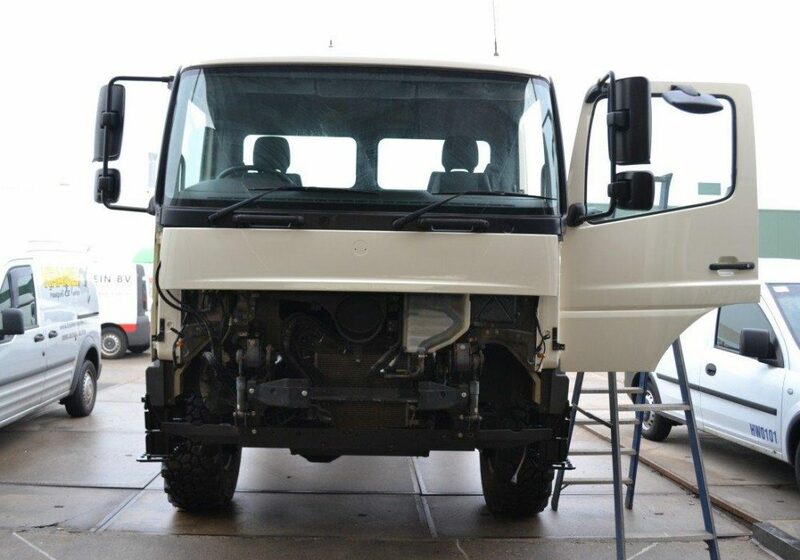 The major feature of this change was the appearance of the HJ60 with a 6-cylinder 3,980cc 2H-type diesel engine. 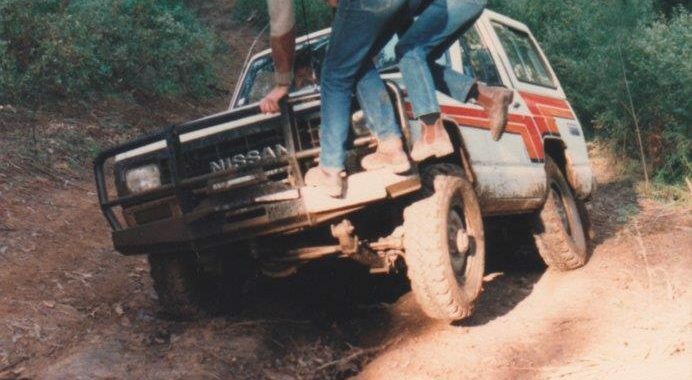 Like in our Nissan MQ Patrol, the suspension in the 60-series was not the best but after we installed an ARB after market package, diff locks and rock crawlers it became an off road beast. 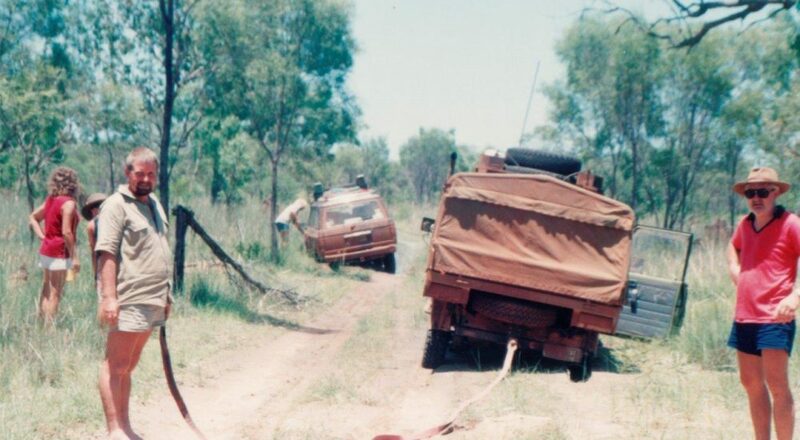 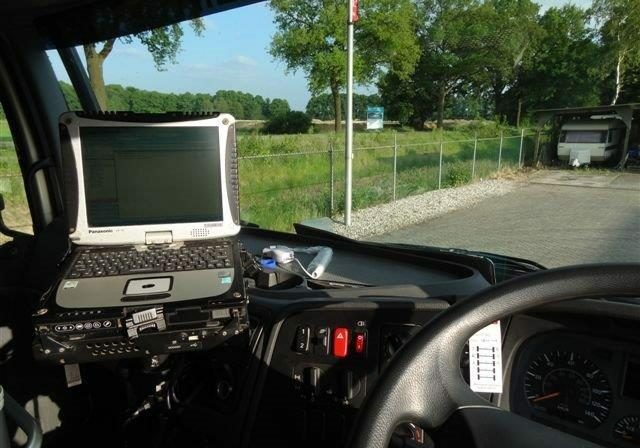 Never Made it home that night, overnight on the main road. 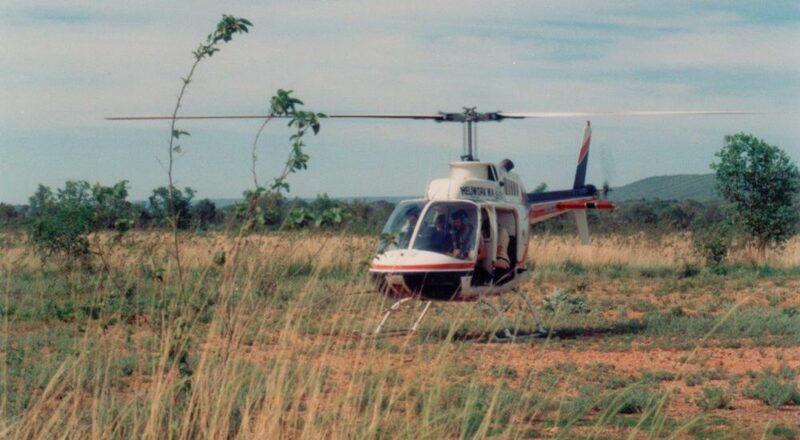 After we blew 3 tyres while off road helicopter delivers the 3 new tyres. 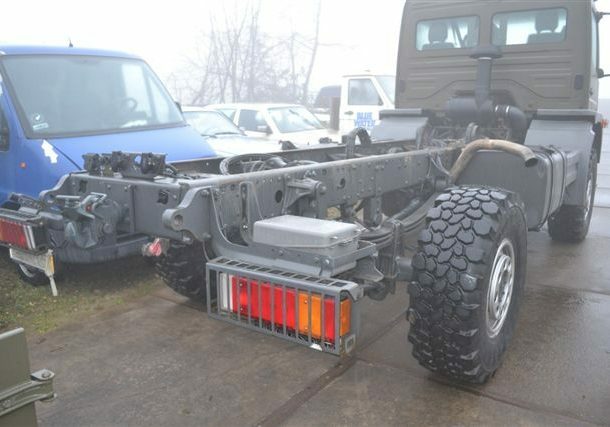 This car has been sold with the same type of chassis since 1951 when we purchased this model in 1983. 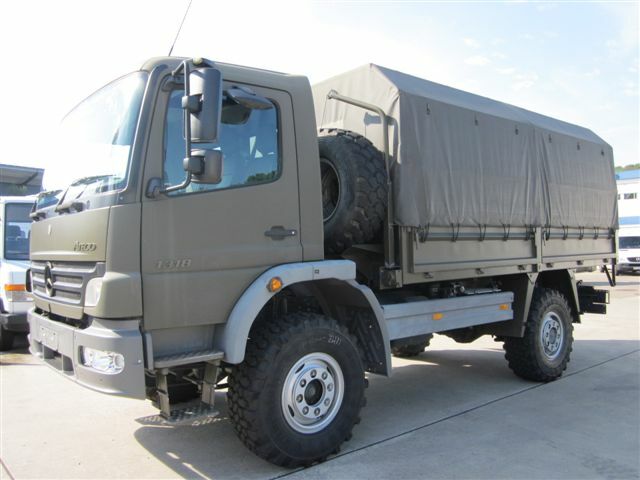 Used by many army’s in the world it looked like a good buy. 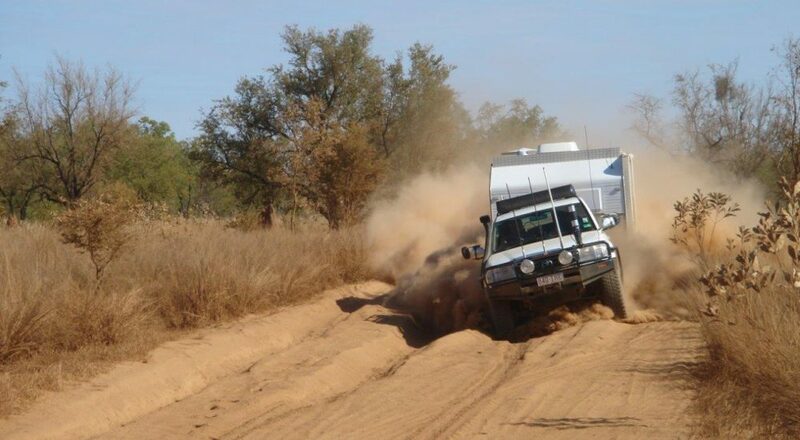 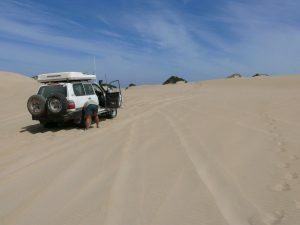 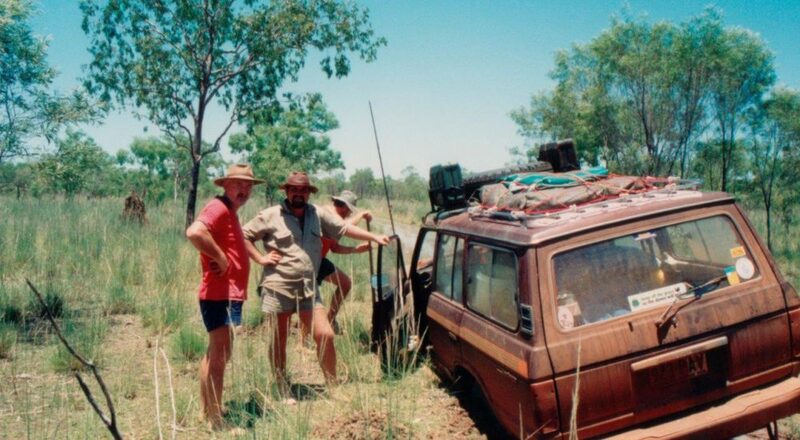 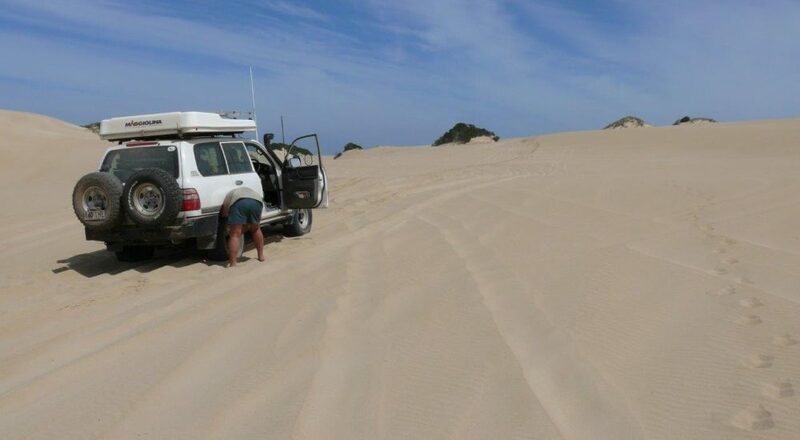 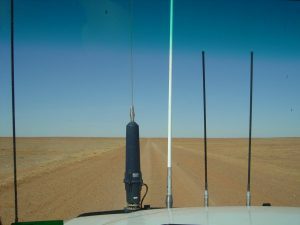 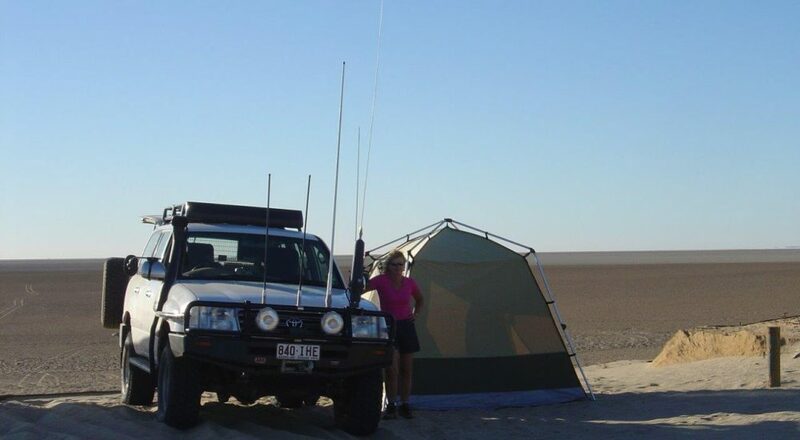 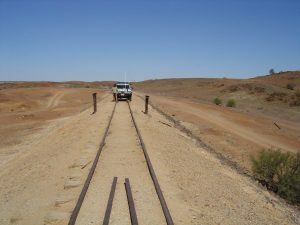 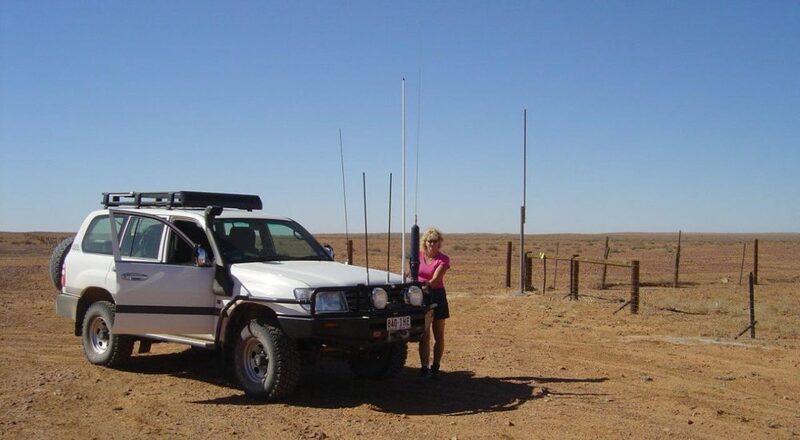 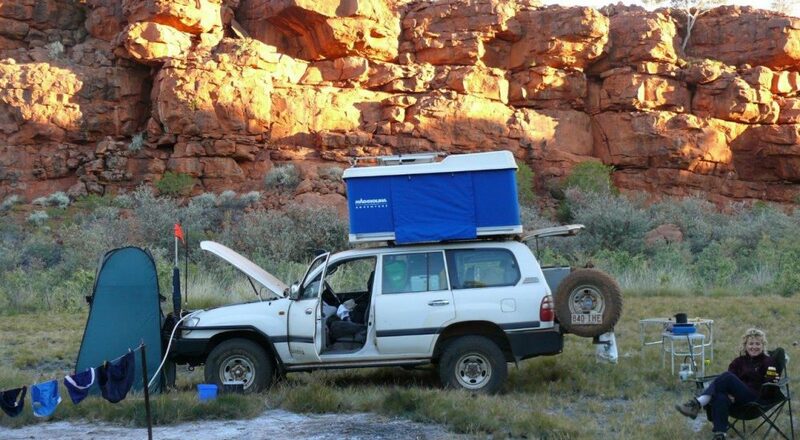 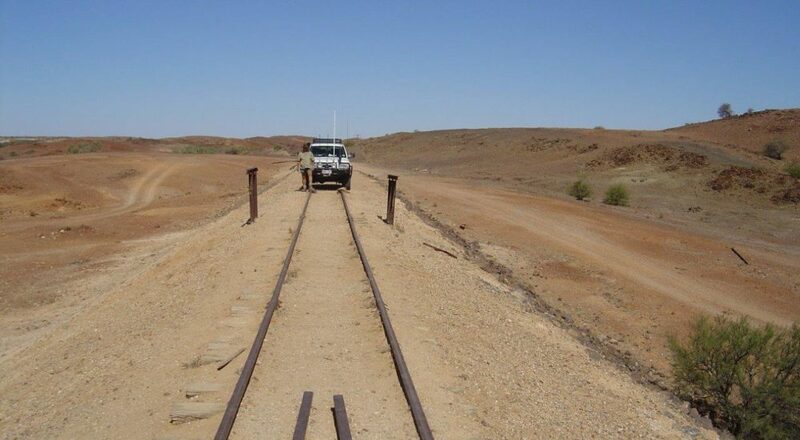 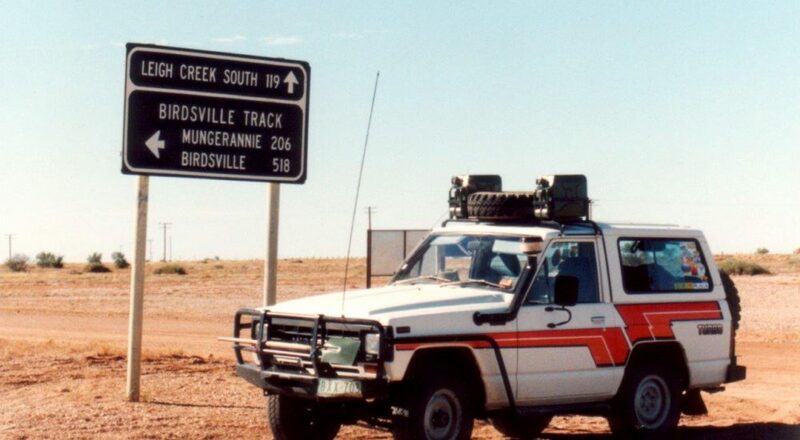 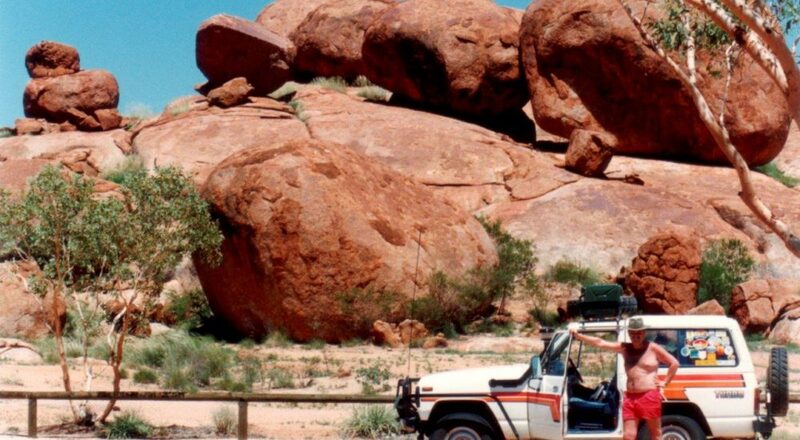 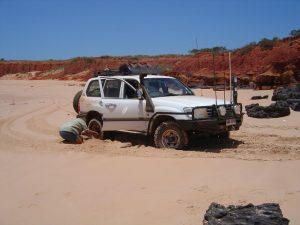 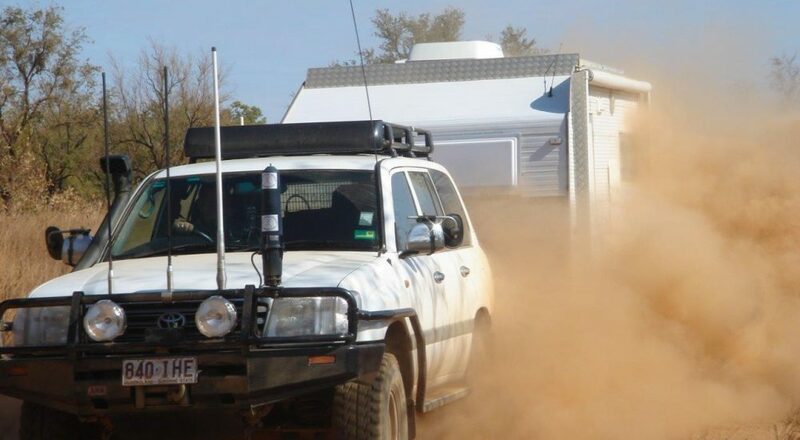 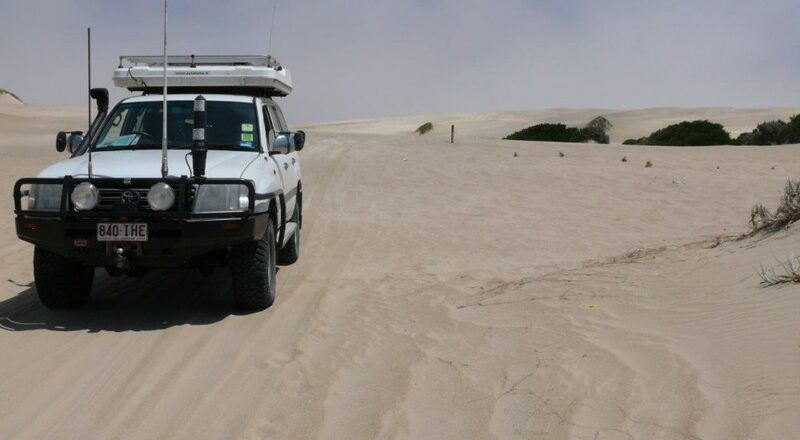 (It was) At the time and also in 2012 it was claimed that the Nissan Patrol was the first vehicle to cross the Simpson Desert, but others are not so sure. 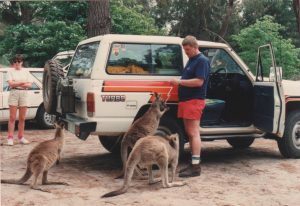 It came as a 4 speed manual and with leaf springs and ours also had powersteering and the classic blue interior trim and vinyl. 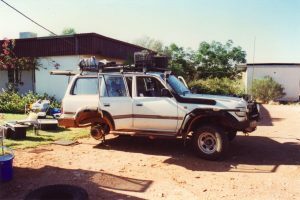 The same model was sold in the Middle East, parts of Africa and the Far East as a Datsun Patrol. 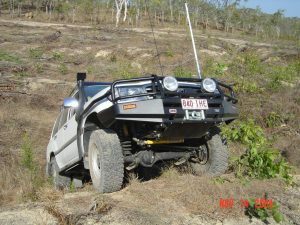 It was a super strong car, with a truck sound with a constant engine roar and for its time had incredible off road capabilities. 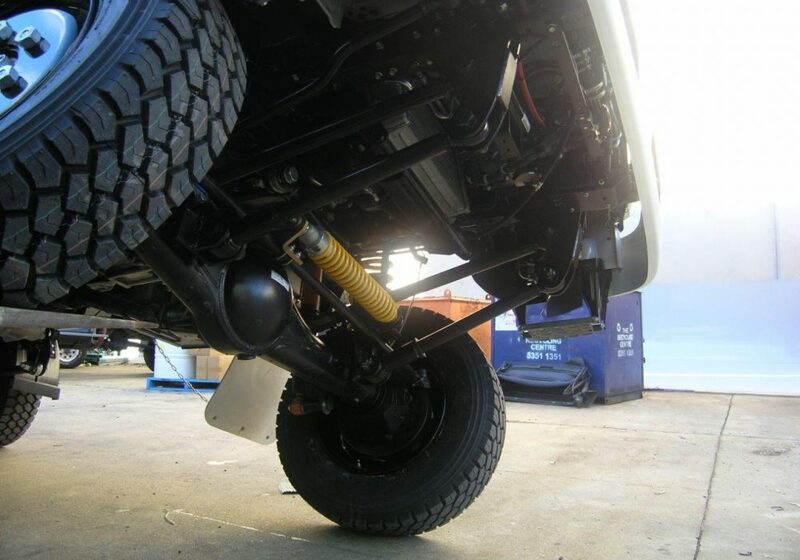 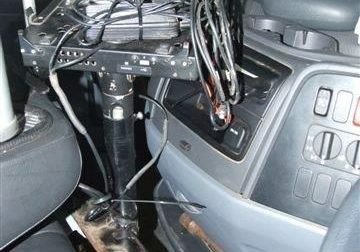 The suspension was very rough and very basic, but able to tackle anything. 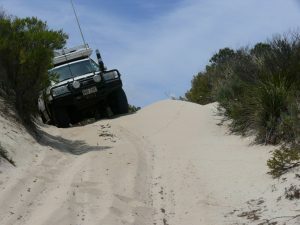 On road and ride and handling was rough and nothing like todays sedans, bouncing aroud over every hump and lots of noise. 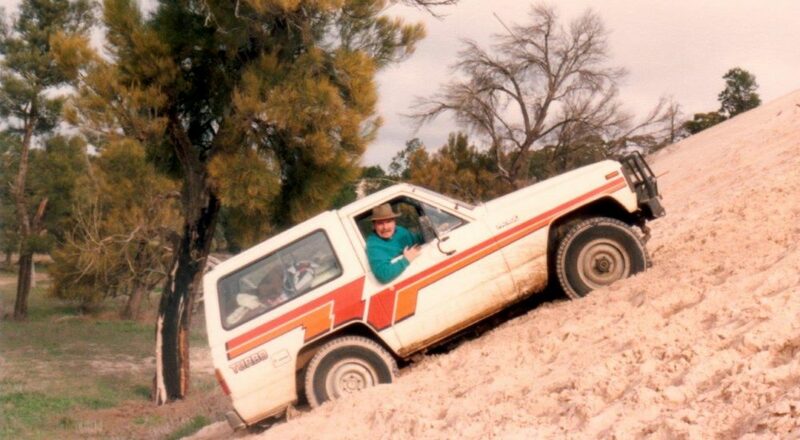 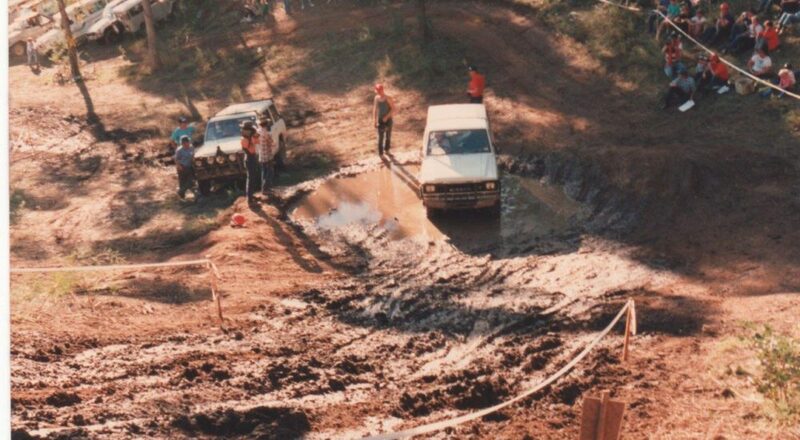 A great car to learn off road driving and this is exactly what the boys of the Yarra Valley 4WD club did when I joined the club. 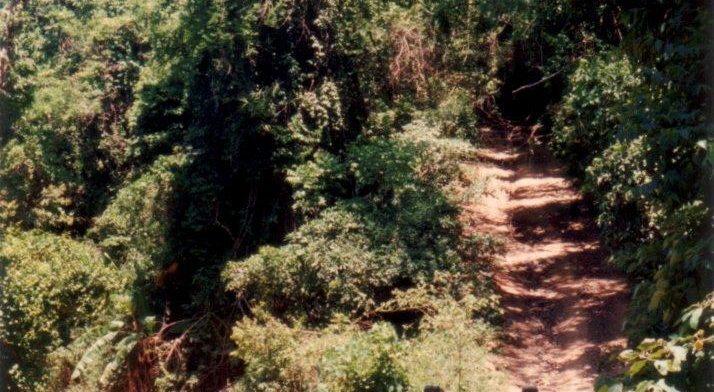 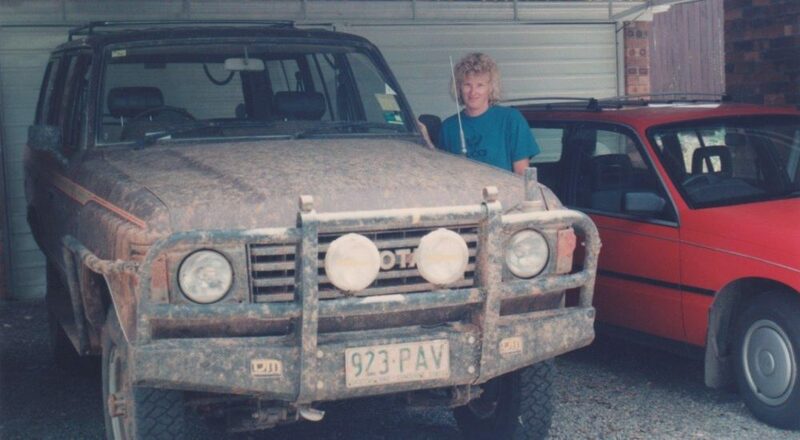 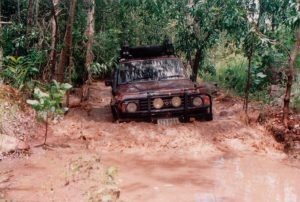 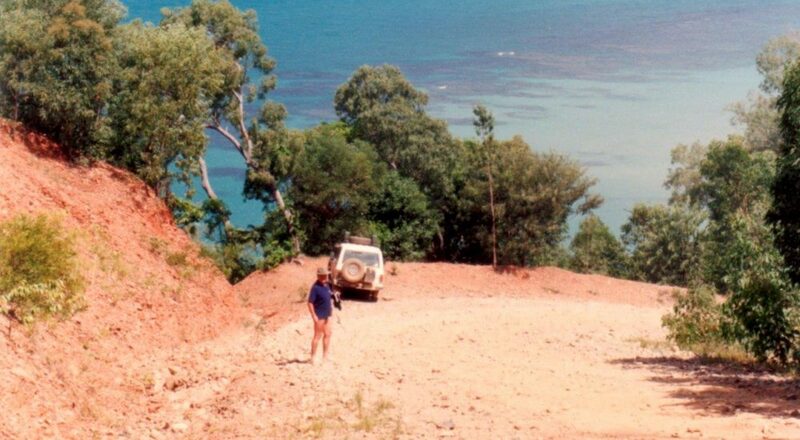 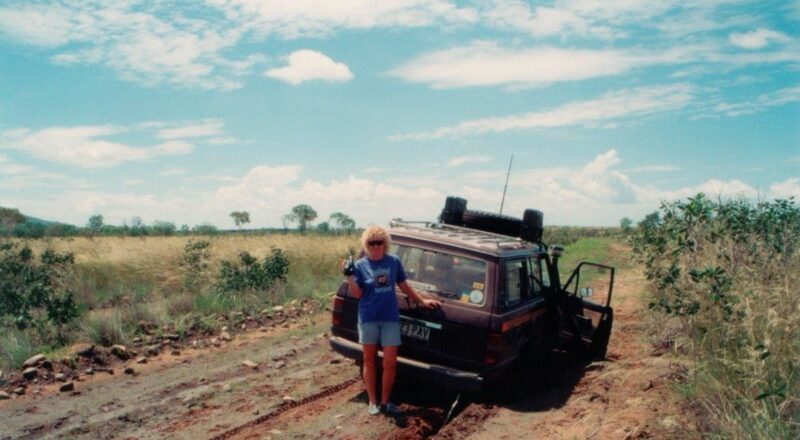 It was the start of a life long love for Off Road driving resulting in a around the world trip which started in 2009 and is still going. 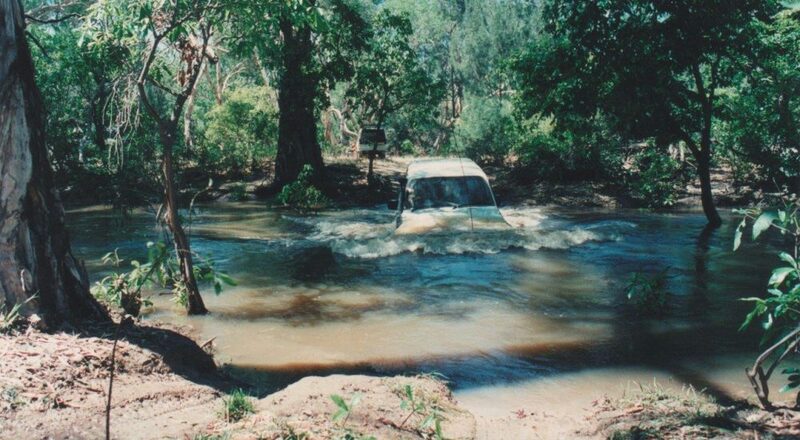 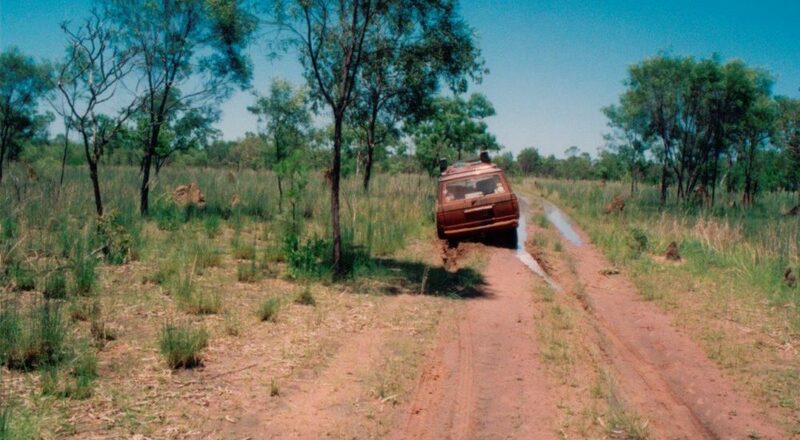 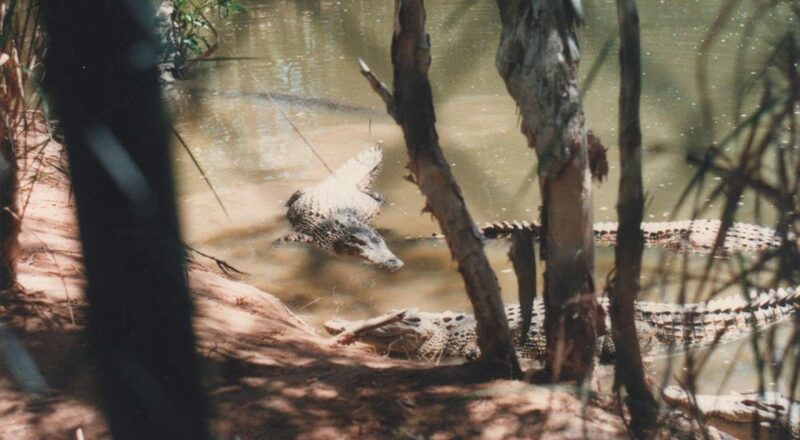 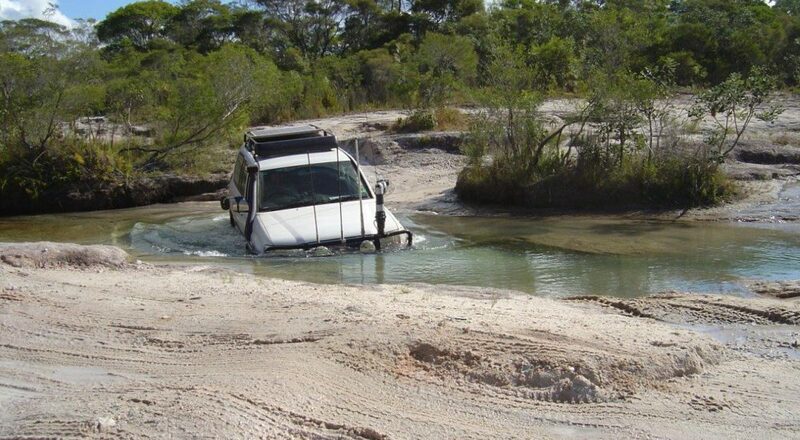 Doing a friend a favour bringing his truck back to the farm, stuck in the creek be aware crocodiles. 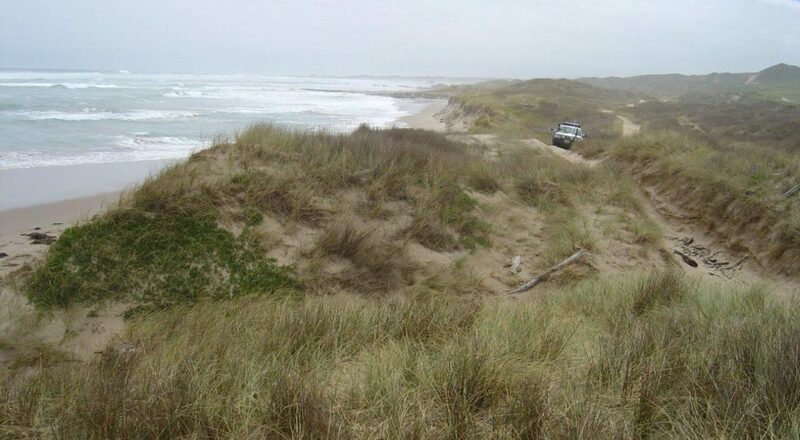 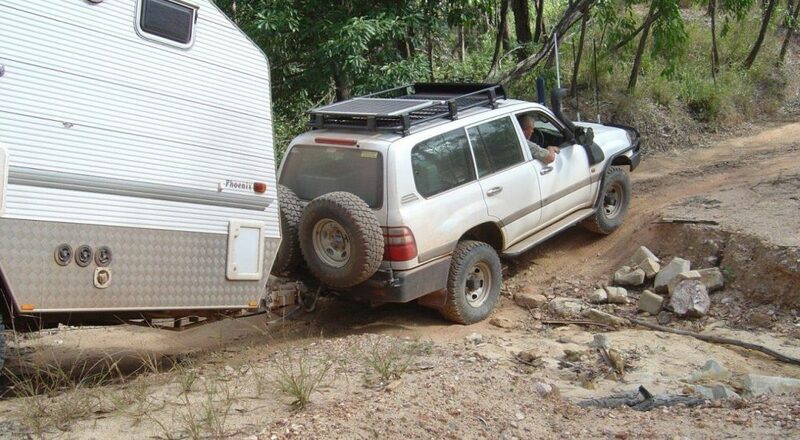 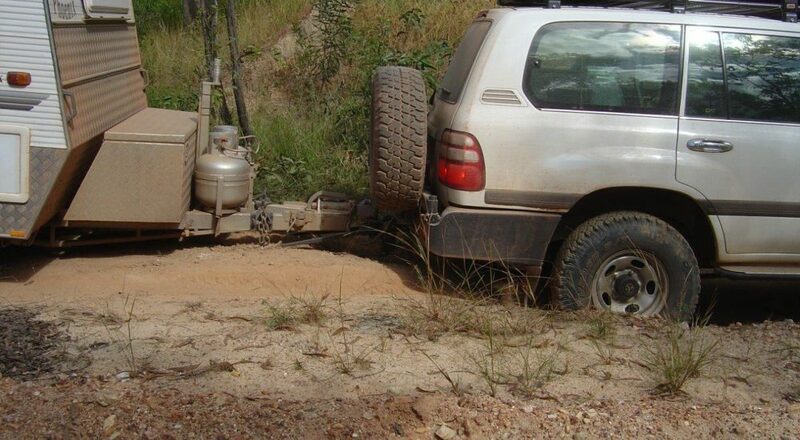 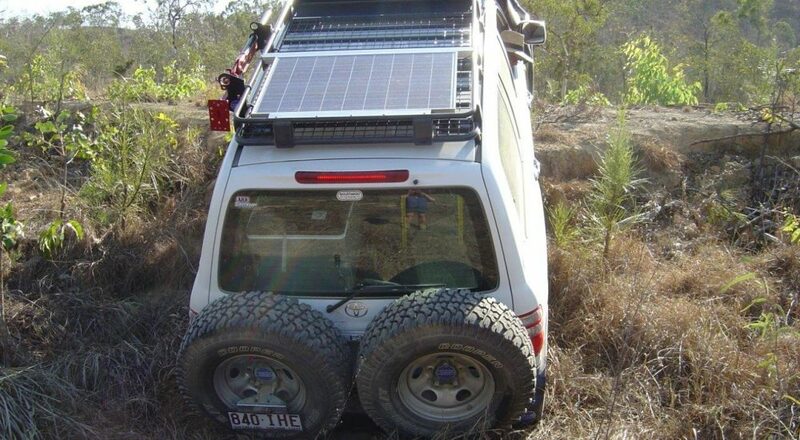 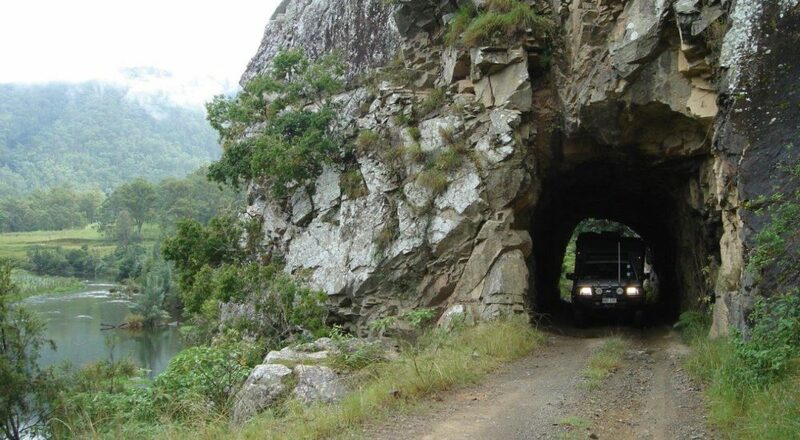 Nothing beats the off road capability of a Toyota Land Cruiser or a Nissan Patrol. 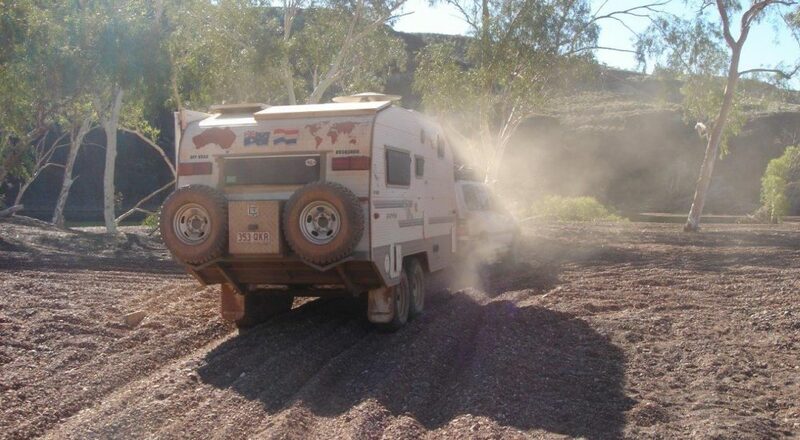 Toyota Landcruiser parts are available worldwide.